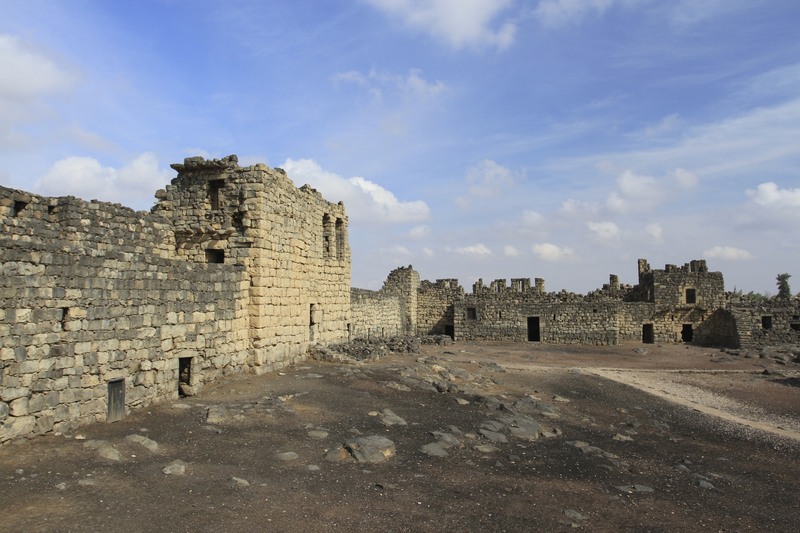 Ajlun Castle, Qal’at ar-Rabadh in Arabic, sits towering above the surrounding countryside; a dominating presence that was once part of a chain of castles that acted as a counterweight to the Crusader kingdoms to the west. 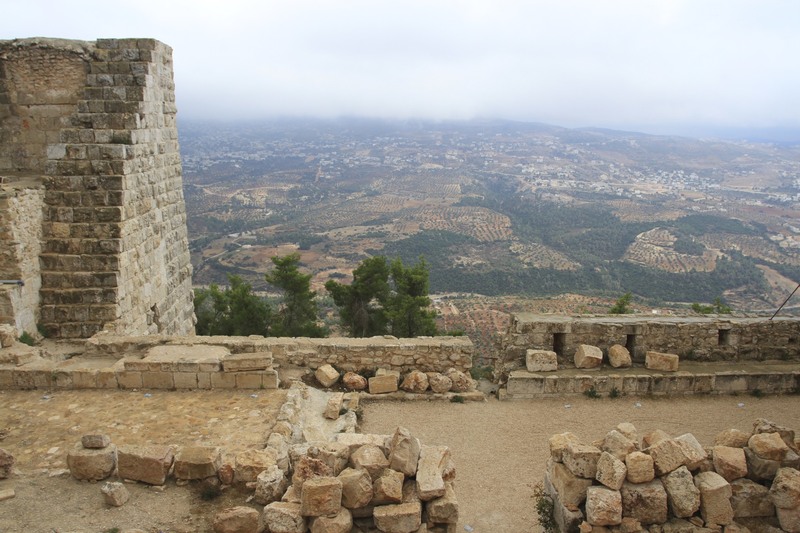 It has commanding views over the Jordan Valley, and sits directly across the River Jordan from the Crusader fortress of Belvoir. 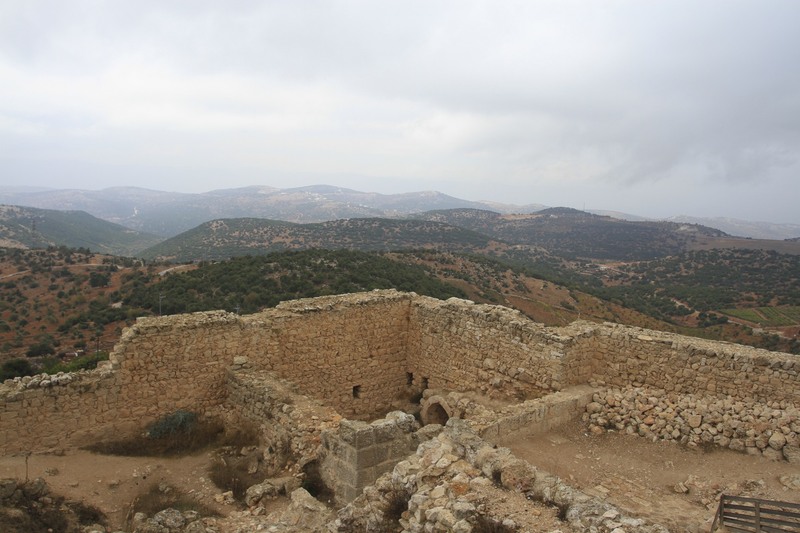 Karak Castle to the south posed a direct threat in the 12th Century. 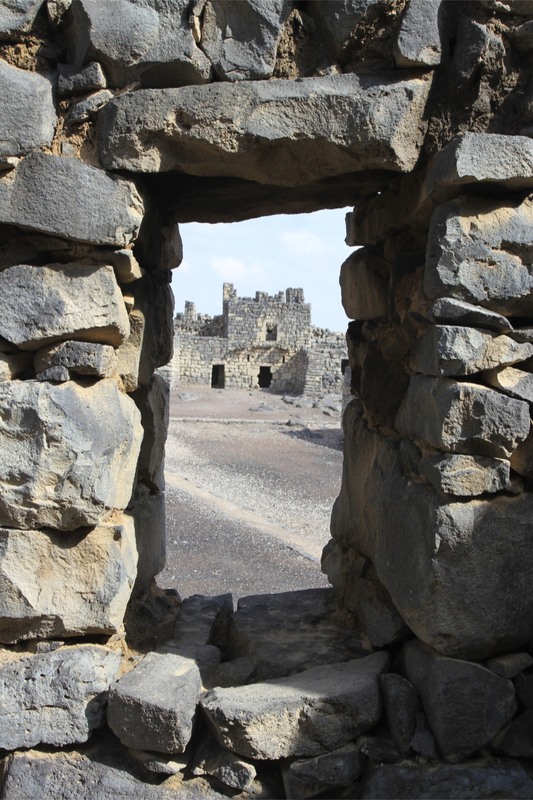 The castle also kept local Bedouin – who occasionally allied themselves with the Crusaders – in line. 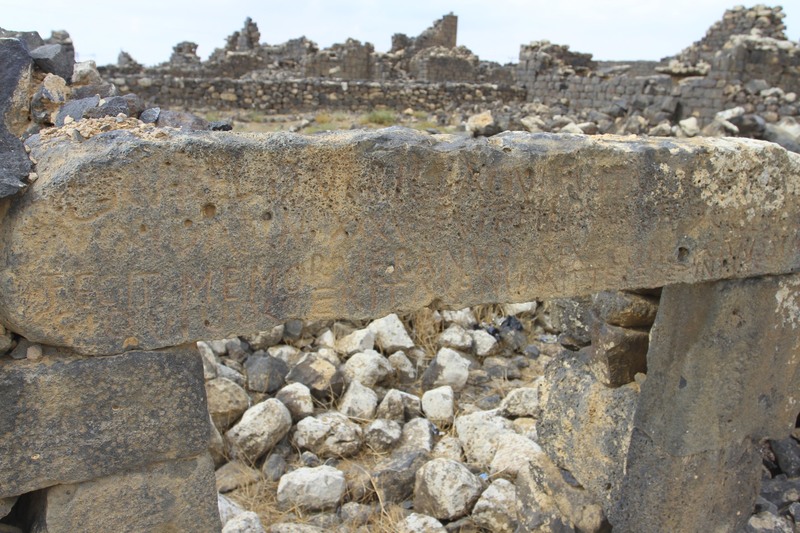 It was also an important link in the chain of communications that allowed messages to be sent across the Ayyubid Empire. Some messages went by horse, much quicker though were carrier pigeons. 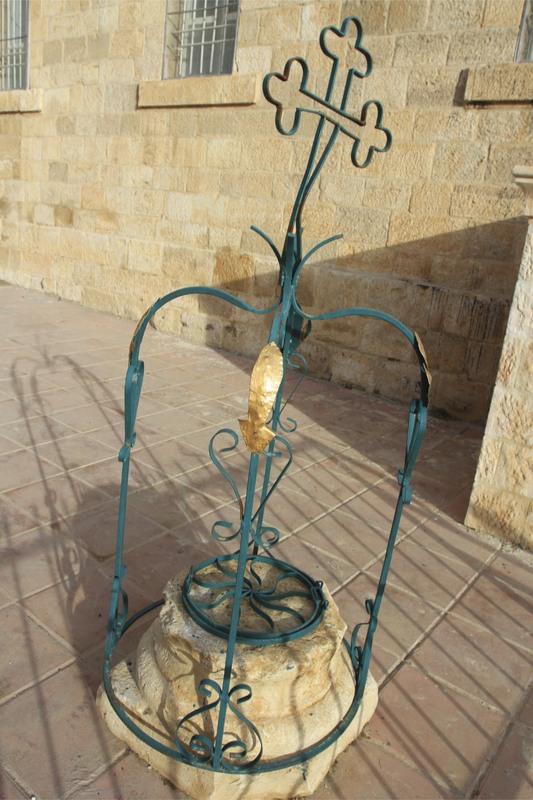 The pigeon post could carry a message from northern Syria to Cairo in about 12 hours. Seen from afar, isolated on a distant hilltop, it’s a dramatic sight. 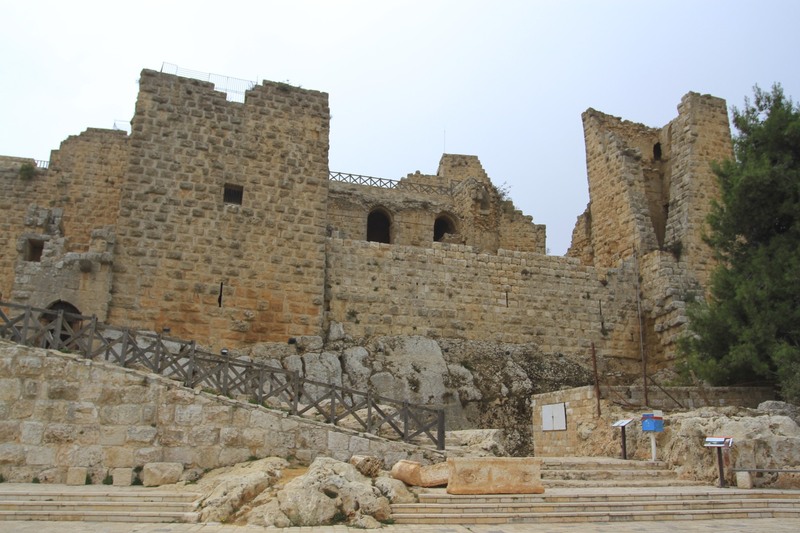 Driving along the road from Jerash the castle can be spotted frequently, reaching it however was much more tricky. 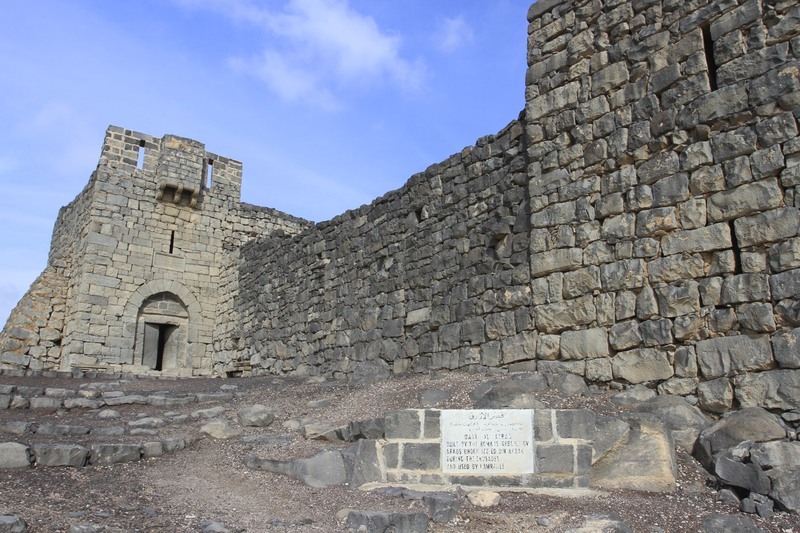 I got stuck in a traffic jam in the modern town of Ajlun and there weren’t any road signs to the castle. I took a road that looked like it might go to the castle. It did, via a very lengthy detour. By the time I got there the weather had gone from bright sunshine to heavy rain. The wind was howling and the temperature had dropped several degrees. The pigeon’s-eye view you get from the castle’s ramparts was partially obscured by thick mist, although you could still see that this was a fantastic location for spotting approaching enemies. I was glad to get inside where it was warmer and drier. 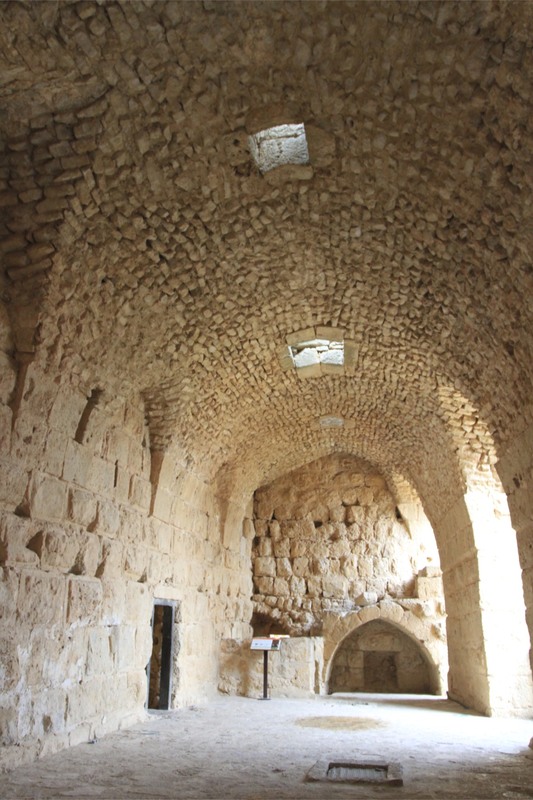 Although this was only ever an Islamic castle, in an ironic twist it seems likely that the castle was constructed on top of a former Christian monastery. 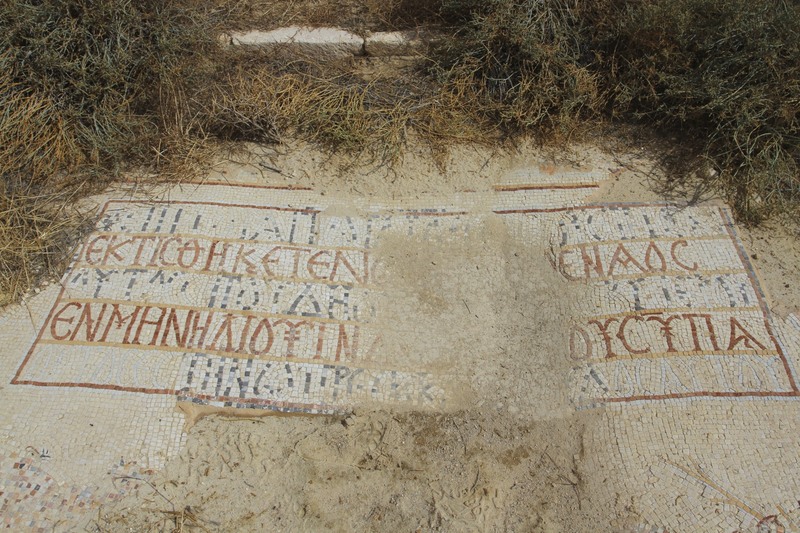 A Byzantine-era church, with a mosaic floor and other Christian symbols, has been discovered on the site. 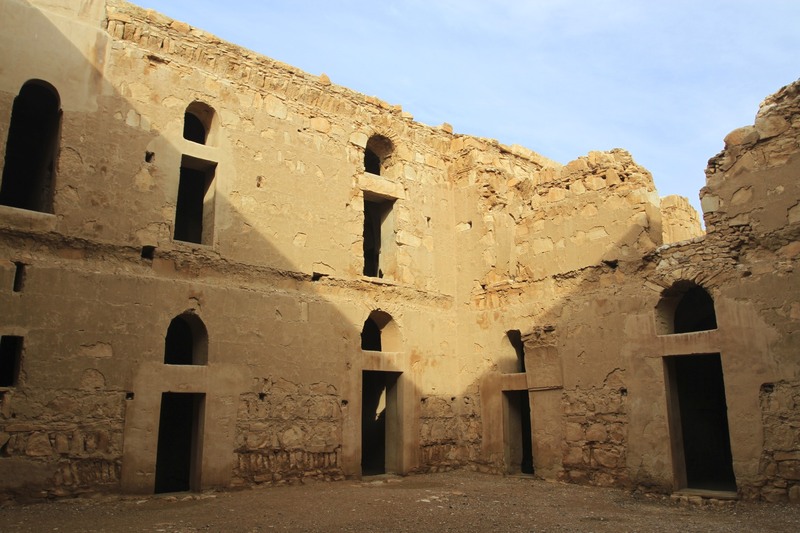 Despite two earthquakes, in 1837 and 1927, causing significant damage to the castle, the interior is well preserved – the Ministry of Antiquities has been steadily renovating it over the last several years. 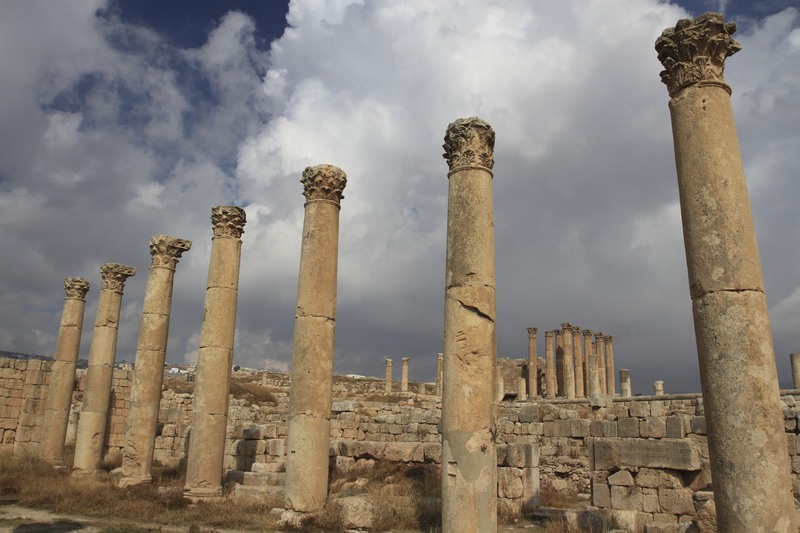 Ajlun is a short distance from Amman and a popular stop-off for Jordanians and foreigners on a day trip to Jerash. 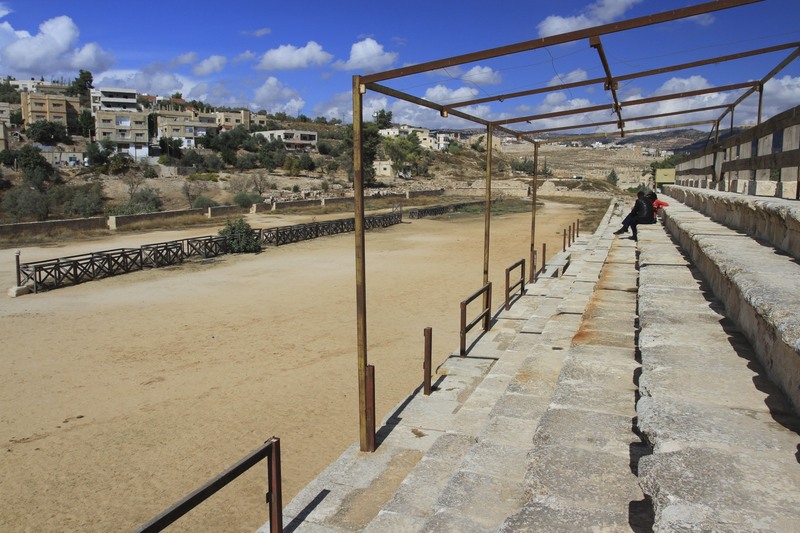 I think there were more tourists here than anywhere else I visited in Jordan other than Petra. 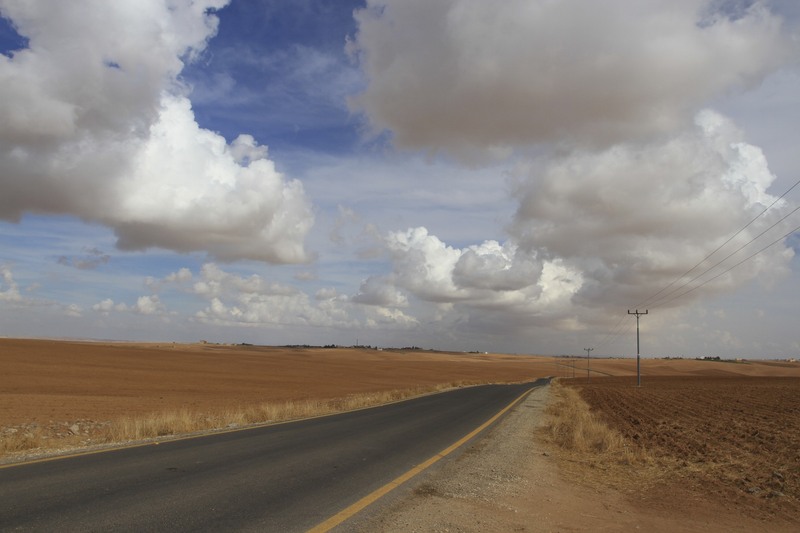 This was my last full day in Jordan and I set off under a foreboding sky on the winding drive down into the Jordan Valley. As I went the clouds parted in a vaguely Biblical way and the sun came bursting forth to illuminate the valley below. 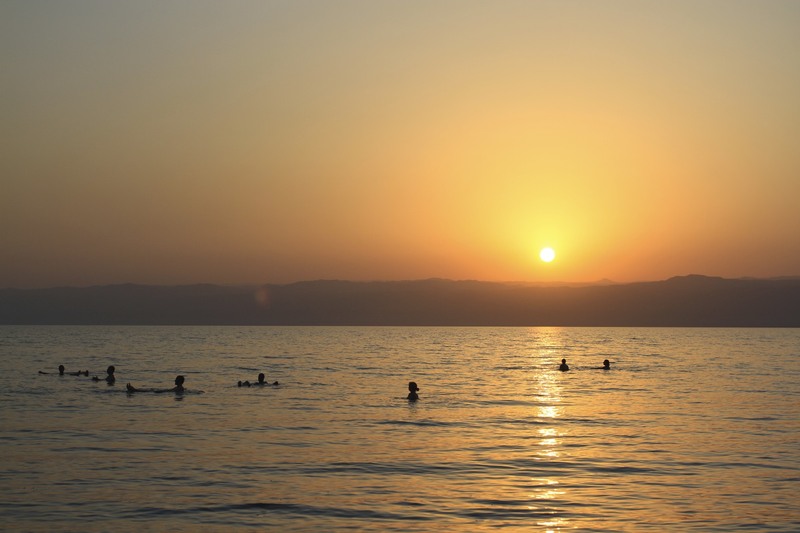 I was heading back to the Dead Sea where I figured I’d earned a float and a lounge by the pool before heading back to Amman and my flight home. 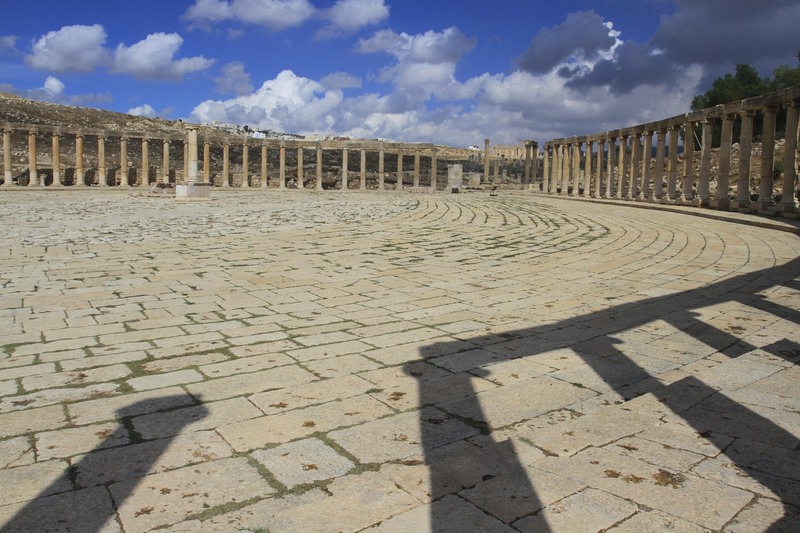 If Jerash were almost anywhere else in the world, it would be mobbed by tourists. 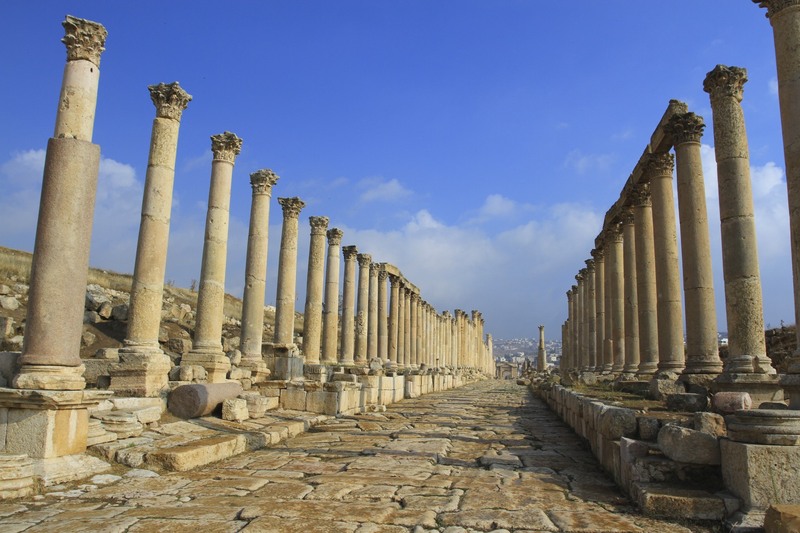 Yet Jordan’s unfortunate place wedged between Syria and Iraq means a lot of the people who should have been walking down Jerash’s wonderfully preserved Roman streets were holidaying somewhere else. 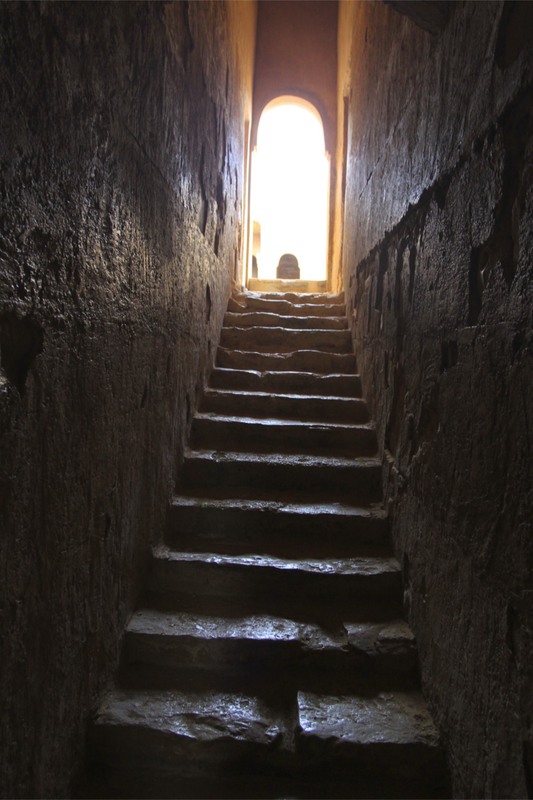 I started my Indiana Jones-style explorations early, and for much of the time it felt like I had the city to myself. After marvelling at the enormity of Hadrian’s Gate, and the profound statement it made about the power of the Roman Empire, I walked through the vast space of the magnificent Forum beneath the old Temple of Zeus, and down the extraordinary colonnaded Cardo Maximus. 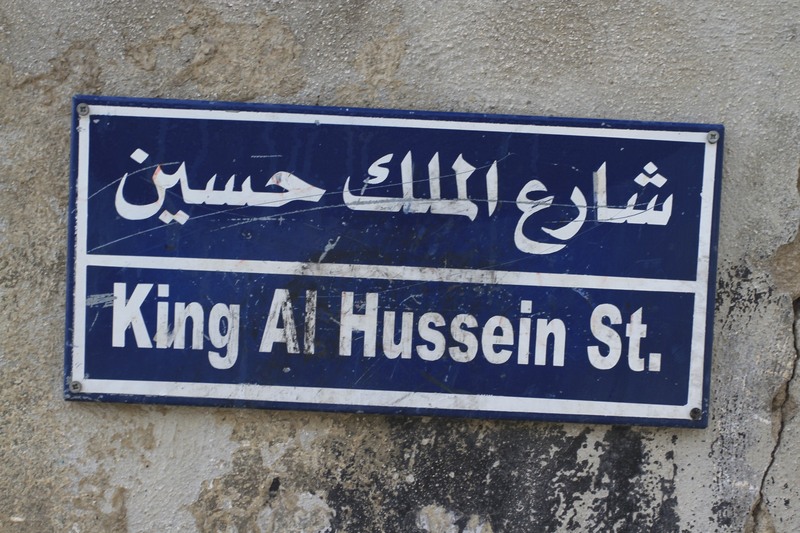 A journey made by countless feet over the thousand years that this city flourished. 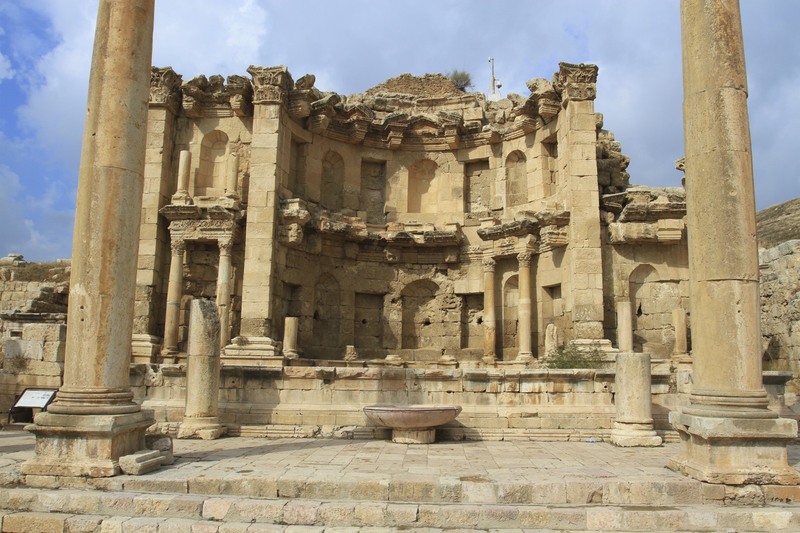 I diverted off the Cardo Maximus, passing through Jerash’s Byzantine cathedral and a group of early Islamic-era houses on my way to one of the city’s most eye-catching sights: the Temple of Artemis. 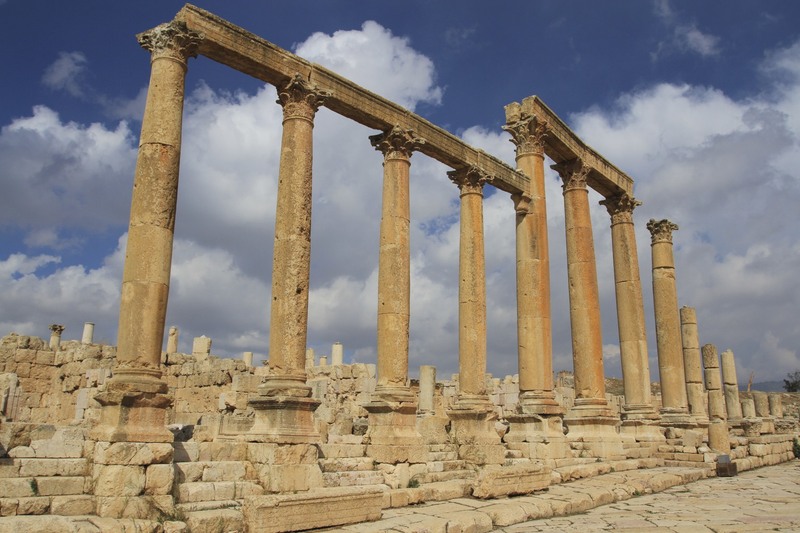 Dating back to the days when the Romans still worshiped the old Gods, the temple sits on an elevated site and has grand views across the ancient city to the modern city. 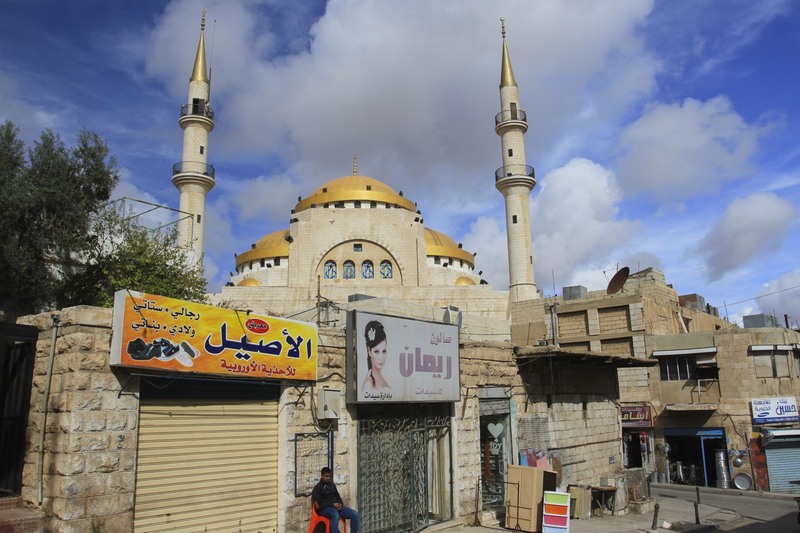 I saw some people inside the temple, young Jordanian’s setting up a coffee stall and selling jewellery. It was early so I had coffee and a chat while sat on a lump of ancient carved rock. The guy who ran the coffee stall was learning English from YouTube videos that taught a very British type of English. He’d written down lots of phrases and we had fun discussing the meaning of sayings like, ‘Bob’s your uncle’, ‘Dog’s dinner’, ‘Sweet fanny adams’; weird British words like ‘Codswallop’, ‘Gobsmacked’ and ‘Shambles; and why he probably shouldn’t call anyone a ‘minger’. Afterwards he refused payment for the coffee, and I felt like I might have prevented him from inadvertently offending someone. Wandering down hill I arrived back on the Cardo Maxiumus, the main street in any Roman town, near the city’s main water supply, the ornate Nymphaeum. 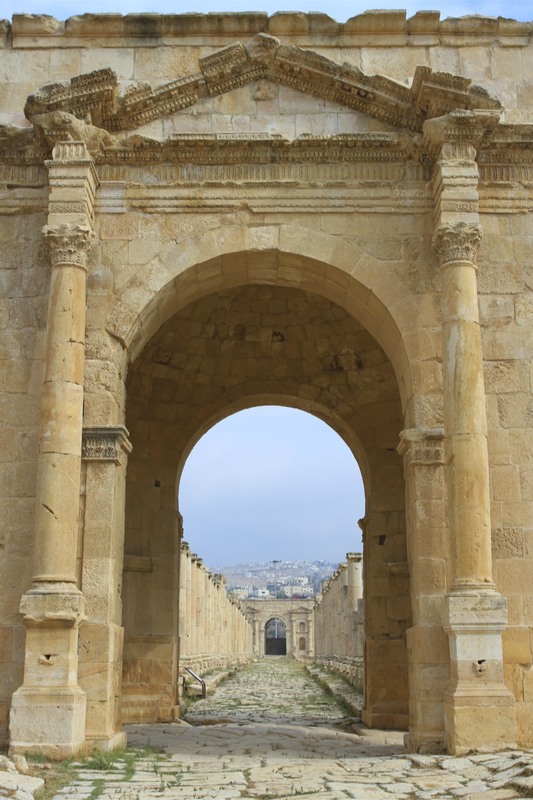 I continued north along the arrow-straight street towards the Northern Tetrapylon (a gateway with four entrances) and the Northern Gate, which is impressive but can’t compete with Hadrian’s Gate. 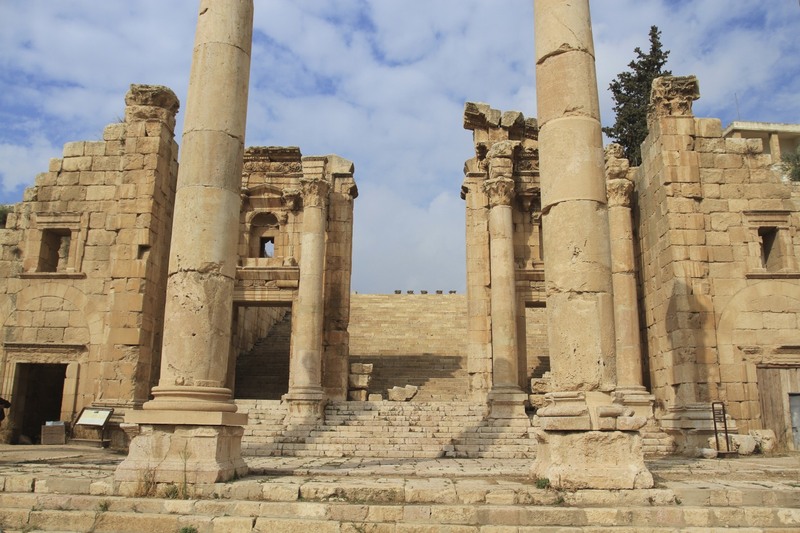 As I walked back uphill towards the Northern Amphitheatre I was barely able to absorb the wonders of this place; so well-preserved is Jerash that you really get a feel for how the city functioned. Inside the amphitheatre I clambered up to the top row and was rewarded with spectacular views. 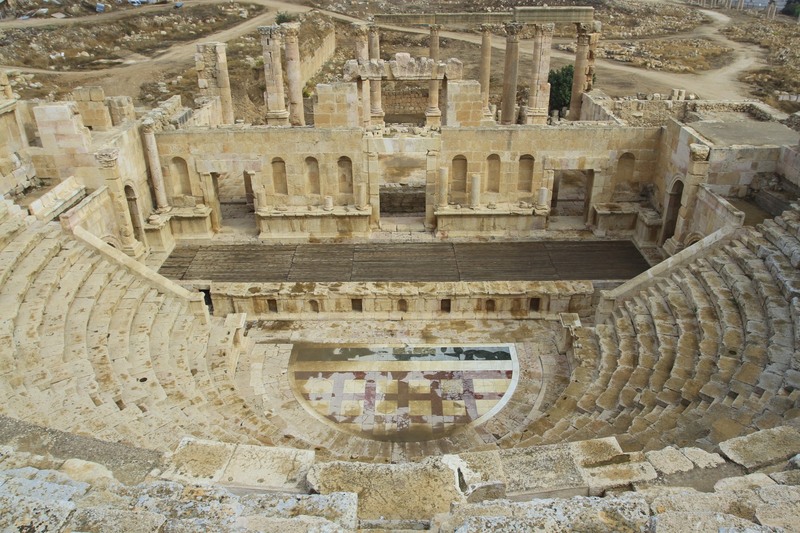 I sat in one of the theatre seats, where countless others have sat over the centuries, and just drank in the atmosphere. 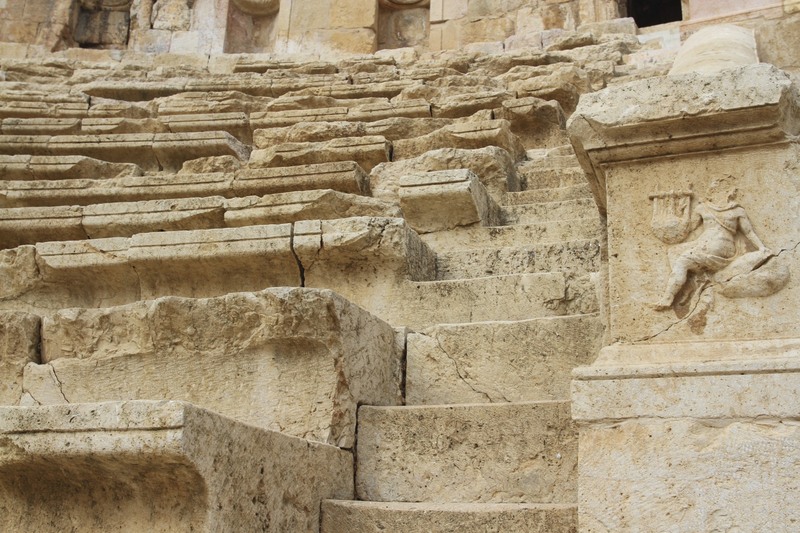 My revery was broken some time later by a small group of Chinese tourists who’d made their way to the furthest reaches of Roman Jerash. We said some quick ‘hellos’ and I realised that time had flown and it was way past lunchtime. 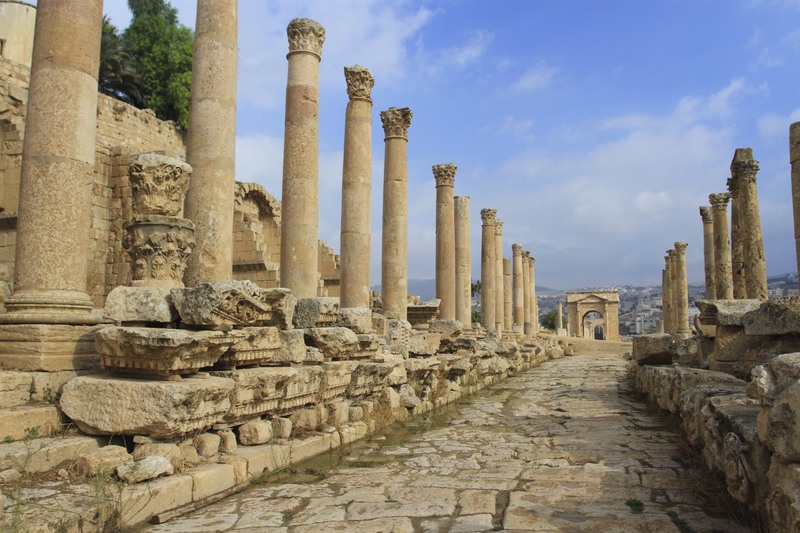 I wandered back out into the city to explore a bit more and went to find something delicious to eat in modern Jerash. 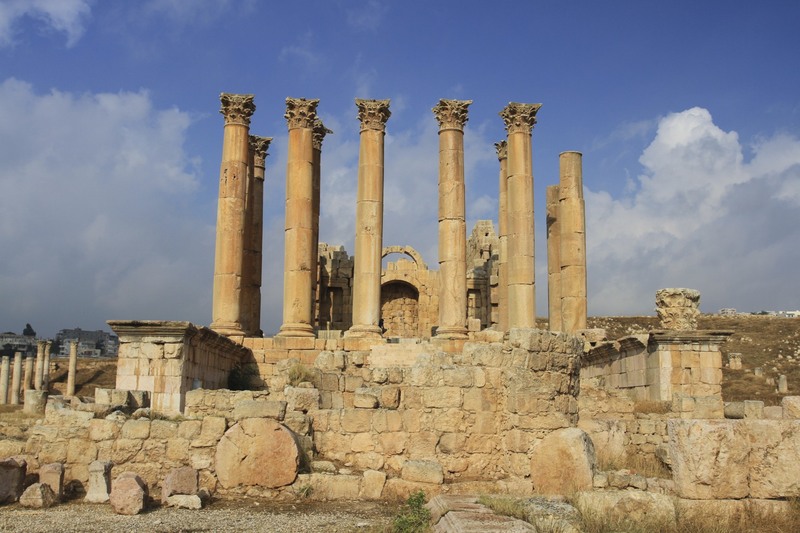 Speak it quietly, for this is heresy: for my money the glorious Roman city of Jerash is a serious contender for Petra’s spot as Jordan’s number one historic attraction. 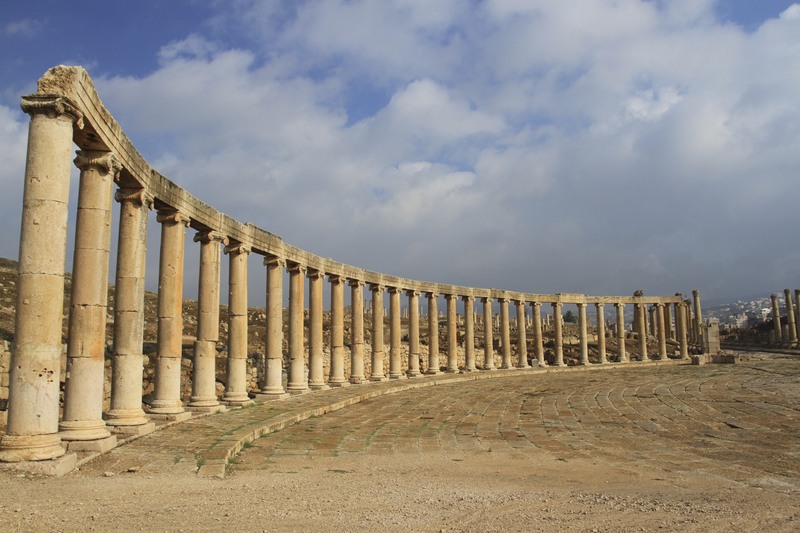 I had this revelation while sheltering from the sun in the shade of a Ionic column, taking in the sweeping vista of the Forum with views down the colonnaded Cardo Maximus. It’s a sight to make the heart sing. I was still having this thought when I found myself surrounded by a group of teenagers on a school trip, their teachers content for them to have an informal English lesson. 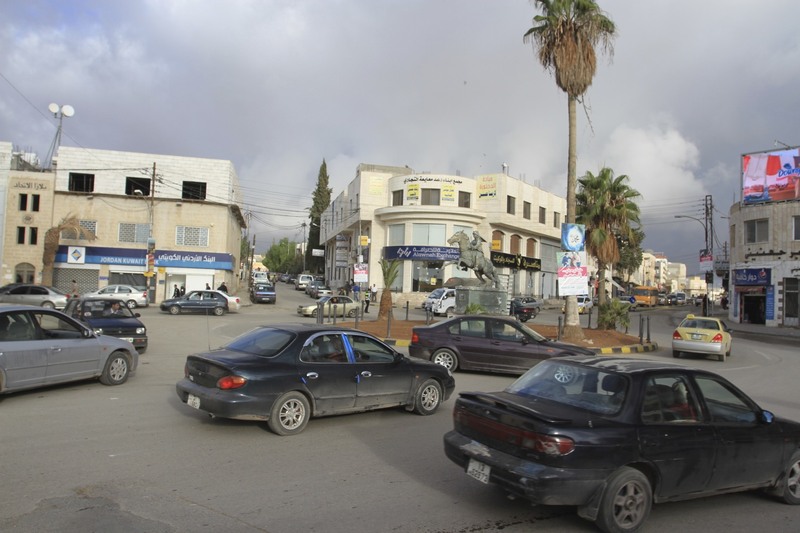 In the absence of oil reserves Jordan has invested in education to build a knowledge economy. It appears to be working. These young men and women were smart and funny, a couple of the girls spoke near fluent English. 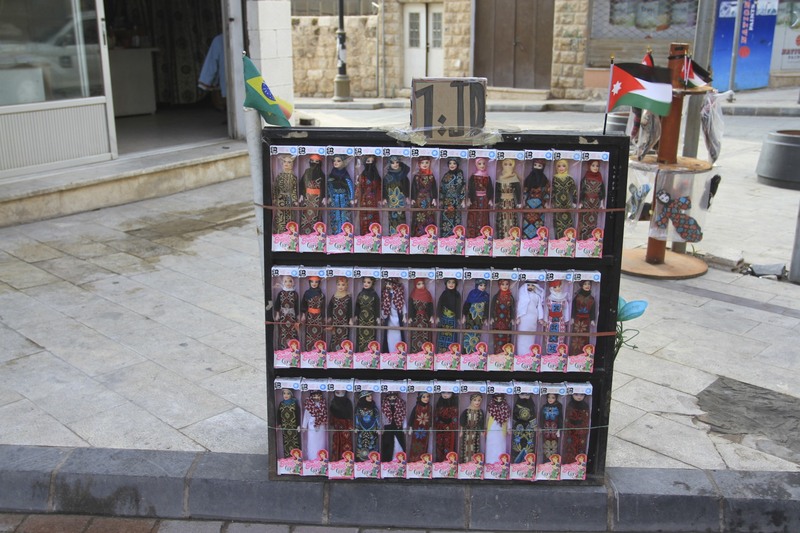 The girls wanted to know what I thought of Jordan and its people, where I’d been, what I’d seen; the boys wanted to know which football team I supported. Boys! 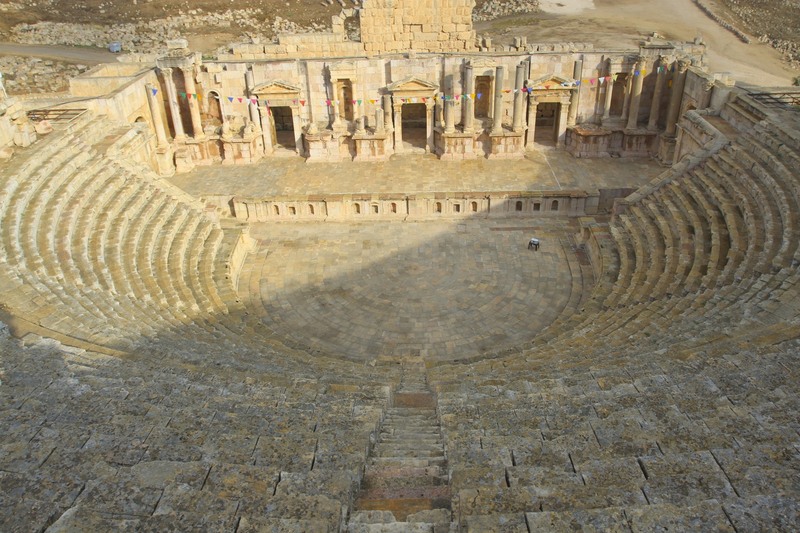 When they were finally called away by their teachers to visit Jerash’s South Theatre, they left me feeling uplifted. What might be possible in the Middle East if young people like these are given the opportunity of peace and stability? 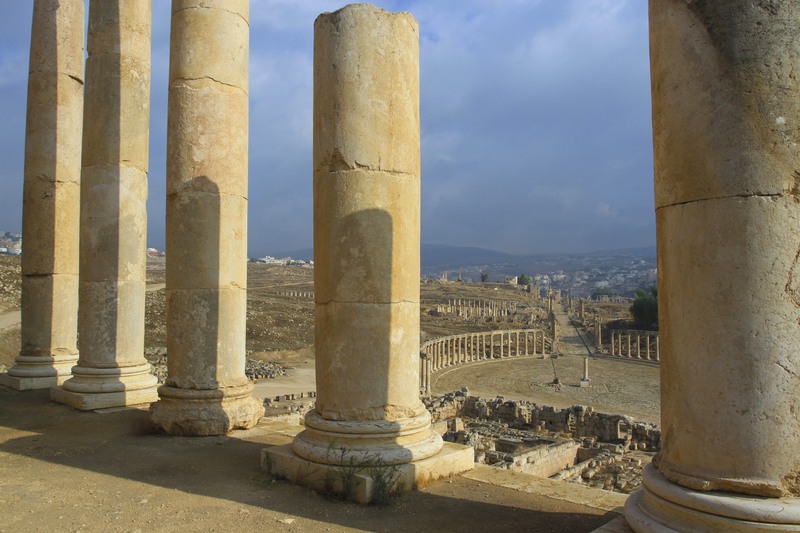 Jerash was a revelation. To say it’s worth visiting is a huge understatement. 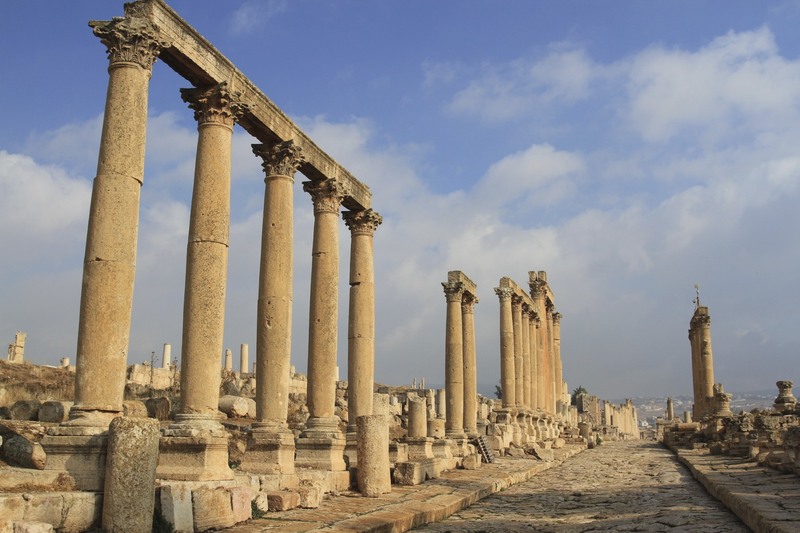 This is a spectacular place, one of the best-preserved Roman provincial cities in the world, with a continuous human history dating back 6,500 years. 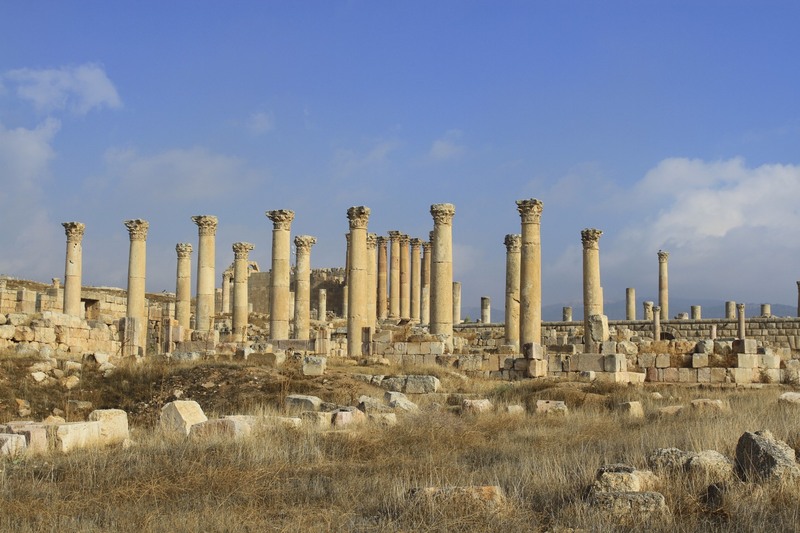 The foundations of the city were planted by Alexander the Great in 331 BC. 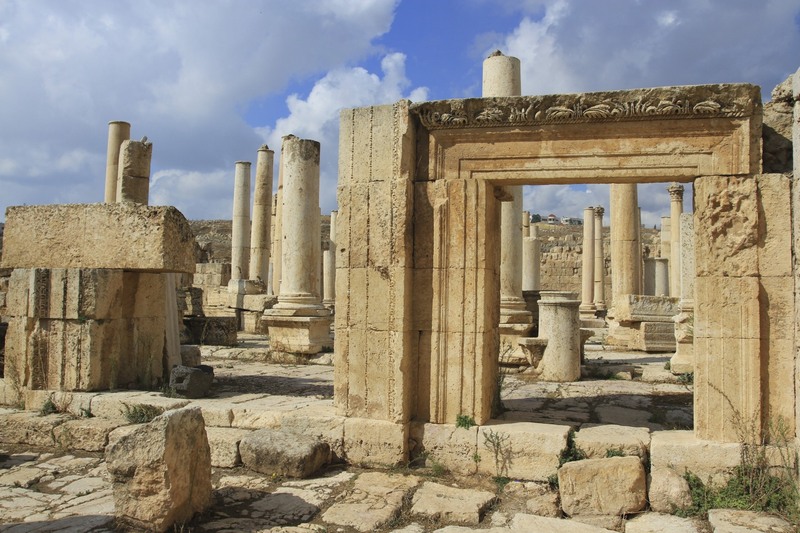 Conquered by Roman general Pompey in 63 BC, the city went on to flourish as one of the ten Roman cities of the Decapolis League, trading throughout the Roman Empire and beyond. 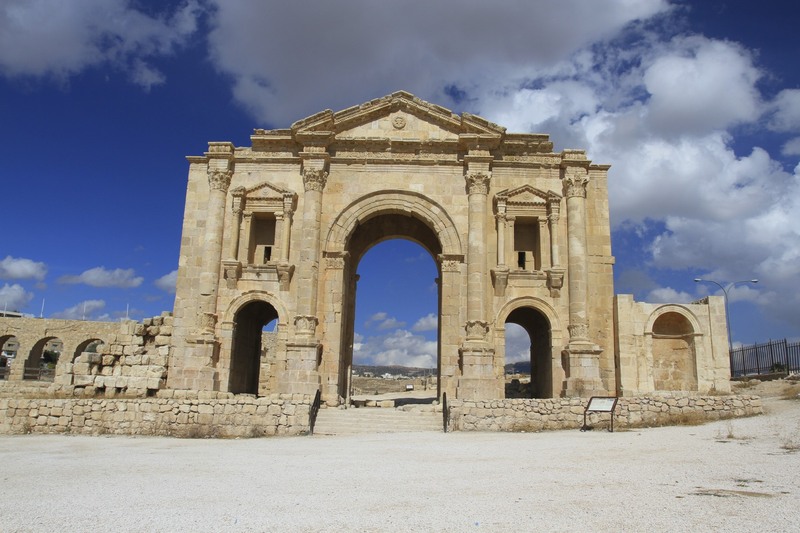 Jerash’s importance was underlined by the visit of Emperor Hadrian in 129 AD, for which they built an enormous arch at the entrance of the city. 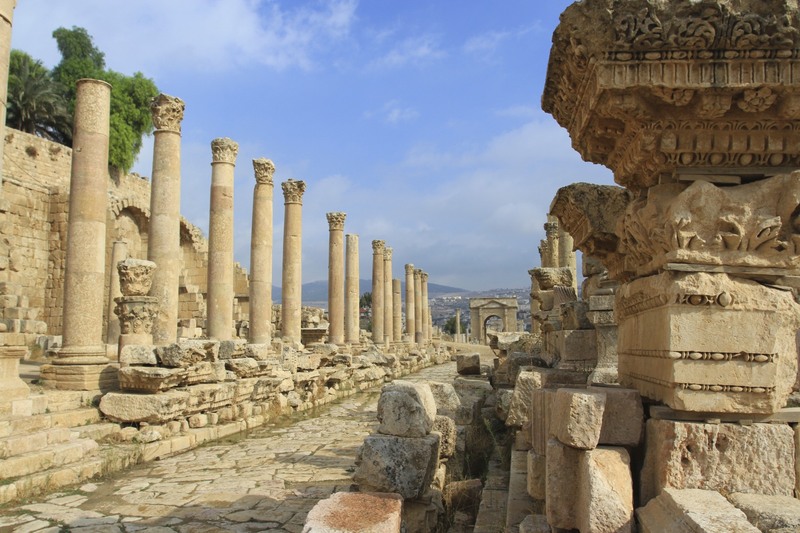 Despite the decline of Rome, the rise and fall of Byzantium, and the rise of the Umayyad Caliphate, Jerash prospered. 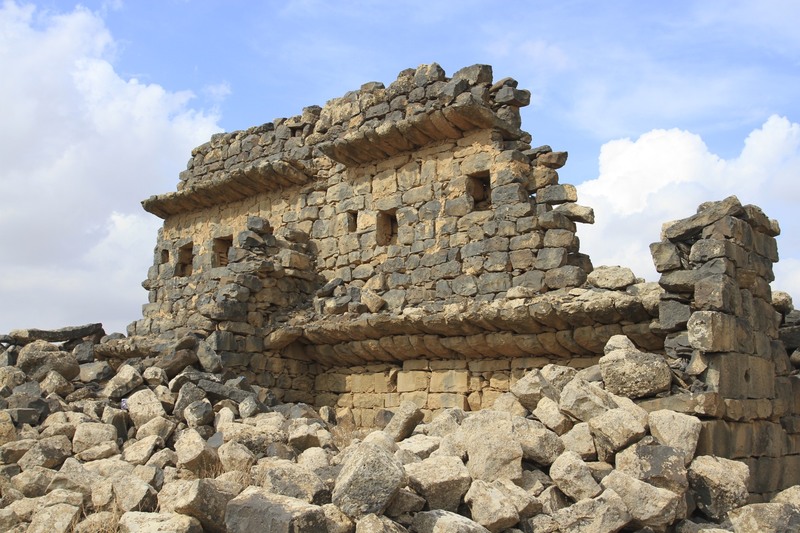 It was only when an earthquake devastated the city in 749 AD that it was largely abandoned. 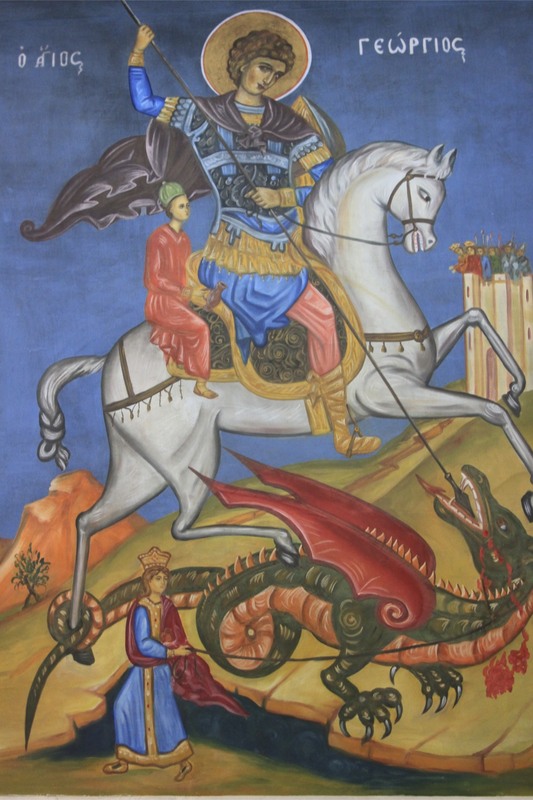 There was a brief occupation during the Crusades, after which it sank into obscurity, its glories only rediscovered hundreds of years later when Circassian refugees arrived from Russia. 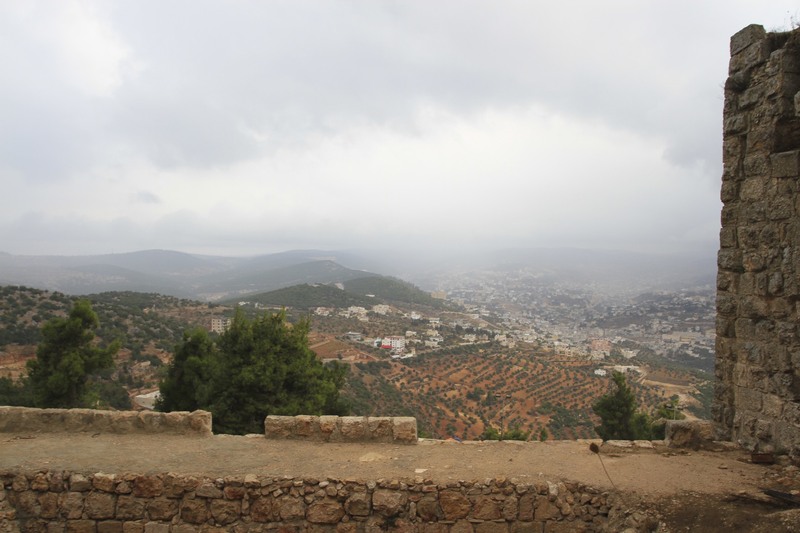 I arrived in Jerash in the late afternoon and it was raining. 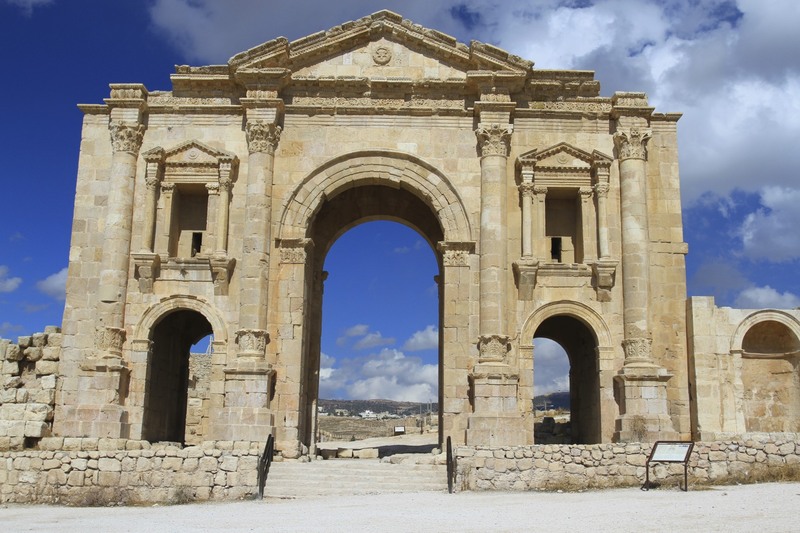 After getting entangled in heavy traffic in the downtown of the modern city, I eventually found my way to the Hadrian’s Gate Hotel (the only hotel in Jerash according to my guidebook). I was lucky to get the last room, even luckier that it was an apartment with rooftop views over Hadrian’s Gate and the modern city. 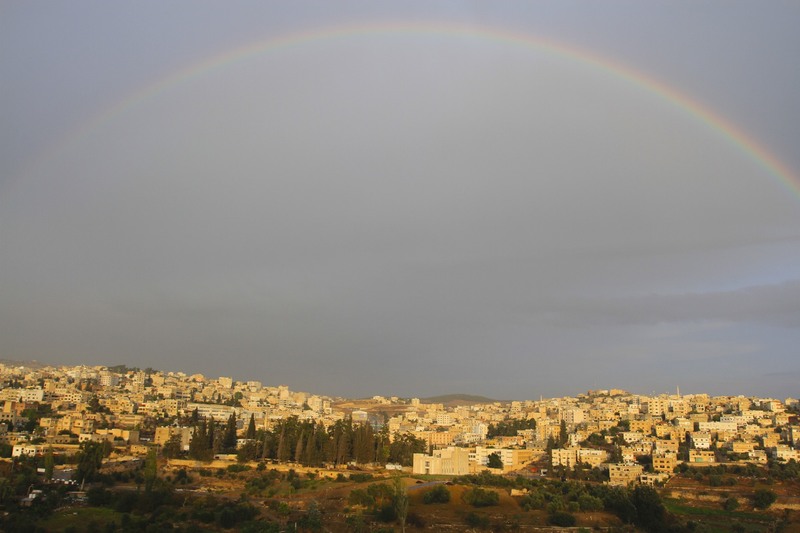 After a relaxing evening watching a giant rainbow over the town, sipping wine on my roof terrace and eating fabulous food at the nearby Lebanese House Restaurant, I woke early the next day full of expectation. 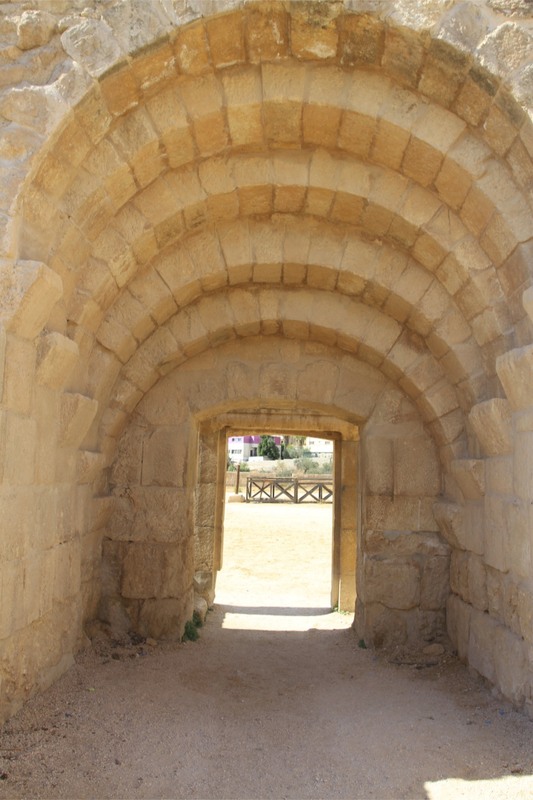 From the moment you walk through the giant arch of Hadrian’s Gate you enter a different world, one full of history and extraordinary beauty. 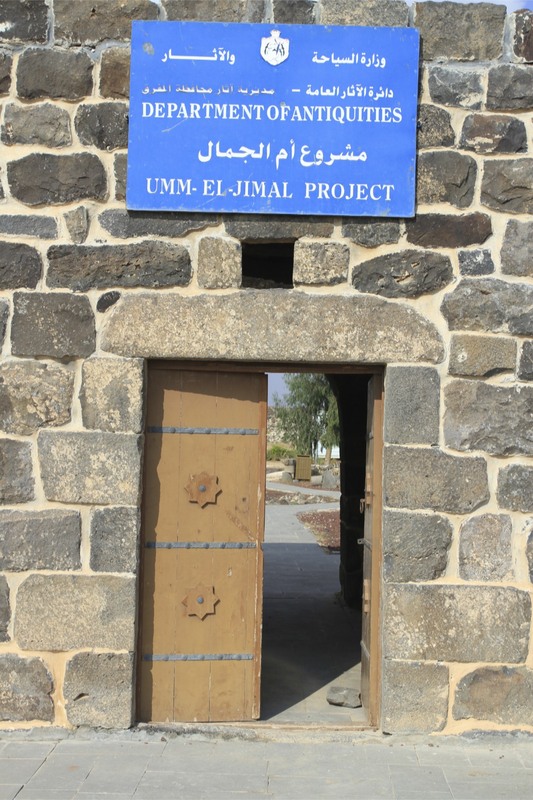 If I hadn’t seen Umm al-Jimal with my own eyes I don’t think I would have believed such a place ever existed. 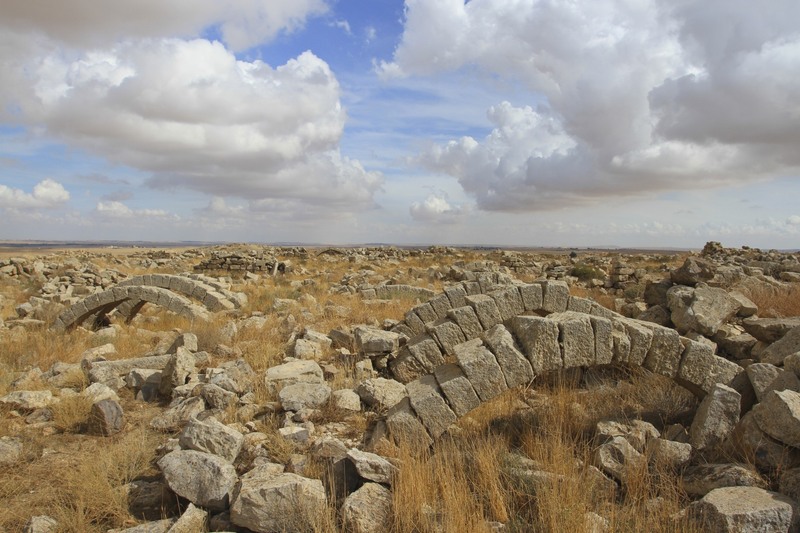 An entire city built from black volcanic basalt rock, stretching far across the flat plain; its ruins crumbling gracefully over the centuries following a disastrous earthquake in 749AD. 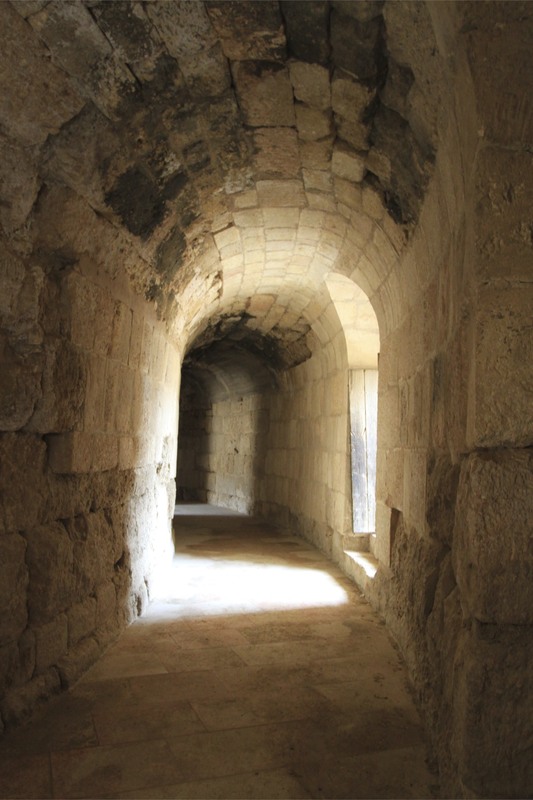 It’s a haunting place to explore, full of the ghosts of Roman, Byzantine and Abbasid history. 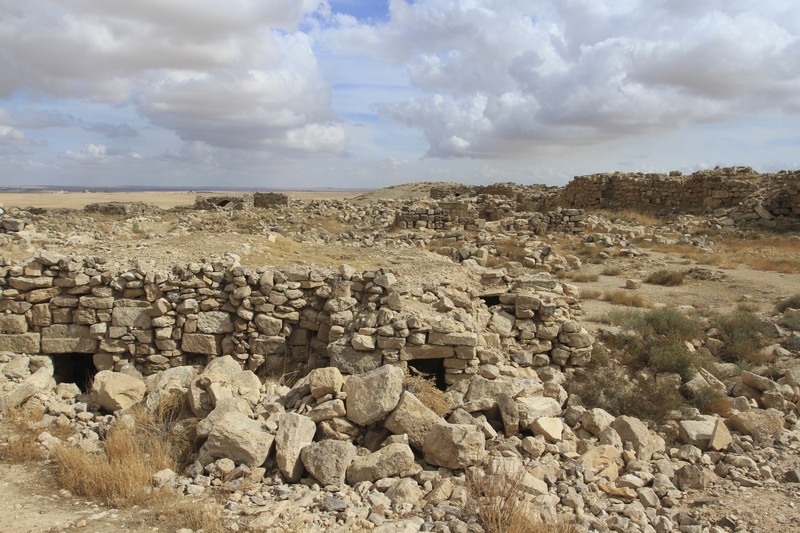 Umm al-Jimal, or Mother of Camels, flourished between the 1st and 8th Centuries before a prolonged decline. 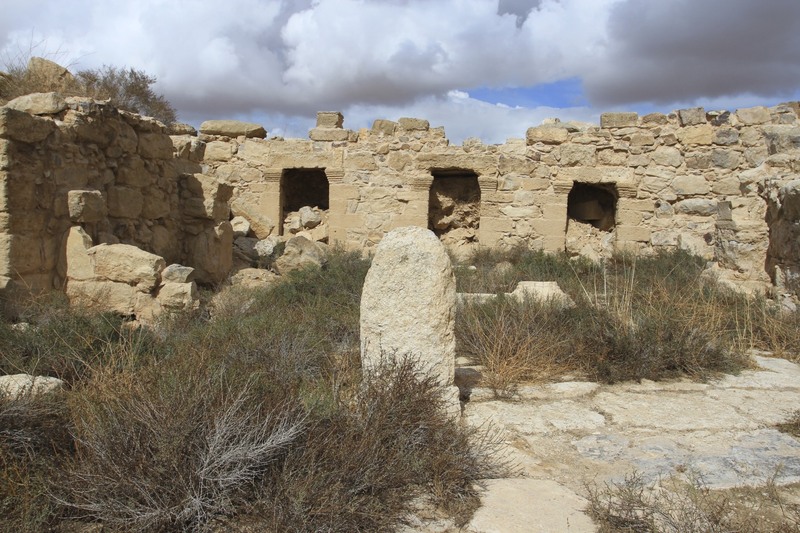 The ancient town sprung back to life early in the 20th Century. 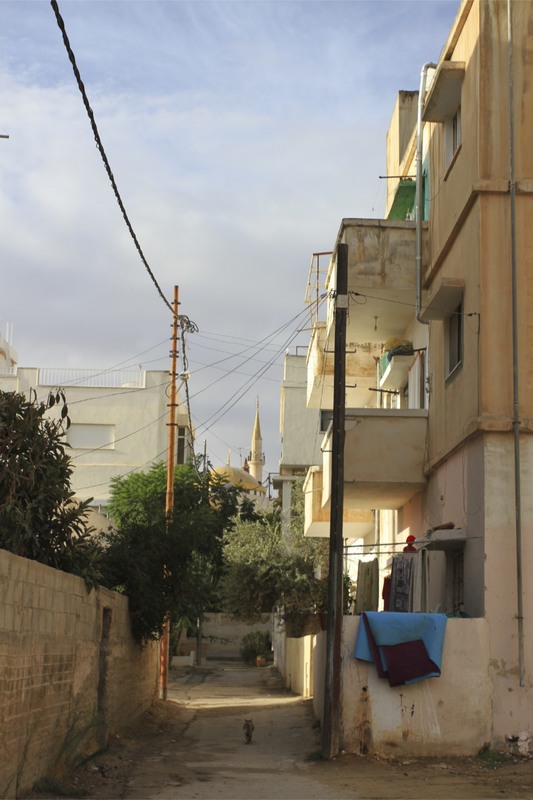 Syrian Druze refugees (it’s only a short distance to the Syrian border) fleeing persecution repopulated the city and rebuilt some of its buildings. 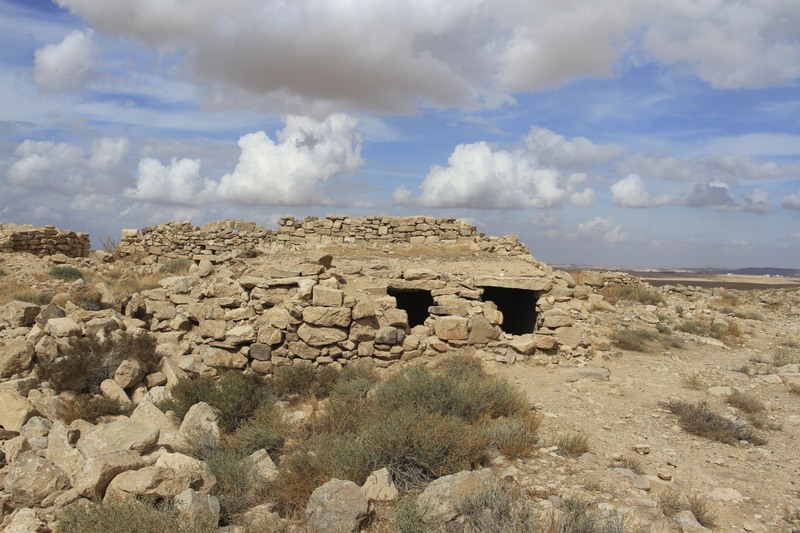 They were followed by Bedouin who lived amongst the ancient buildings in tents. 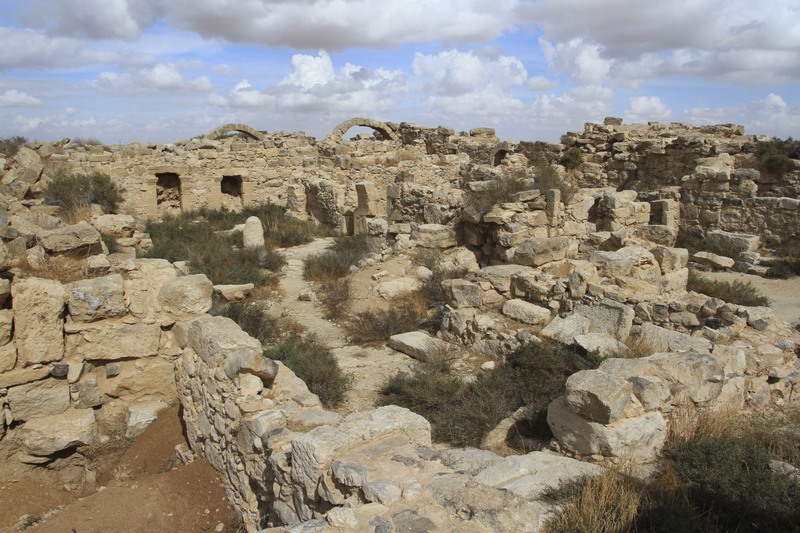 When the government decided to protect and preserve Umm al-Jimal the Bedouin founded a new town next to it. Inside the ancient city it’s easy to forget there is a parallel modern world nearby. 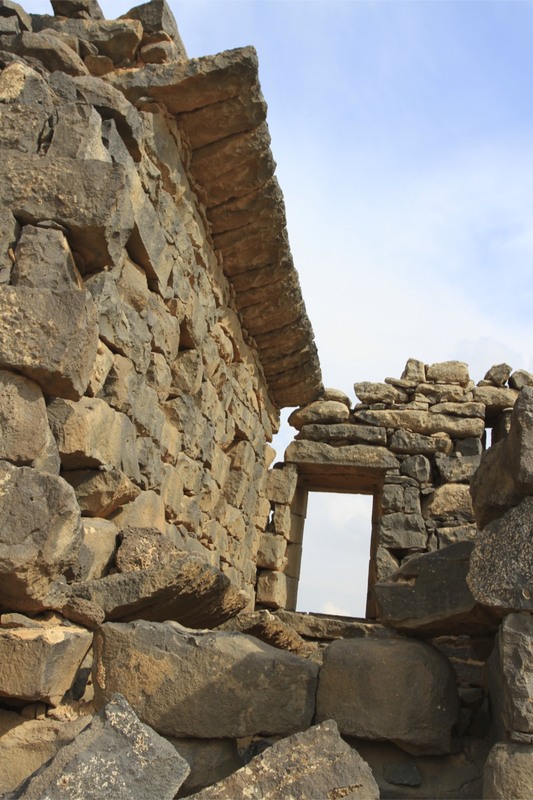 It reminded me of the Inca cities of the Sacred Valley in Peru. 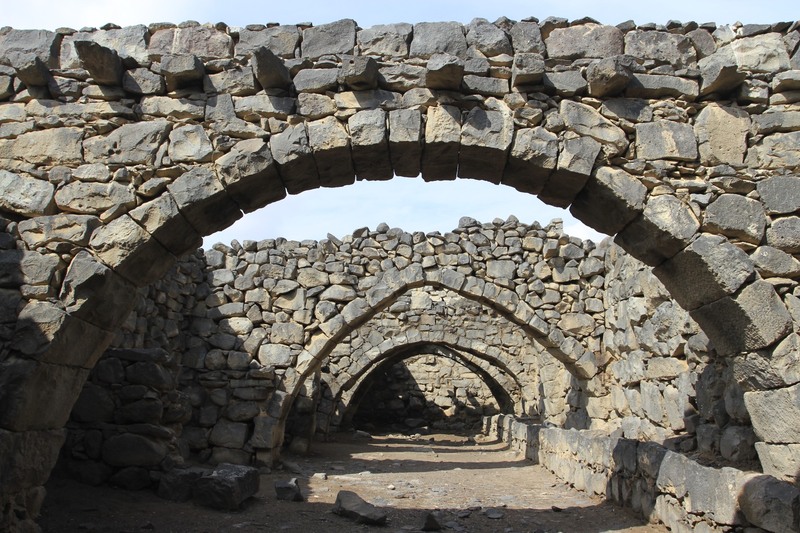 I was reaching the end of my Jordanian journey, and yet again I was dumbstruck by the extraordinary historic and cultural legacy that exists in this wondrous country. 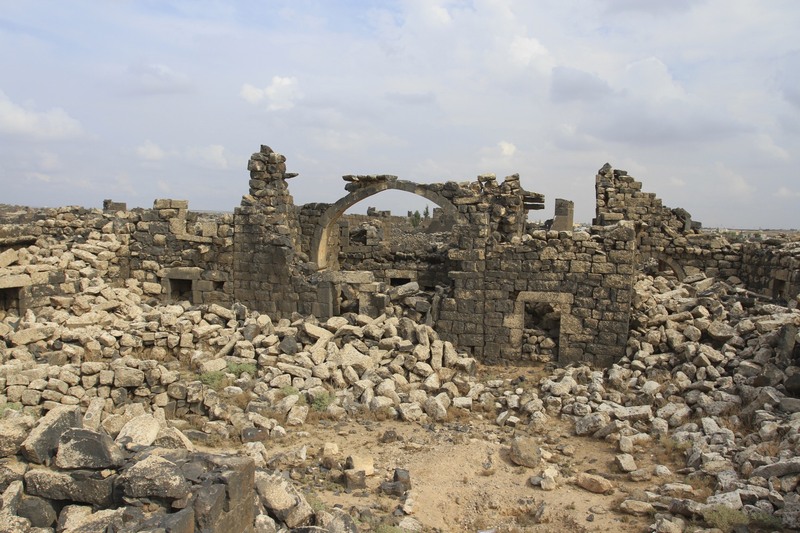 I arrived at Umm al-Jimal after driving past thousands of tents housing refugees from the Syrian conflict – history seemingly repeating itself – the flat brown landscape gave no hint of what awaited. I parked in a small car park outside the entrance and looked around for someone to buy a ticket from. I was greeted instead by two young puppies who seemed genuinely delighted to see me until they realised I didn’t have food. 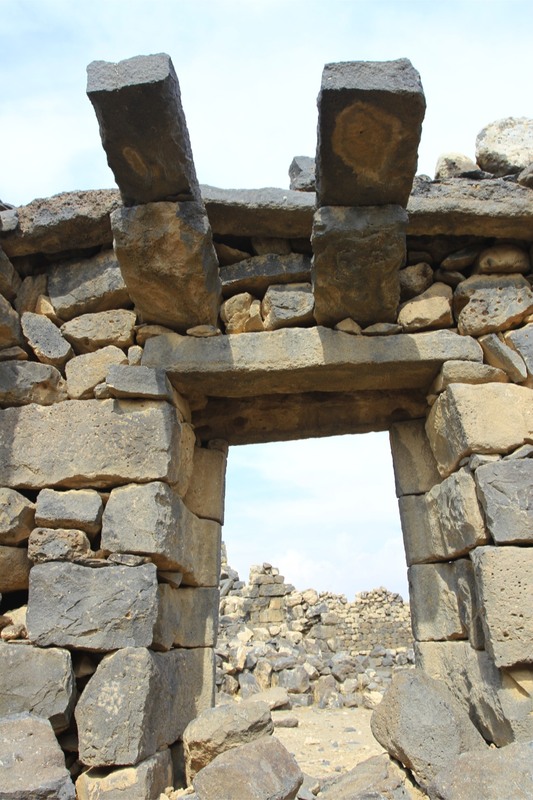 I walked over to the entrance to the ancient city, the gate was open but still no one to sell me a ticket or point me in the right direction. 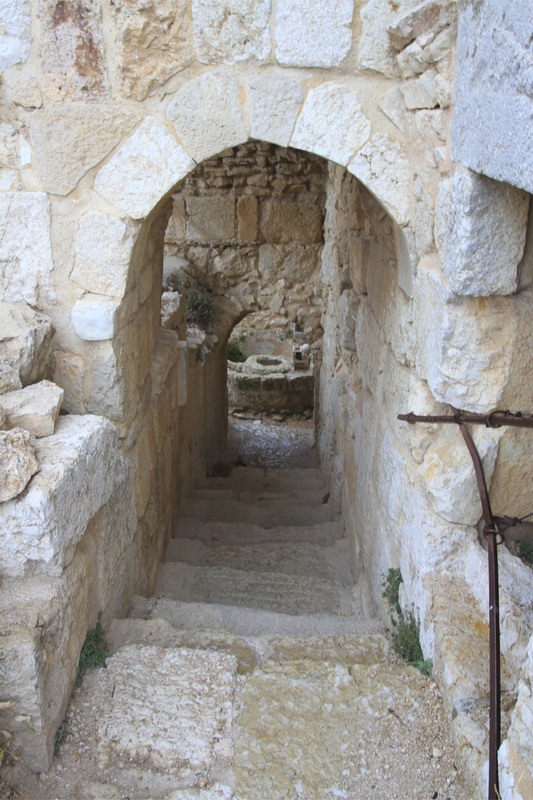 I headed first to a large tower that stood a hundred metres away and which forms part of the old barracks. I walked alongside the main defensive wall and then cut inside a web of buildings which were previously the main residential area. 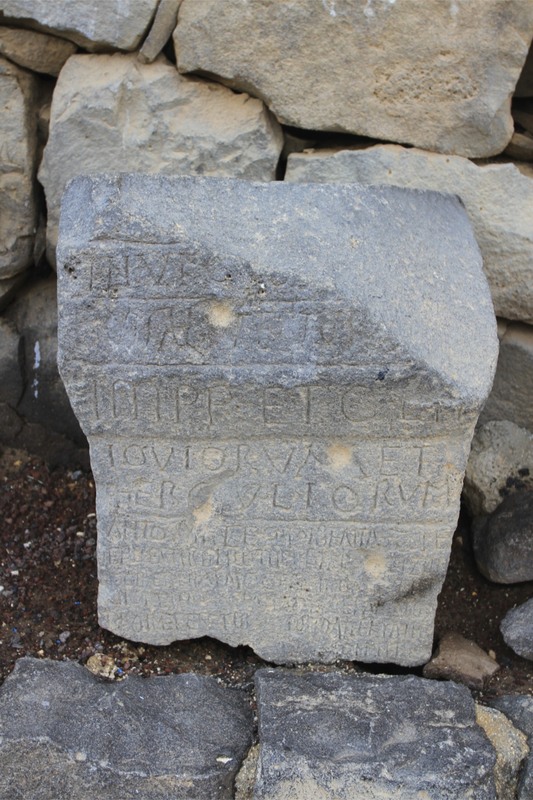 All this I learned after my visit, because although there are a couple of buildings with descriptive signs, virtually the whole site is unmarked. Some buildings though are easy to distinguish from others. The glorious West Church, standing next to one of the main gates named after Roman Emperor Commodus, could only ever have been a church. 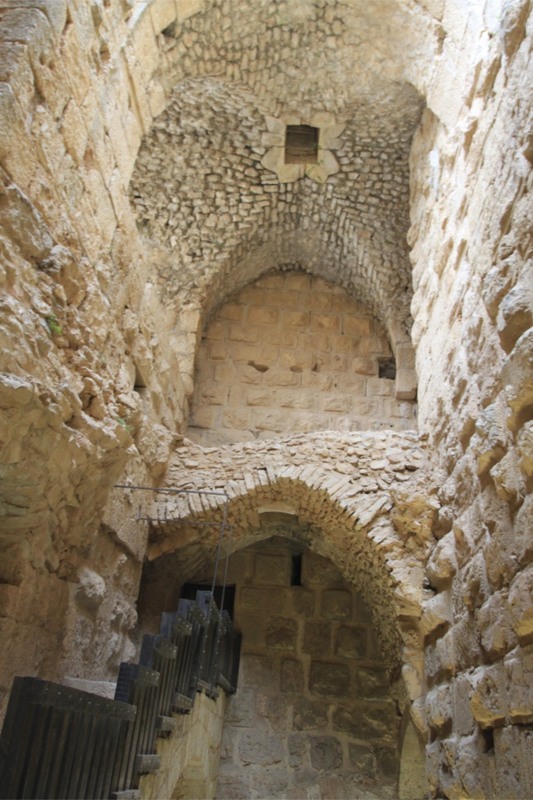 The West Church was one of several Byzantine churches in the city, including a cathedral. 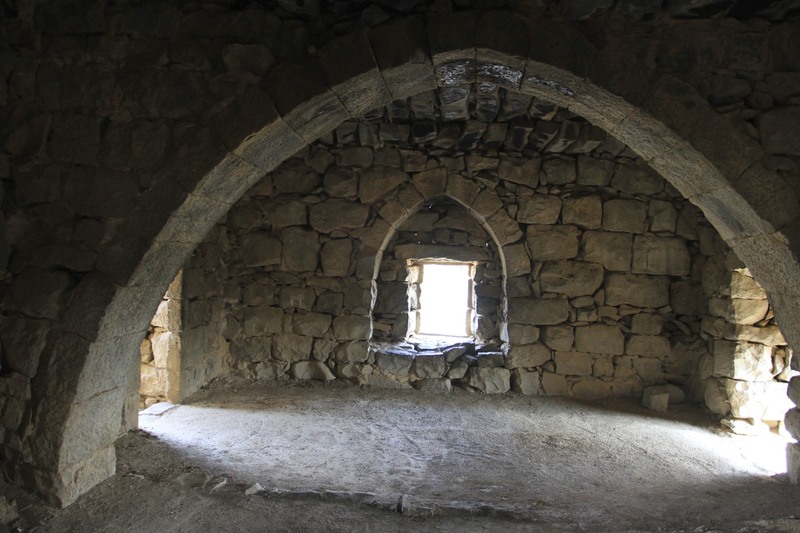 Dotted around the site are soaring stone arches, two and three story buildings (the Byzantine’s knew how to build), doorways with carved lintels leading into courtyards surrounded by more buildings. 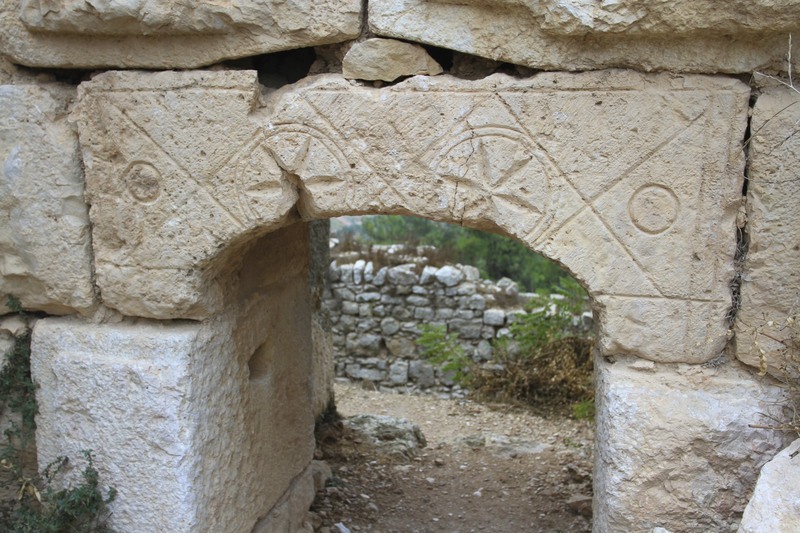 Greek inscriptions cover some stones, crosses can be seen in churches and on the doorways of houses, more recent Arabic carved into stones by the Druze. It is a glorious, magical place. I spent half a day and still only managed to explore a portion of the ancient city. 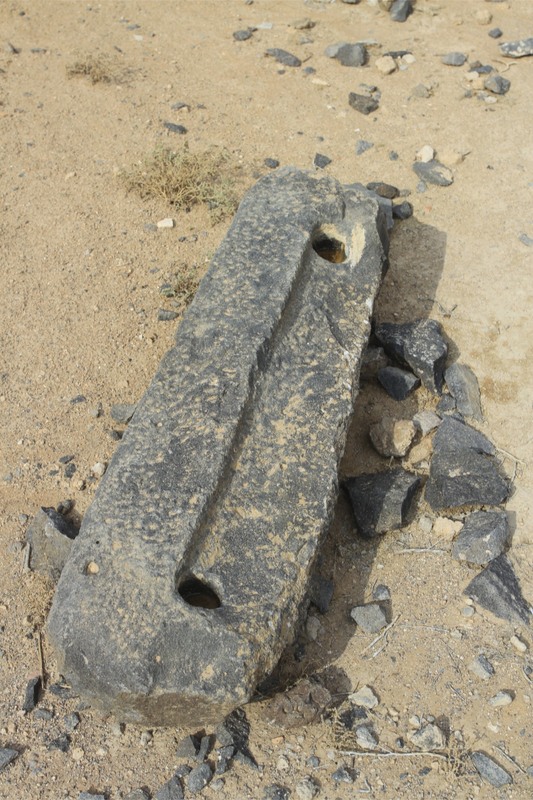 Throughout I saw only two school children walking across the site, using it as a shortcut. 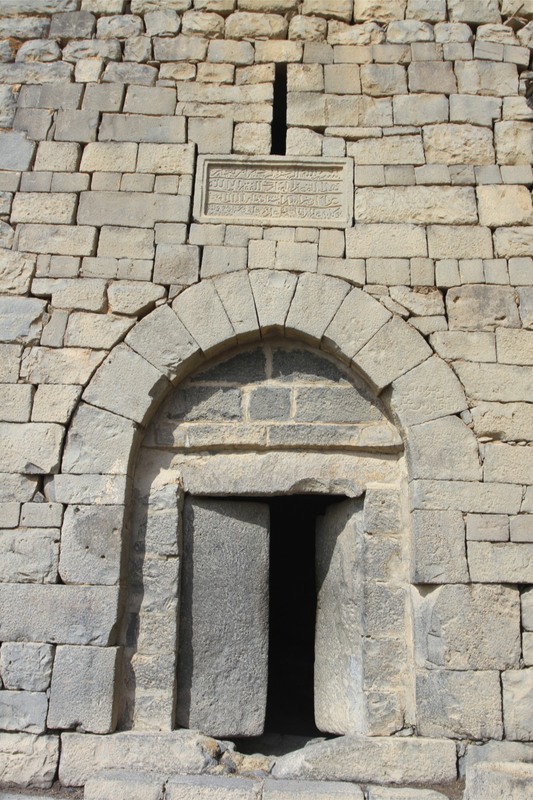 There is a building near the entrance which seems to house some offices of the Department of Antiquities. I nosed around but couldn’t unearth anyone. Back at the car the two puppies came bounding over to me forgetting that I didn’t have food. A truck went past loaded with people clinging to the top and sides. Spotting me everyone waved and shouted ‘hello’. 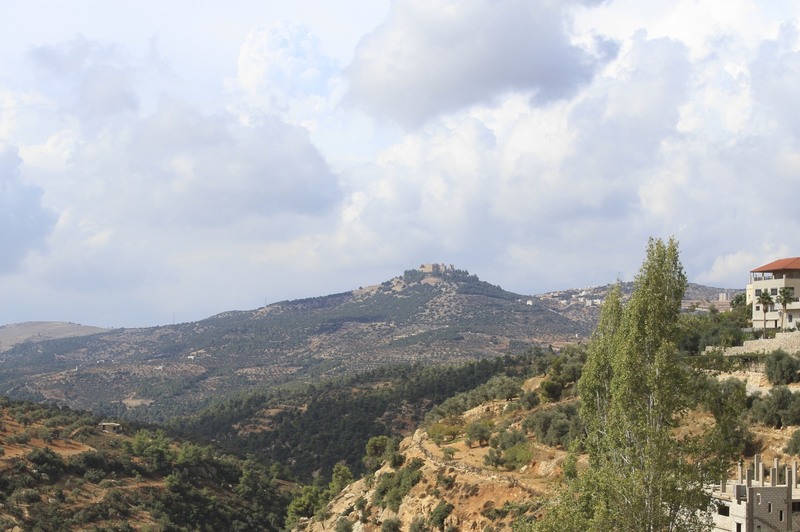 With that I clambered back into the car and drove west, hoping to reach Jerash before nightfall. 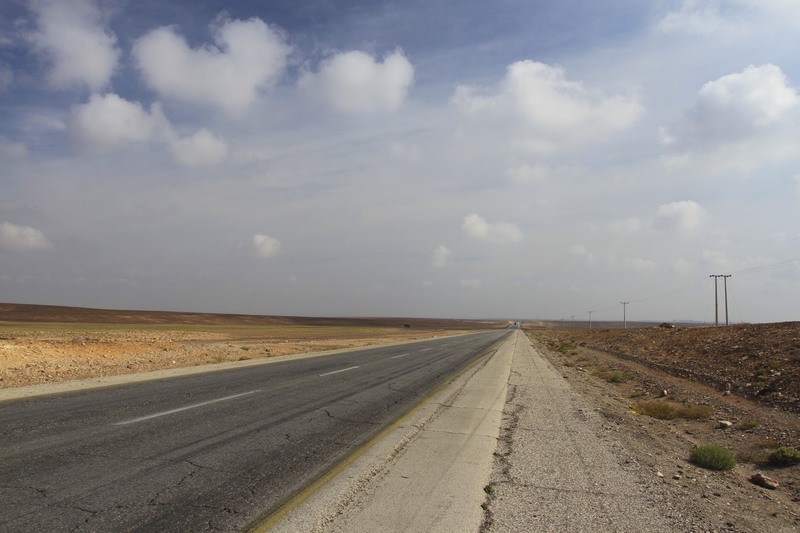 The drive into Jordan’s eastern desert was one of the more eventful parts of my Jordan road trip. 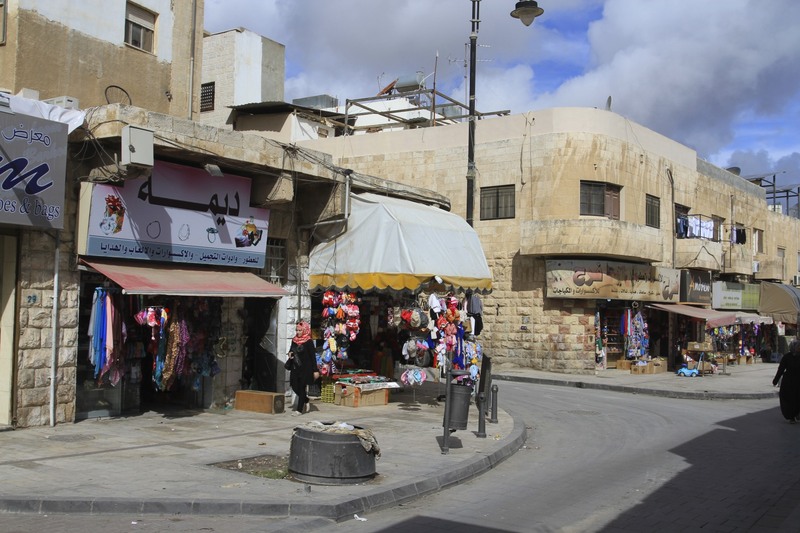 It took me through the southern section of Amman at rush hour, a gruelling and frequently terrifying experience. I was relieved to escape the mass of traffic and crazy driving. 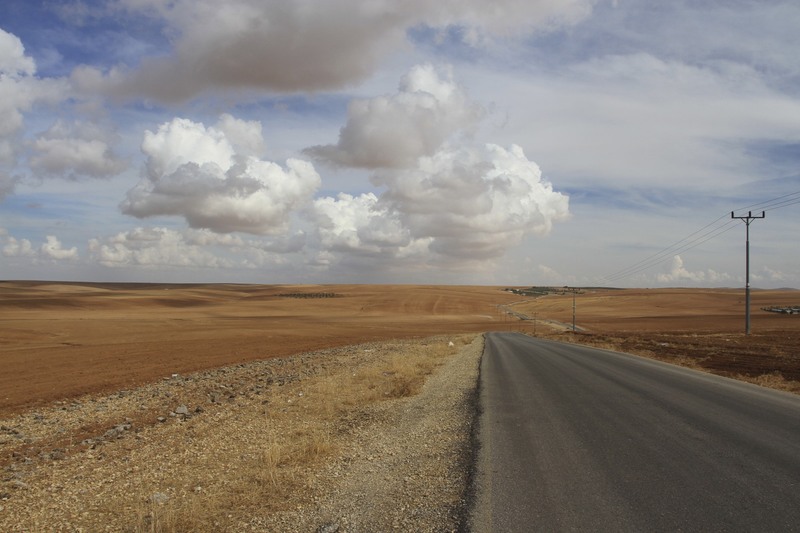 The road runs east through endless desert towards Iraq and Saudi Arabia. 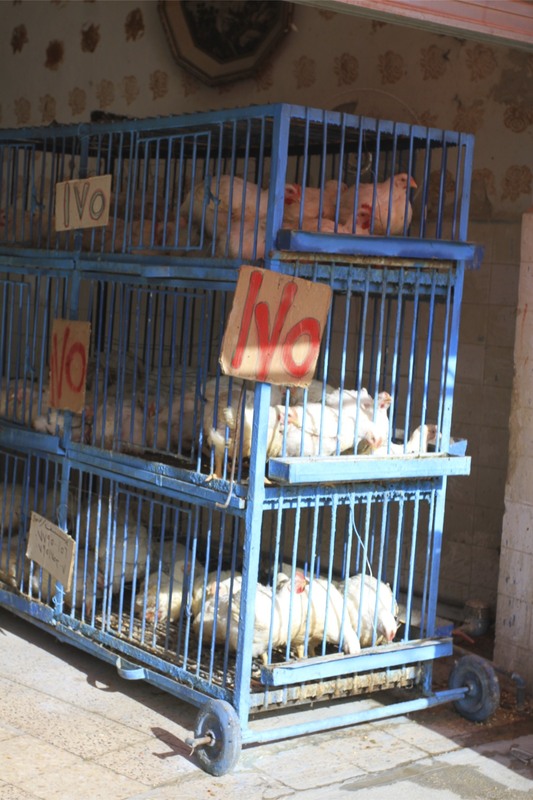 It’s a hostile environment, and few people live out here. Yet for a couple of thousand years this has been a vital trade route. 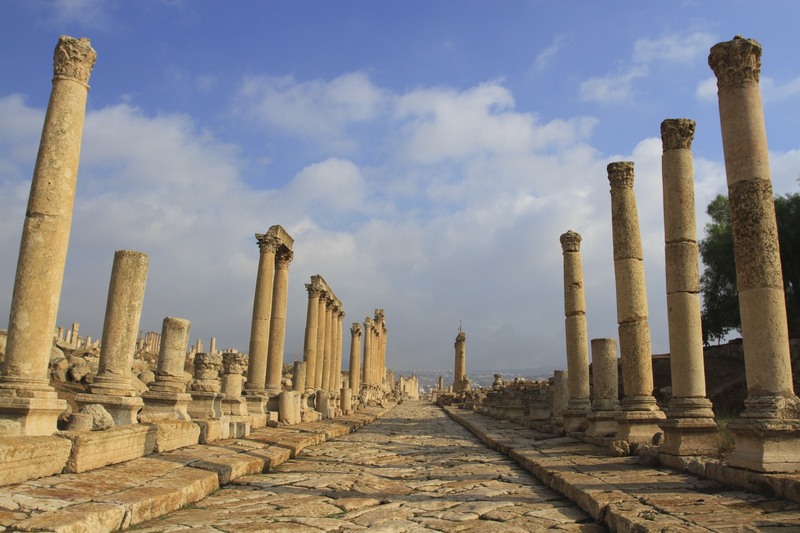 Roman legions were once posted here protecting the Empire’s frontiers; Arab caravans carrying silks, spices and other valuables travelled this route. Today trucks thunder through it. 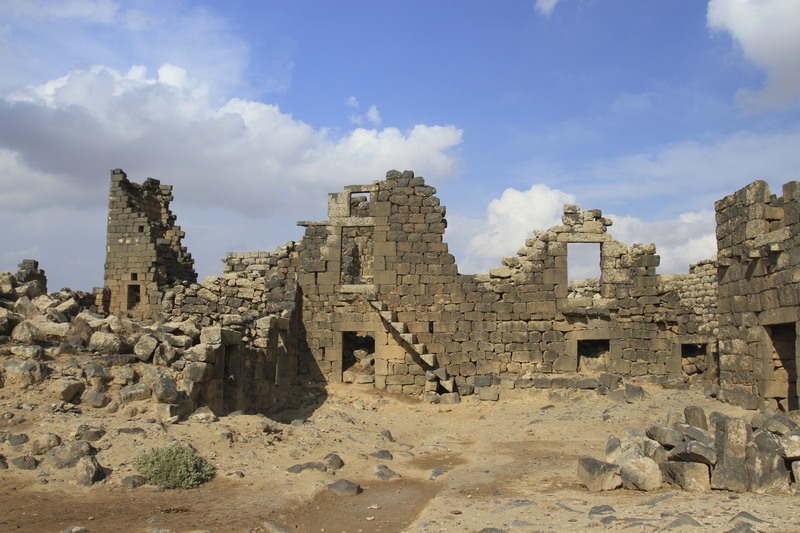 Thanks to this history there are extraordinary sights dotted in the seemingly featureless desert: ancient forts, life-giving oases and scattered nomadic Bedouin communities. There are also camels wandering randomly across the landscape, demanding their historic right of way over wheeled vehicles. 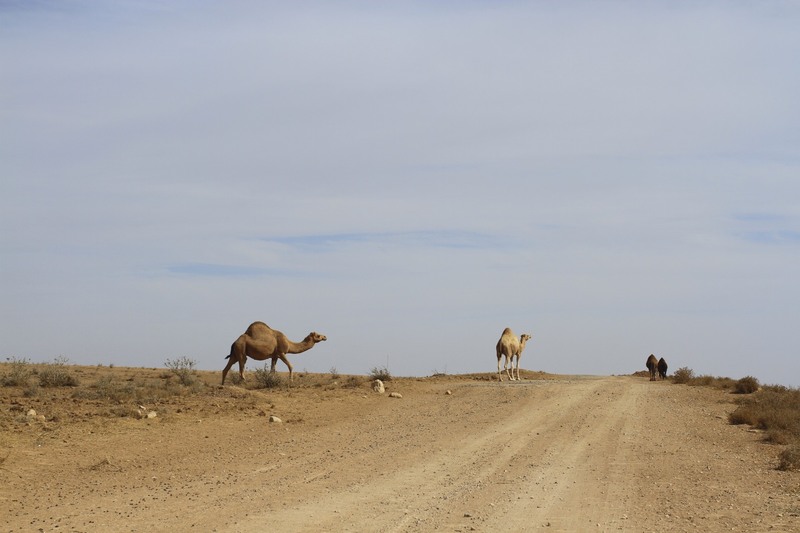 The further east you go the more remote it feels, the fewer camels there are to avoid. It was this remoteness that attracted T.E. Lawrence – Lawrence of Arabia as he’s known – during a winter of hardship hiding from Ottoman troops during the Arab Revolt in the First World War. 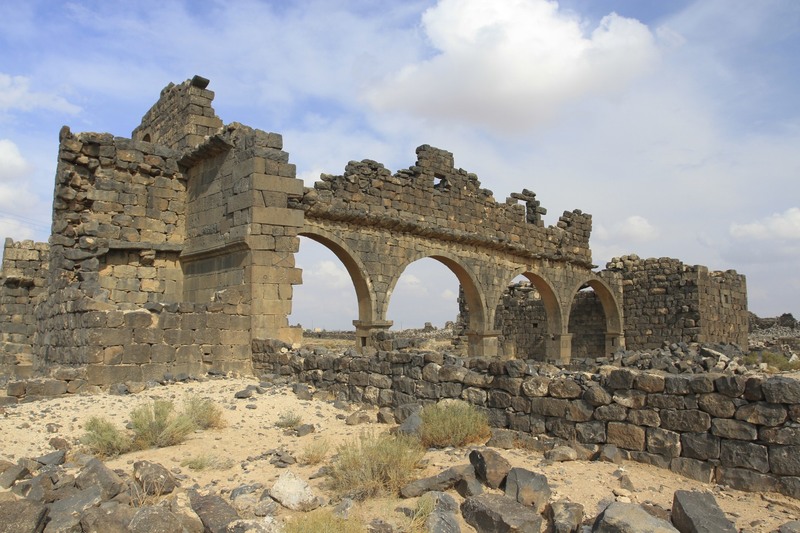 Lawrence was here with Bedouin forces fighting Ottoman rule, and trusting the British to make good on their promise of an independent Arab nation once the Turks were defeated. In traditional British style the Foreign Secretary, Arthur James Balfour, decided to make Palestine “a national home for the Jewish people” instead. This was the Balfour Declaration of 1917 (he made another in 1926 about something else), and it undermined all the promises made to the Arabs. The seeds of today’s dystopian Middle East were sown against a backdrop of colonial false promises, ever present European anti-Semitism and the birth of political Zionism calling for a homeland in Palestine. To be fair, Balfour was clearly an idiot who, having risen to the top of the British Establishment on the back of inheriting a fortune, felt he could manipulate countries and people at will. He is credited with the following remark, “Nothing matters very much and few things matter at all”. This is the man who once offered Chaim Weizmann, President of the Zionist Organisation and first President of Israel, a homeland in Uganda. That’s how detached from reality he was. It was his declaration that lent British support to the political process of turning Palestine into Israel. 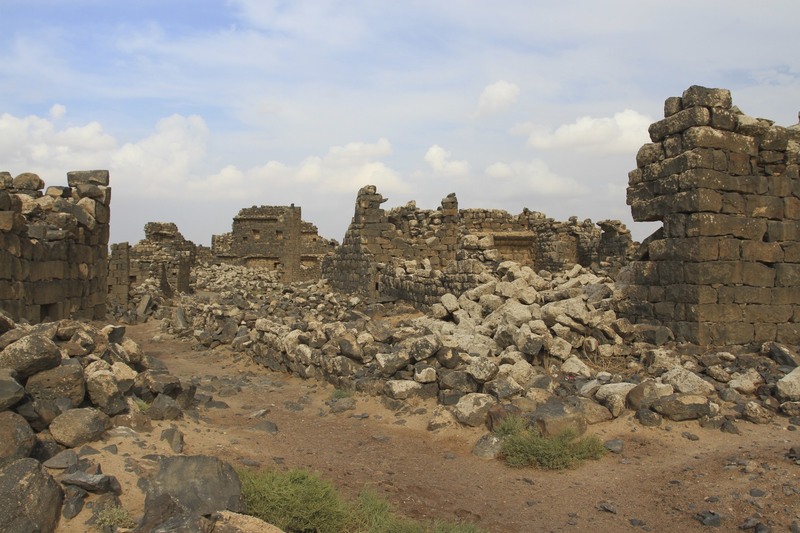 A visit to Qasr al-Azraq then, comes with a certain amount of baggage if you happen to be British. 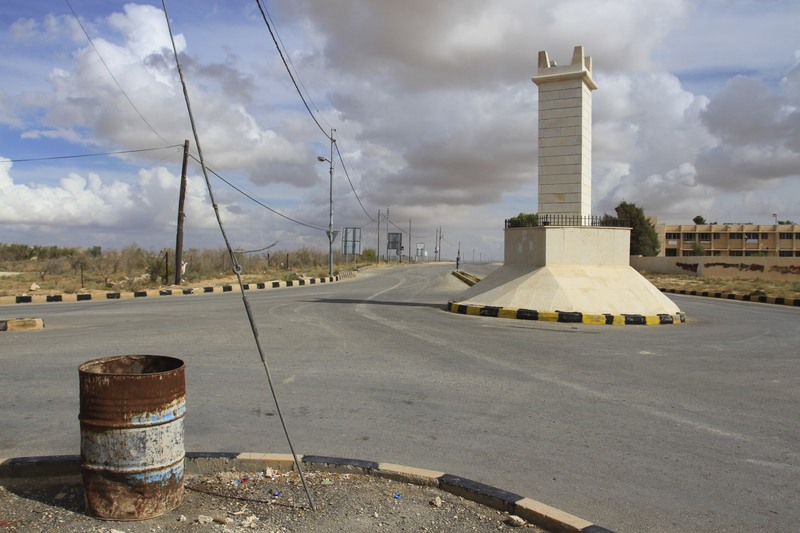 These misgivings gave way to a sense of disbelief as I drove through the truck stop town of Azraq. 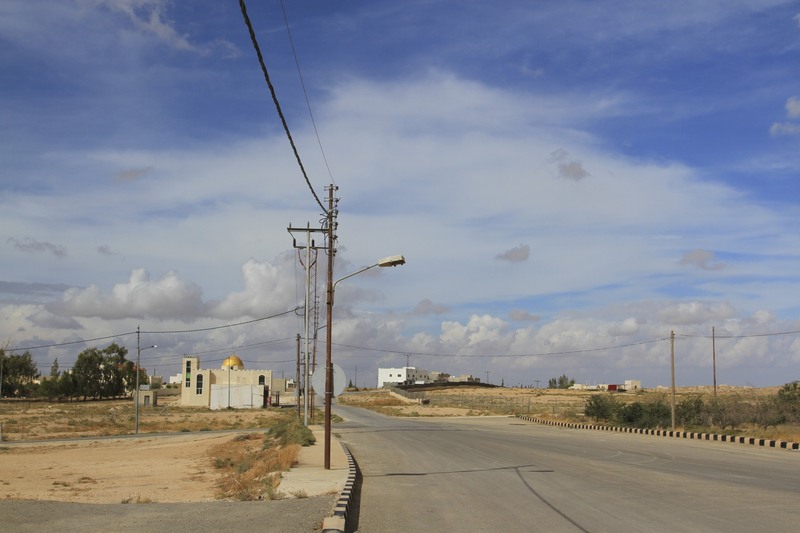 A life sapping place, Azraq was dirty, noisy and crowded with trucks. It’s hard to believe anything of beauty or interest could be found here. 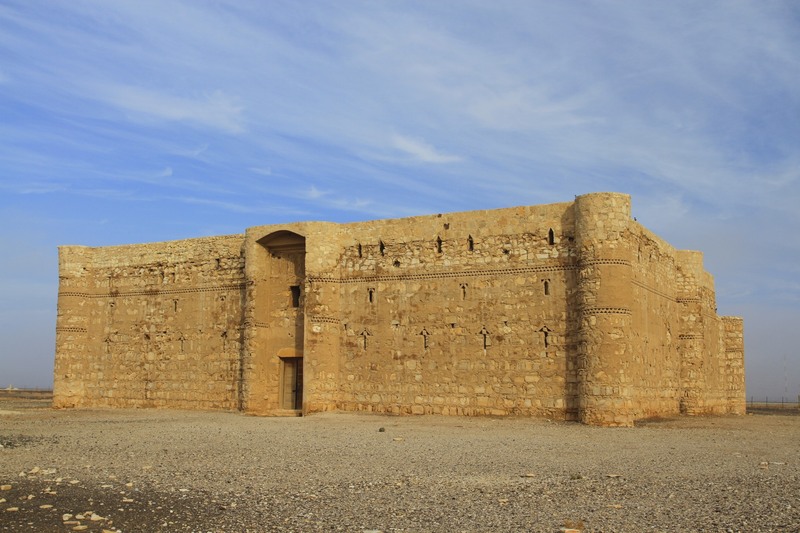 Yet Qasr al-Azraq is a thing of beauty. 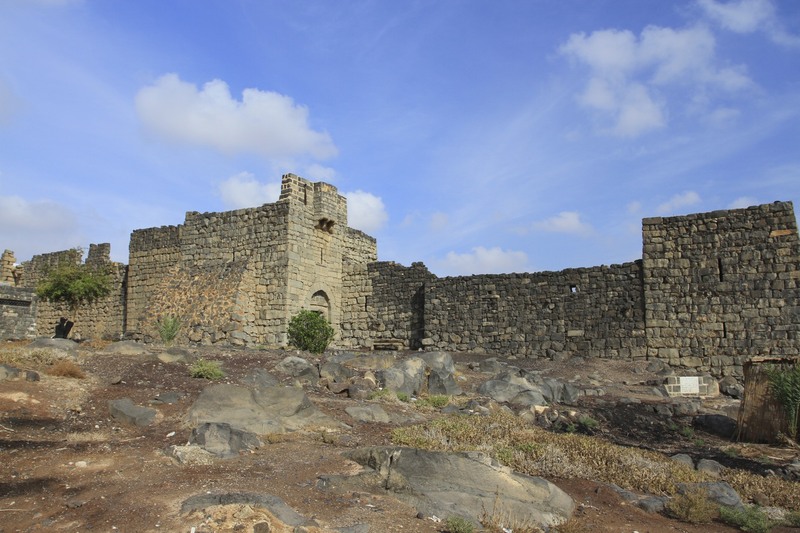 Built from black basalt it’s an imposing fort that is surprisingly large on the inside. 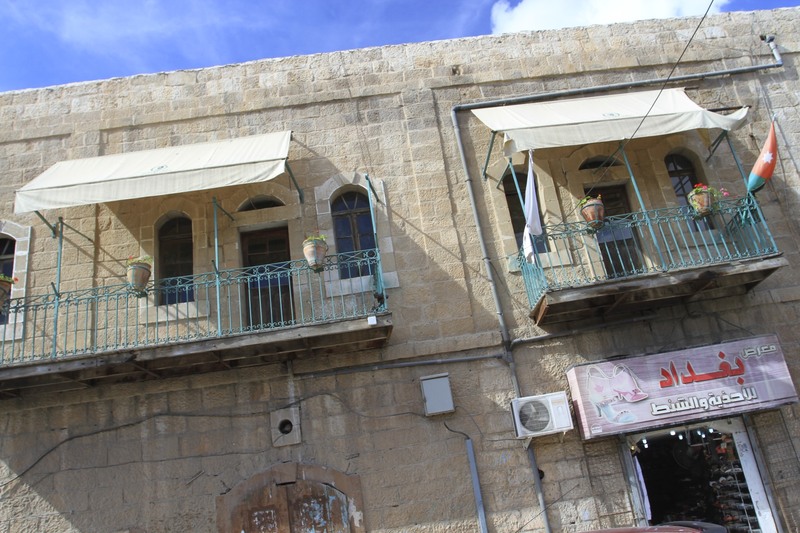 The building is Arab but dates back to an earlier Roman fort. 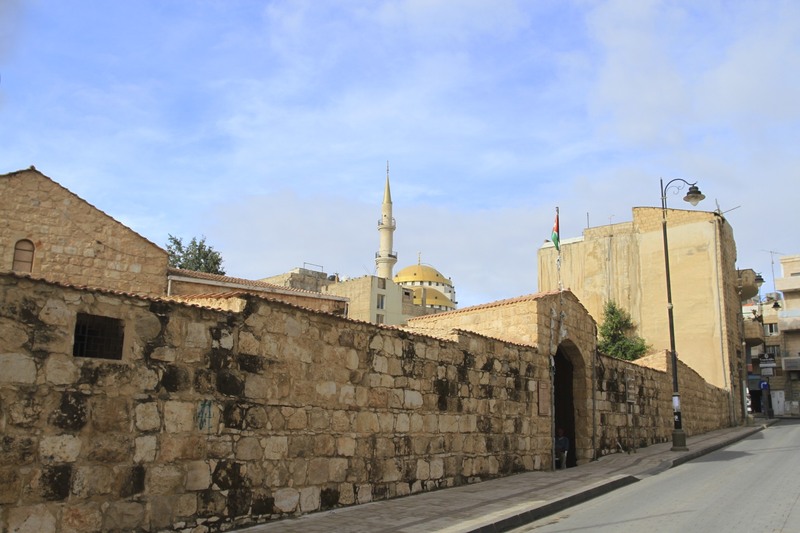 In the centre of the courtyard is a 13th Century mosque, built on the ruins of Byzantine church when the fortress was a defence against Crusaders. 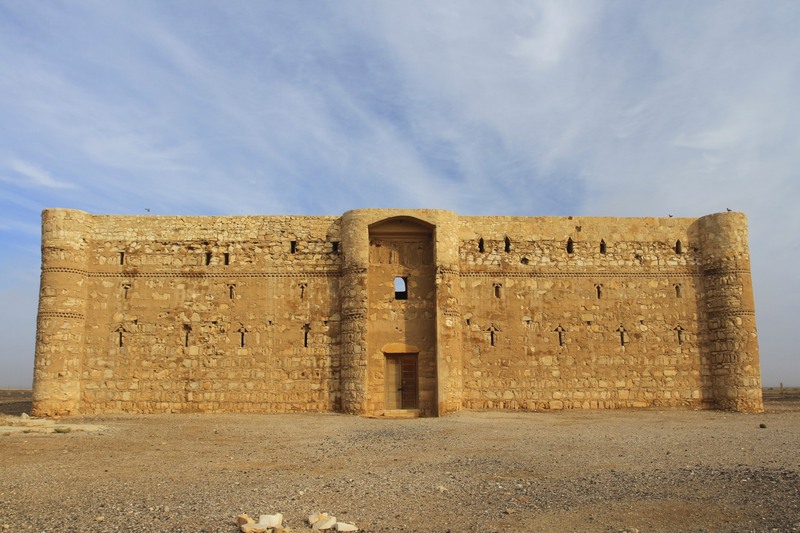 Qasr al-Azraq has witnessed a lot of history. 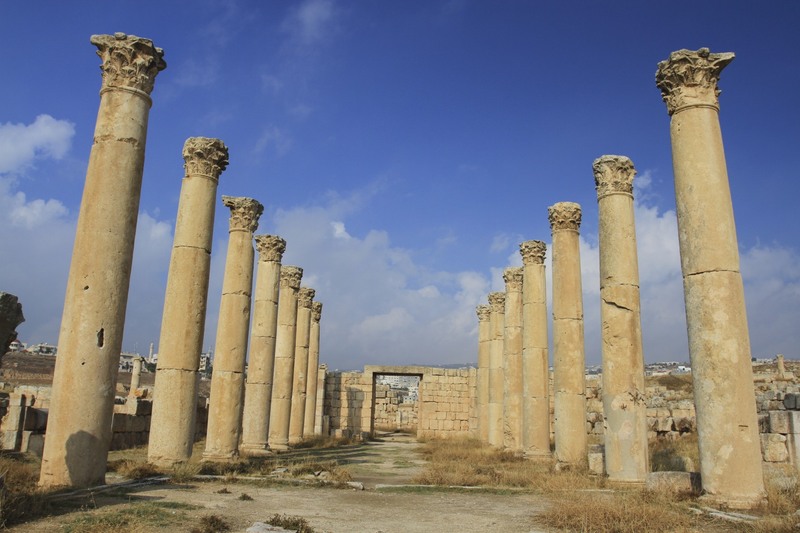 I was forced to read the Seven Pillars of Wisdom when I was at school in which Lawrence discusses Qasr al-Azraq at length, but I don’t recall much of it now. 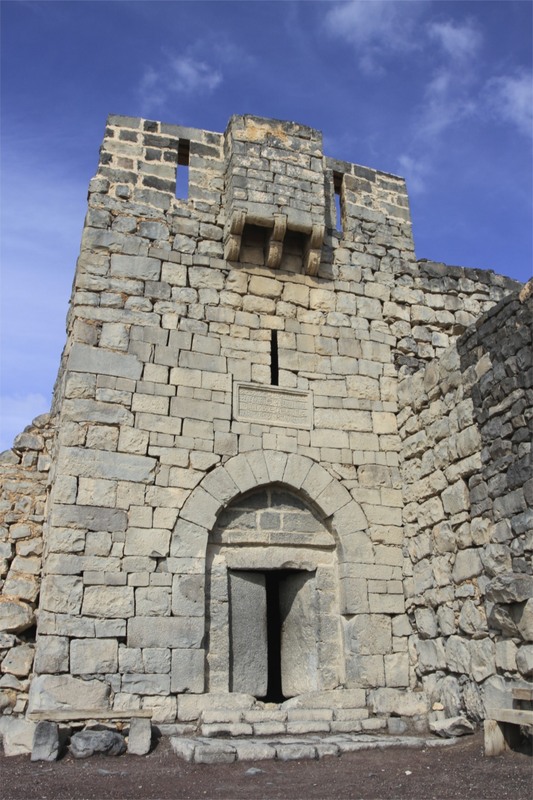 In a part of the book he describes the immense lumps of basalt that serve as the door to the fortress. Seeing it, I can imagine it would leave an impression. I’d had the place to myself but as I left a group of four Russian tourists arrived and we chatted about how few tourists there were. 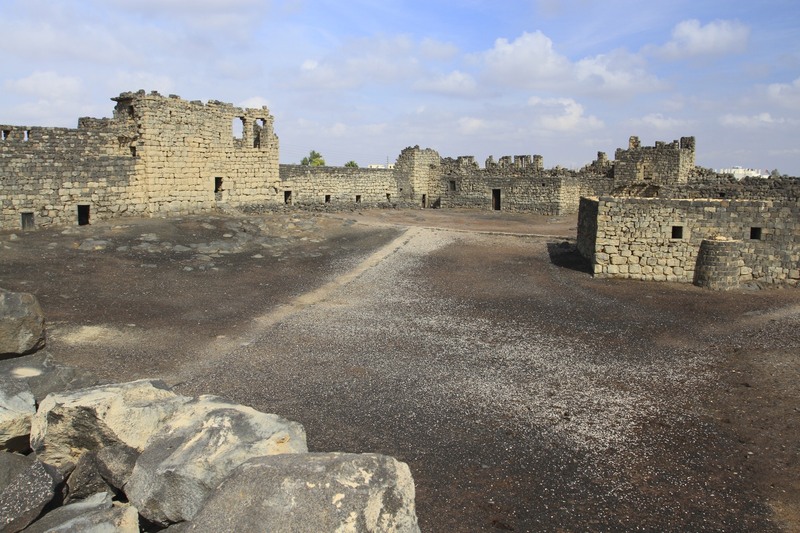 The guides who work at Qasr al-Azraq didn’t even bother coming out of their office to try to extract some dinar from us. Strange times. 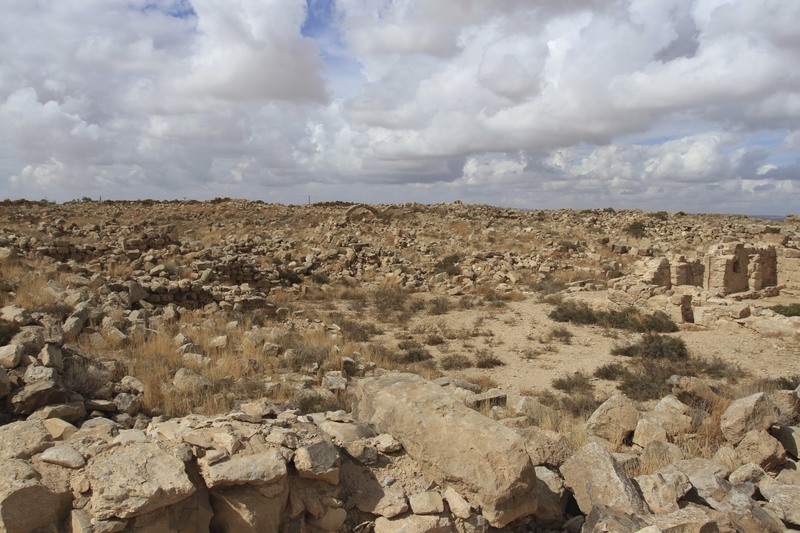 The opening line of Samuel Taylor Coleridge’s poem, Kubla Khan, one of the most famous in the English language could have been written about Jordan’s eastern desert. Yet the poem’s subtitle, A vision in a dream. 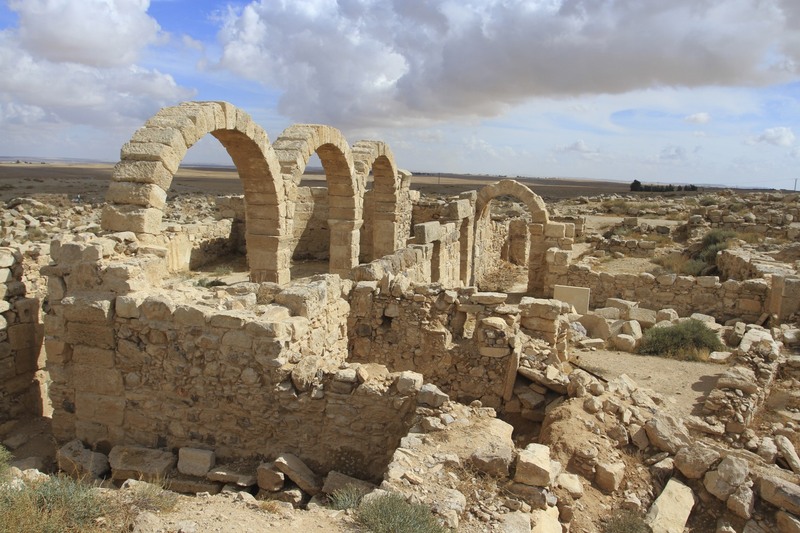 A Fragment, better describes my search for ancient Arab forts, pleasure palaces and even older Roman and Byzantine outposts, in the vast and atmospheric eastern desert. This is a landscape that can trick the eye and fool the mind. 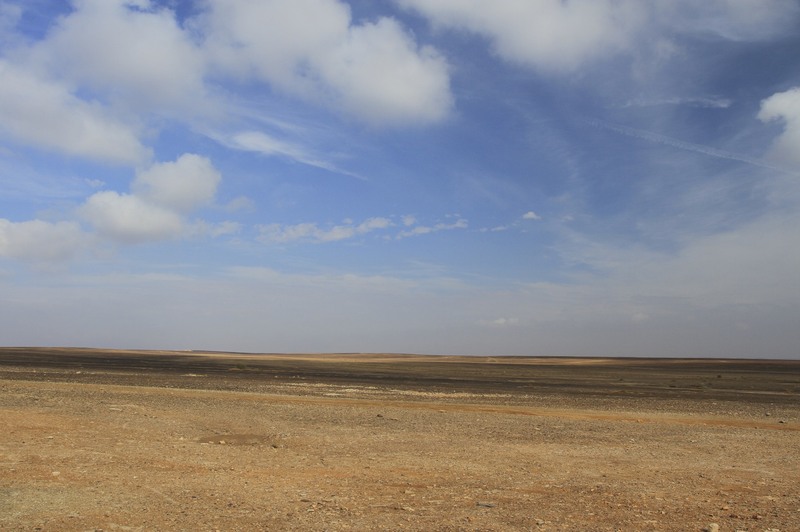 The ferocious sun and the endless flat red-brown desert can easily disorient, and the sight of a magnificent pleasure palace standing in the middle of this blasted landscape is dreamlike. If you’d been travelling for weeks across the desert on a camel you might start to question your sanity. I faced a more surreal problem as I drove into the desert: a thick desert mist obscuring everything. A wall of white blanketed the entire area and visibility was minimal. 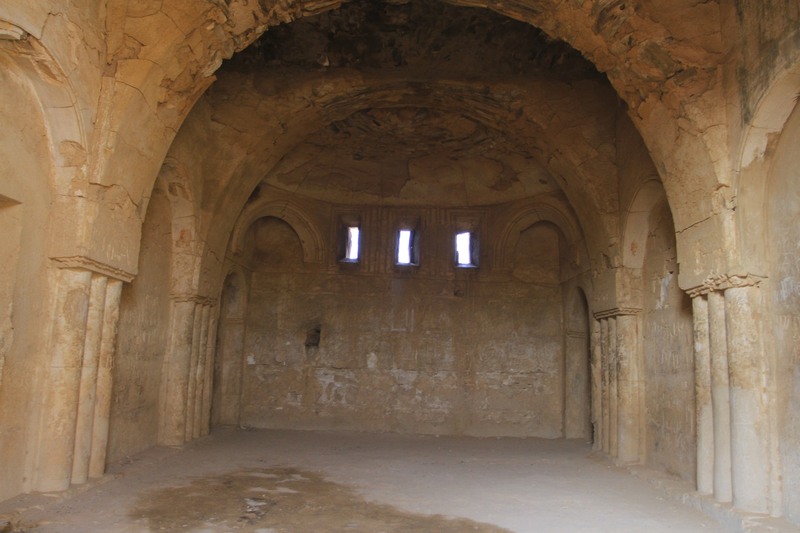 So dense was the shroud of mist that I actually passed Qasr Kharana without seeing it, remarkable given it’s size and the fact that it’s only about 100 metres from the road. 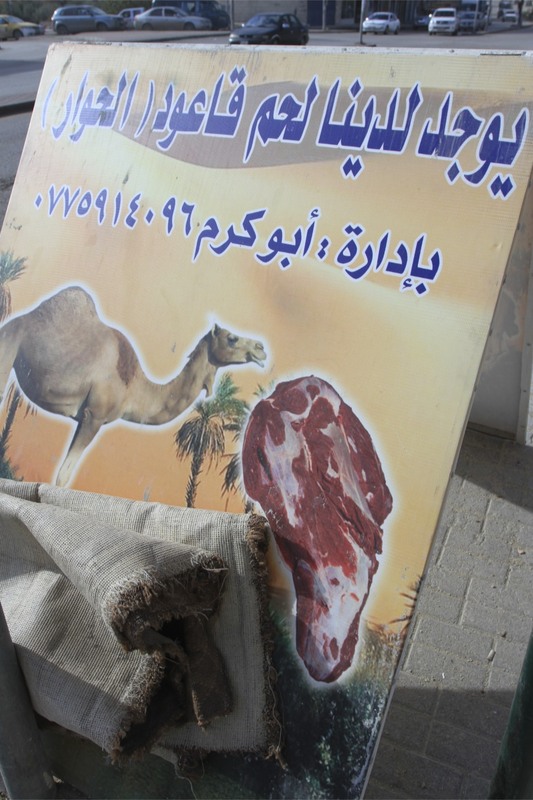 I stopped at a police post and asked where I’d find Qasr Kharana. The policeman laughed and pointed me back in the direction I’d just come from. As I drove back the mist began to clear and I realised why he found it so funny, in normal weather it’s impossible to miss this spectacular building. 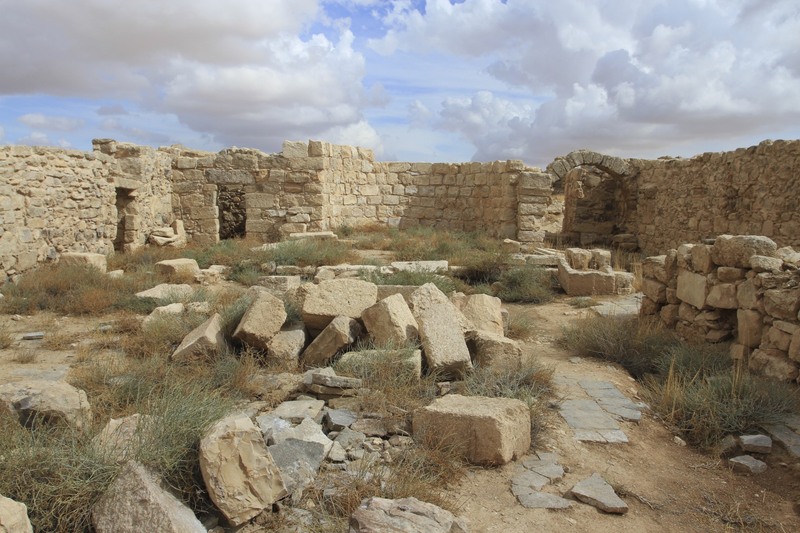 Built in the 7th Century, the purpose of Qasr Kharana has been lost in the ‘mists’ of time: a fort to protect trade; a pleasure palace for the Umayyad Caliph Al-Walid who ordered its construction; or perhaps a safe haven for travellers to spend the night? Or possibly all three. What is true is that as the mist lifted, the yellow-brown stone glowed in the early morning sun. A beacon in the desert. Not for the first time on my trip I was the only person there. As I parked the car a guard came out to say ‘hello’ and direct me to the entrance. 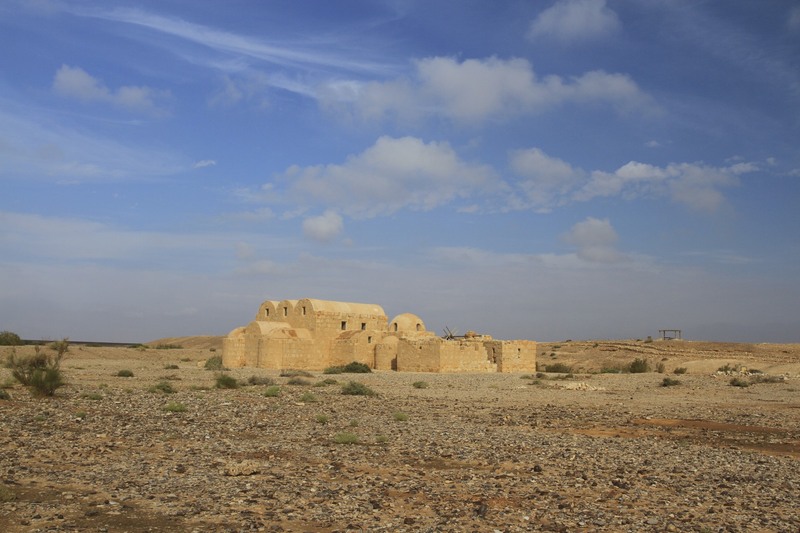 Qasr Kharana stands forlornly in a barren landscape, proof that ‘civilisation’ once existed in the desert. 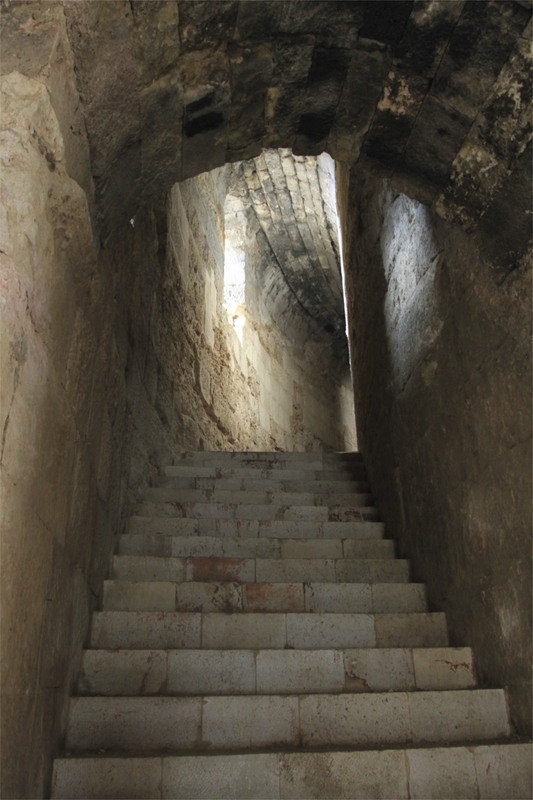 I walked up to the front gate and pushed it open, an arched entrance led into a courtyard and stairs led to the upper floors. I had a desert fortress to myself. 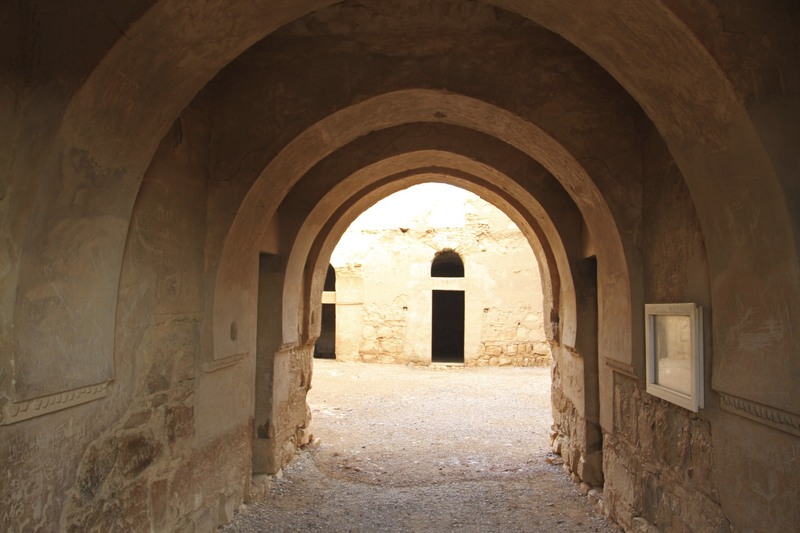 Despite the occasional truck thundering past on the nearby road – headed for Iraq or Saudi Arabia – walking around Qasr Kharana in the silent desert morning was an eery and atmospheric experience. Leaving, I closed the door behind me so the next person would have the pleasure of opening this door into another world. 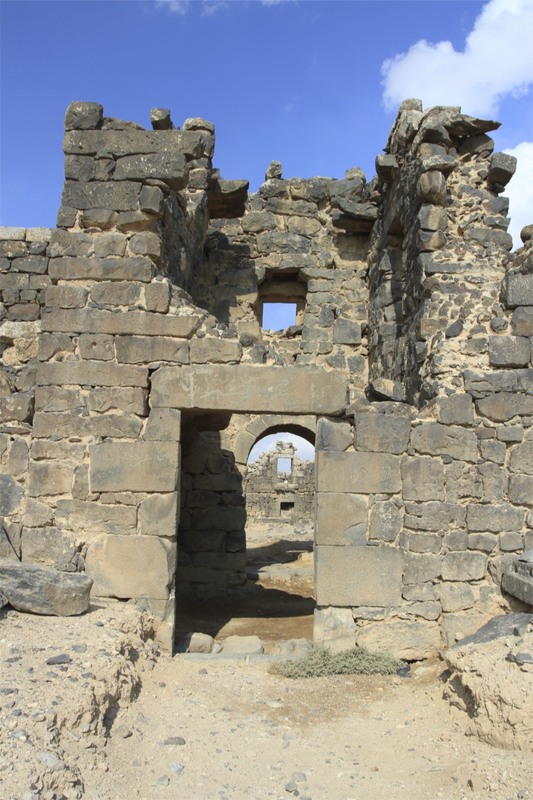 Back in the car I headed east towards the UNESCO World Heritage Site of Qasr Amra. 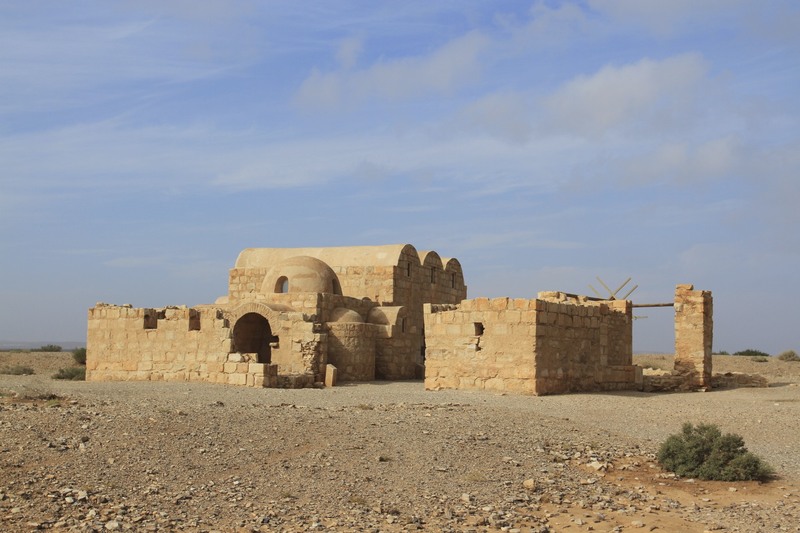 The exterior of this desert pleasure palace doesn’t look anything special: quite small, one story, three arches adding a touch of intrigue. 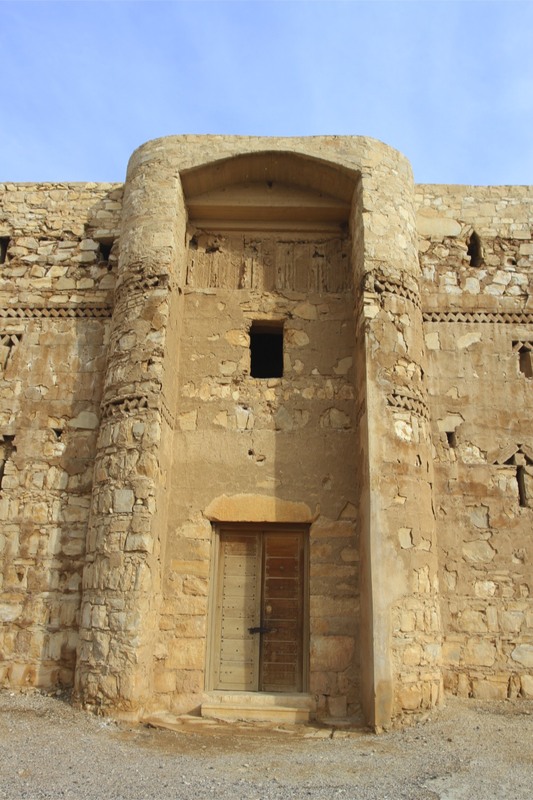 This plain facade hides an extraordinary interior though, one that truly deserves its World Heritage status. 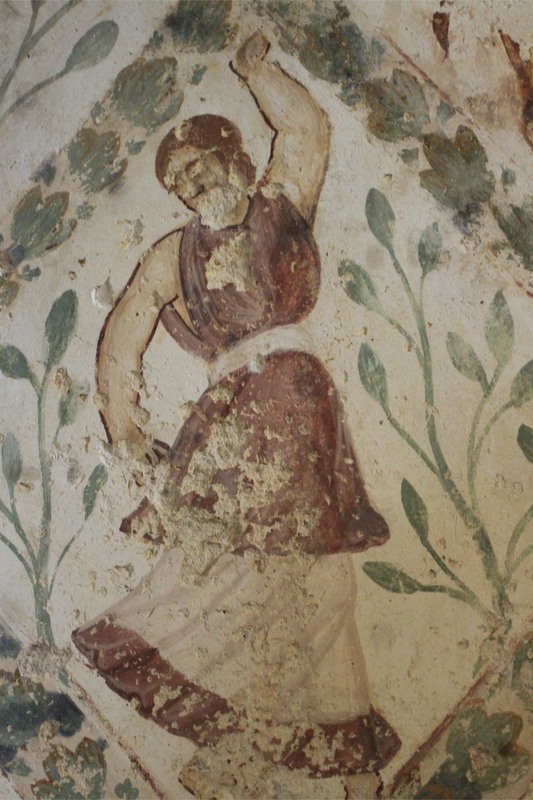 Decorating the entire interior are colourful frescos which include some extremely risqué exotic (and naked) female dancers, musicians, hunters, fishermen as well as more ordinary decoration of flowers and animals. 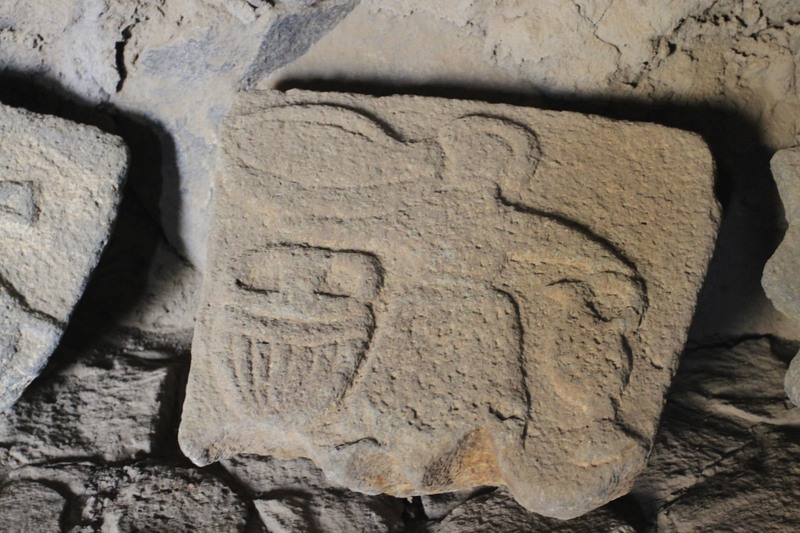 Amidst these fantastic scenes is a bear playing a banjo being applauded by a monkey. Apparently the Umayyads enjoyed a varied selection of entertainment. It’s a small miracle that these images haven’t been destroyed. They’re forbidden under Islam and that they survived to give us an insight into 7th Century High Society is extremely fortunate. 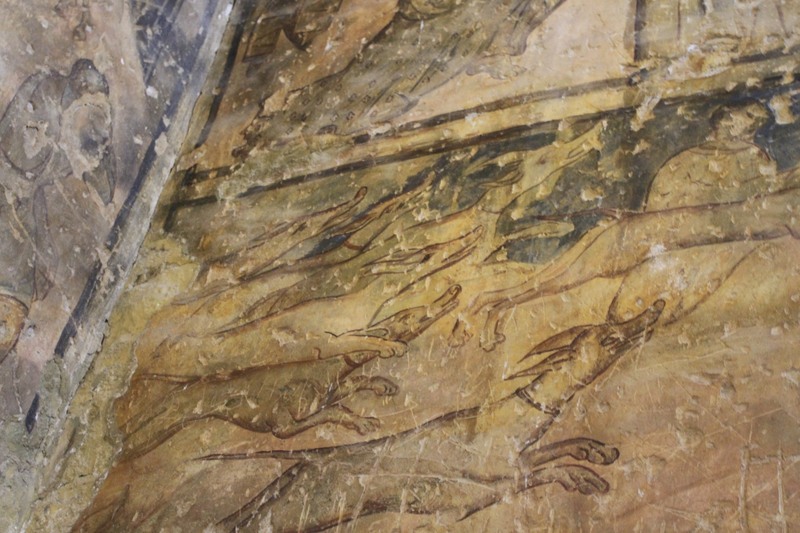 If ISIS ever make it this far south we can say goodbye to the frescos for ever. 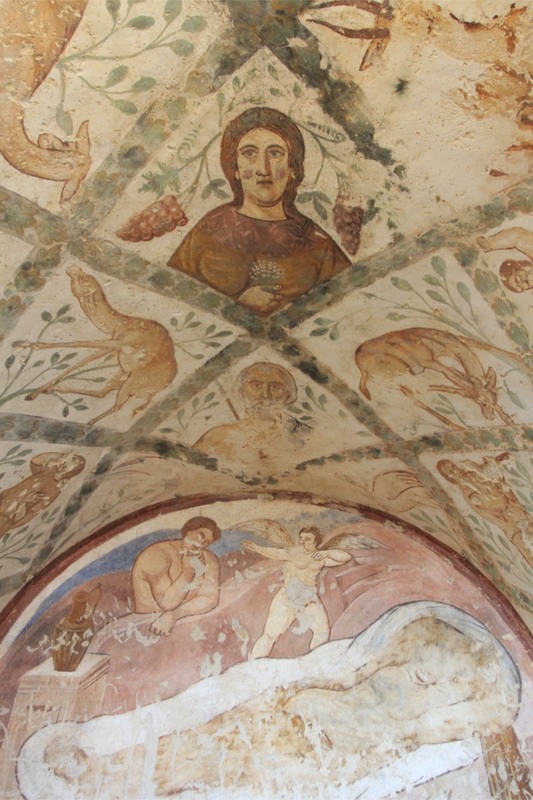 For the time being a team from an Italian university are restoring them to their former glory – they’ve suffered from generations of graffiti and neglect. 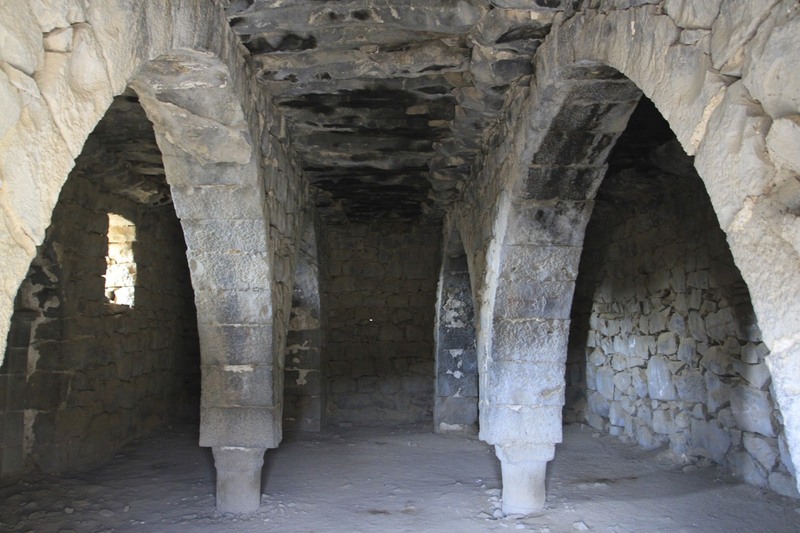 The building is home to a deep well that provided water to the occupants and passing caravans. 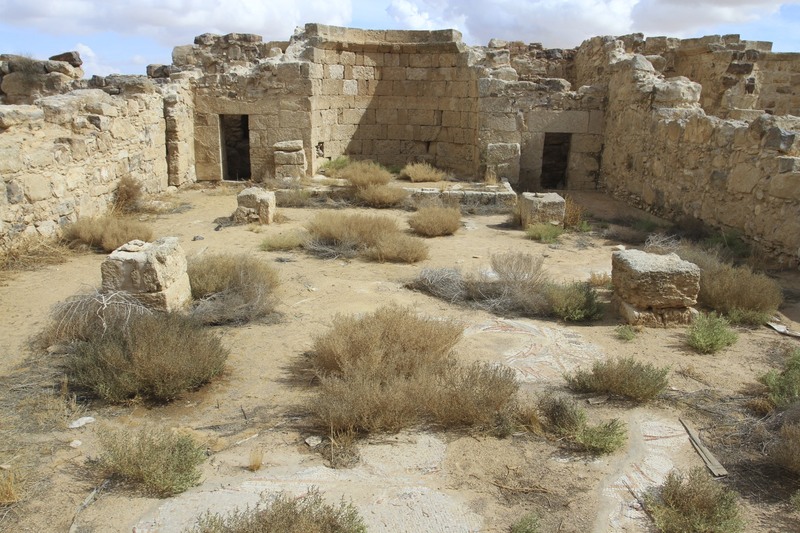 It also gives a hint that Qasr Amra contained a bathhouse, making it by some estimates the world’s oldest hammam. The visitors’ centre, like many others I visited, was closed with no one collecting ticket fees. I’d happily have made a donation but there was no one to give it to. 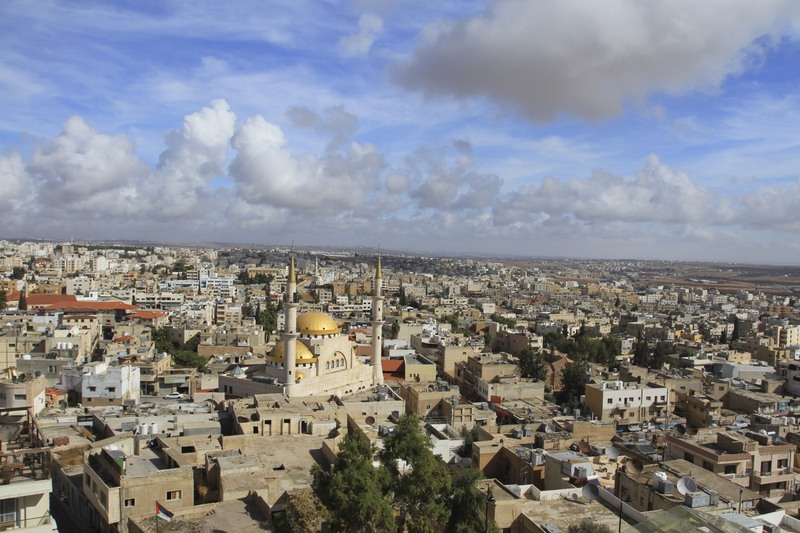 Madaba gave me a fresh view of both the history of this region and how, even in the current climate of instability and war, it’s possible to build a Middle Eastern society that is tolerant, where people of different faiths can live side-by-side. 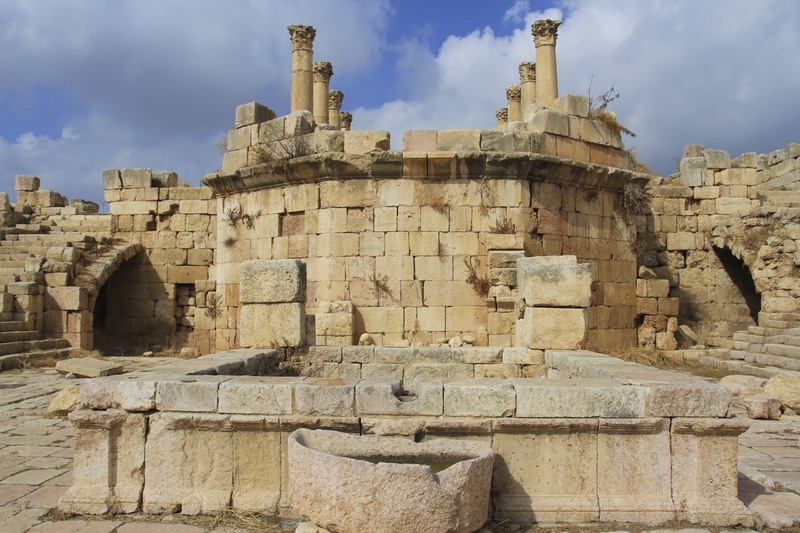 It’s in part a thoroughly modern city and in part a throwback to an era when the Byzantine Empire dominated this region. 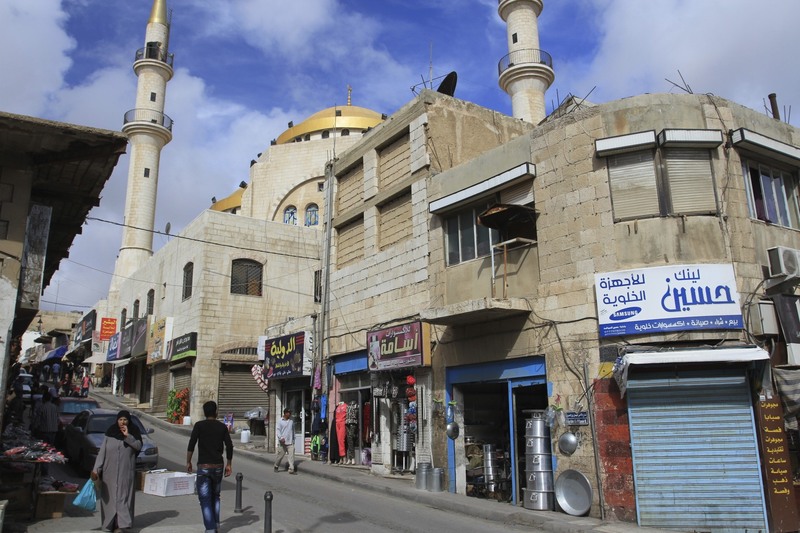 Madaba brings Jordan’s peculiar problems into focus – a quiet country in a noisy neighbourhood, peaceful coexistence undermined by events elsewhere. At least that’s how it felt when I was walking the streets. Stand still for too long and someone will come along to find out how they can help you. 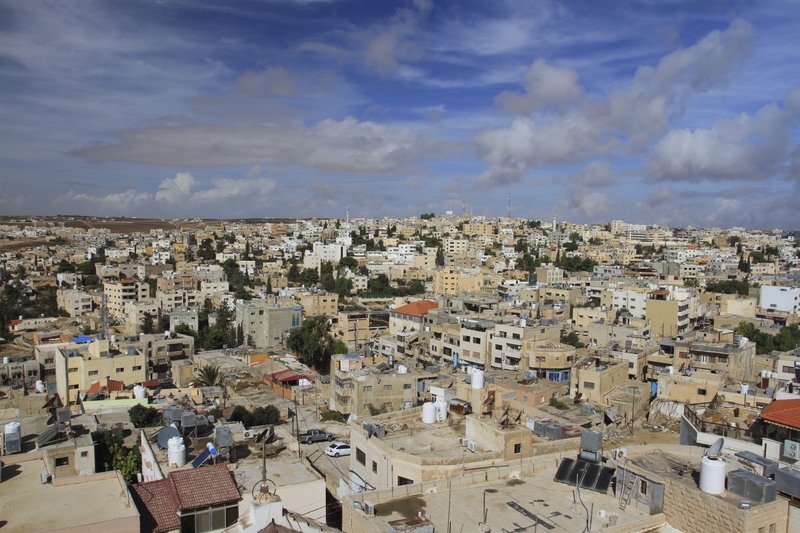 Jordan’s that sort of country, Madaba’s that sort of town. There’s an alternate story of course: per capita more Jordanians are fighting for ISIS than any other nation on the planet. 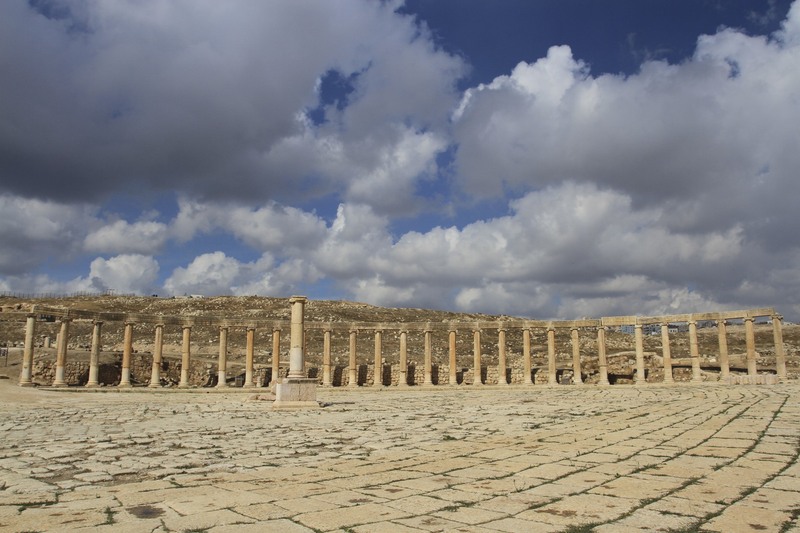 There have been pro-ISIS rallies in towns such as Ma’an, a stones throw away from Petra. This bodes ill for the future should the region becomes more unstable. 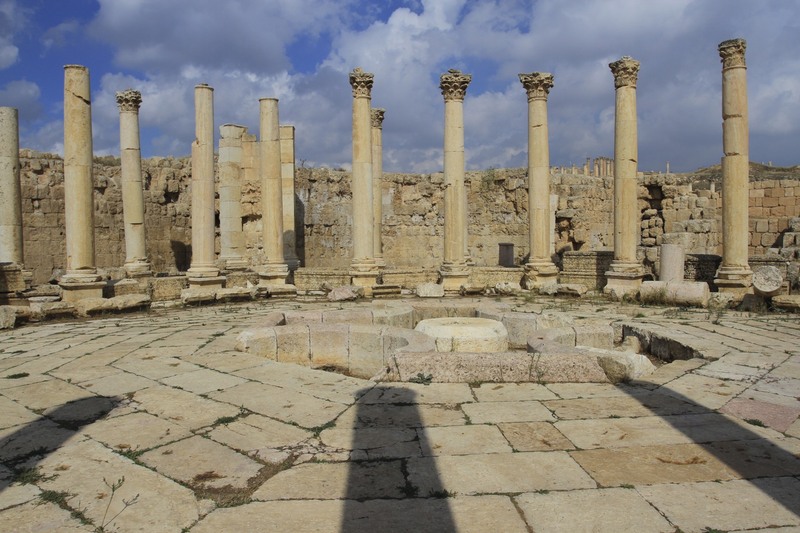 My experience in Madaba tells me we must do everything we can to stop that happening, including by tourists continuing to visit Jordan. 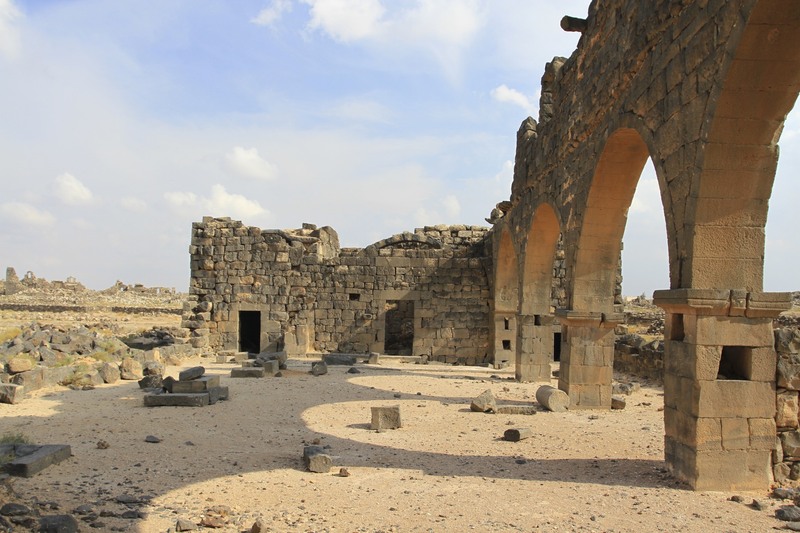 Thankfully Madaba is itself one of the best reasons for going to Jordan. I enjoyed my time here so much I stayed an extra night. It wasn’t a difficult decision, the town has one of the best restaurants in Jordan with a menu that would take a month to do justice to. 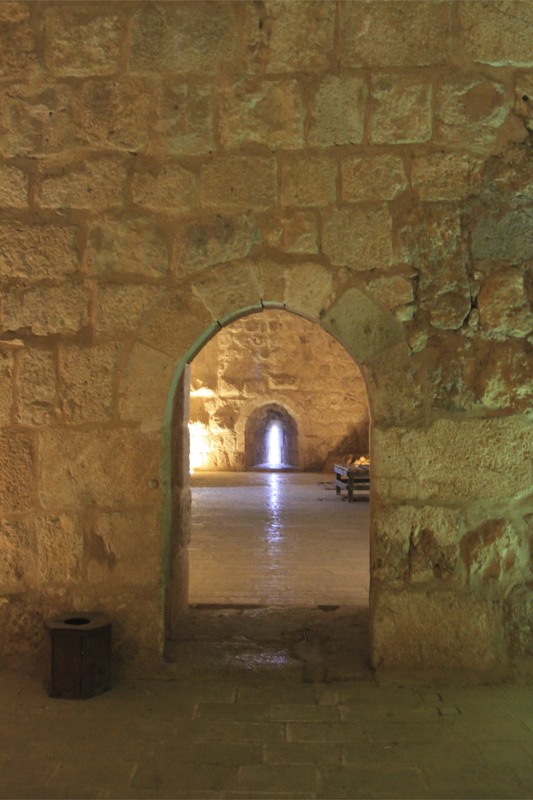 I sampled as much as I could in two days, including some decent Jordanian wines. When I wasn’t stuffing my face I was pounding the streets trying to work off the calories and visiting the many sights, historic and otherwise. 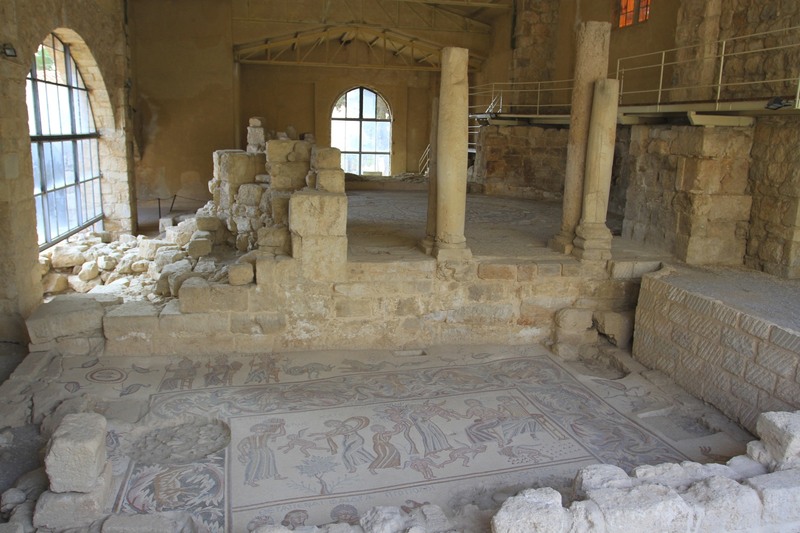 There are so many ancient Byzantine houses and churches that only a few have been excavated, even then it’s enough to keep you busy. 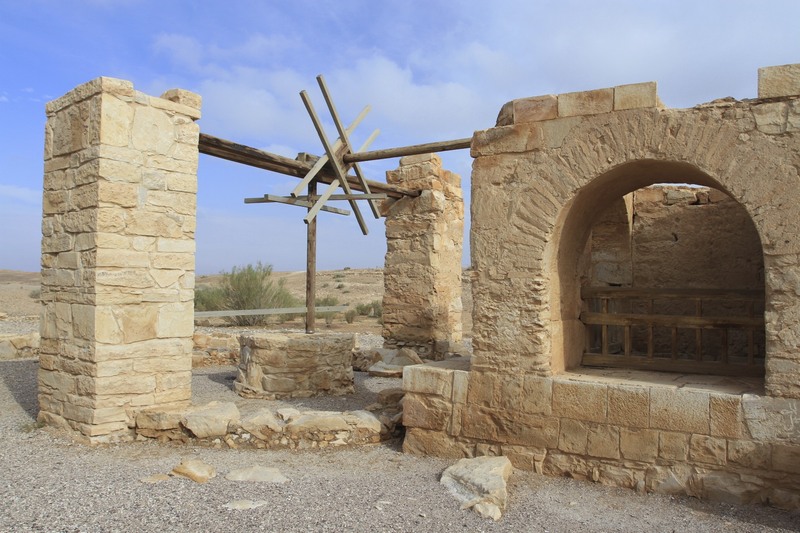 Given how many other attractions there are in the surrounding area Madaba could easily be a base for several days of sightseeing. The Church of the Virgin Mary was high on my list of things to see, its mosaics famous across the world, and for the fact that it incorporates the old Roman temple, giving it a unique circular shape. 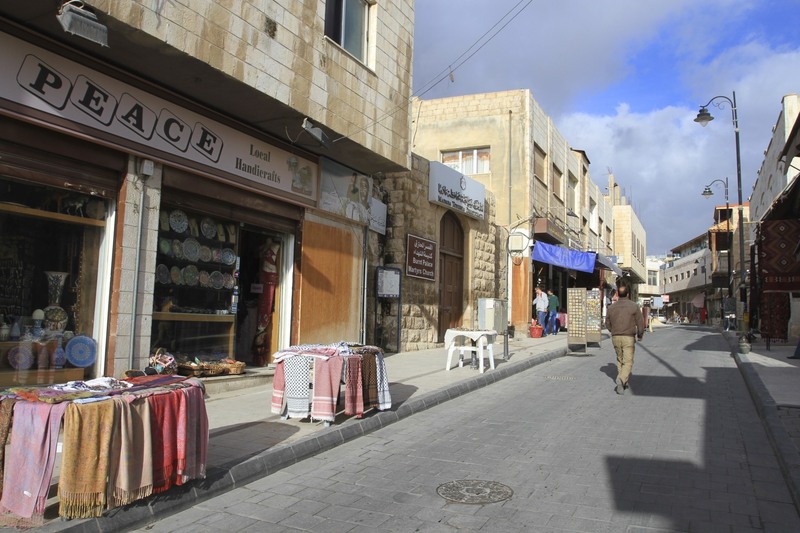 It’s also remarkable for having the original Roman road running alongside the church – it was on ancient Madaba’s main thoroughfare. 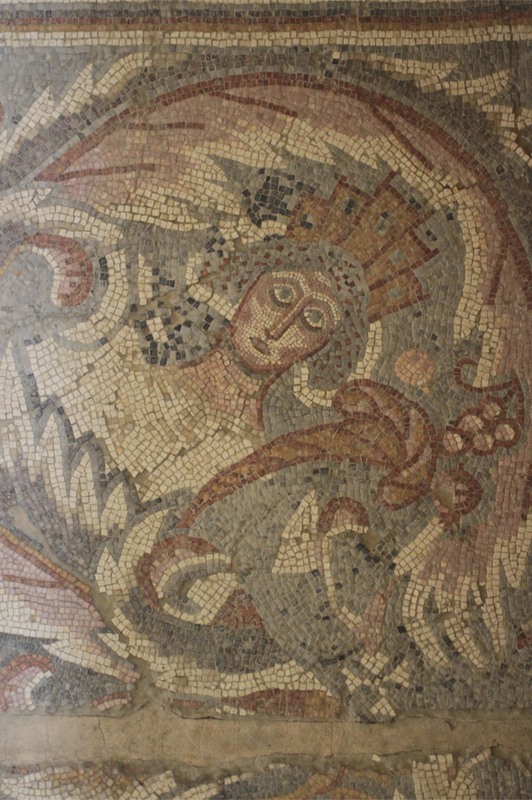 The mosaics are spectacular examples of both Byzantine and Ummayad craftsmanship. 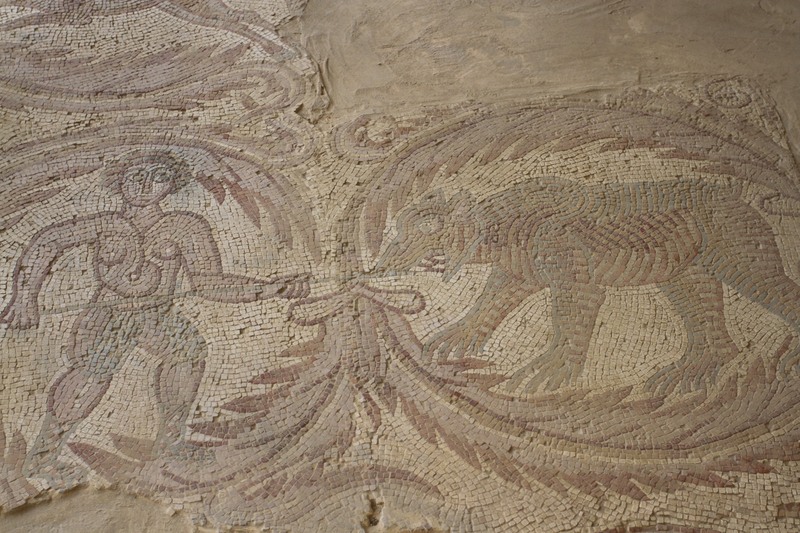 They include three cities – Rome, Gregoria and Madaba – represented as the goddess Tyche. 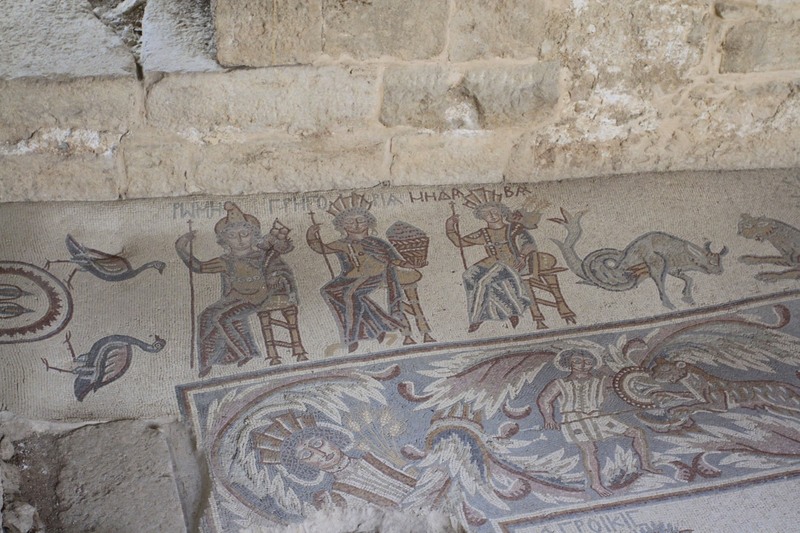 Other mosaics show people, biblical characters, angels, animals, plants and geometric shapes. Yet again, I had the place to myself. 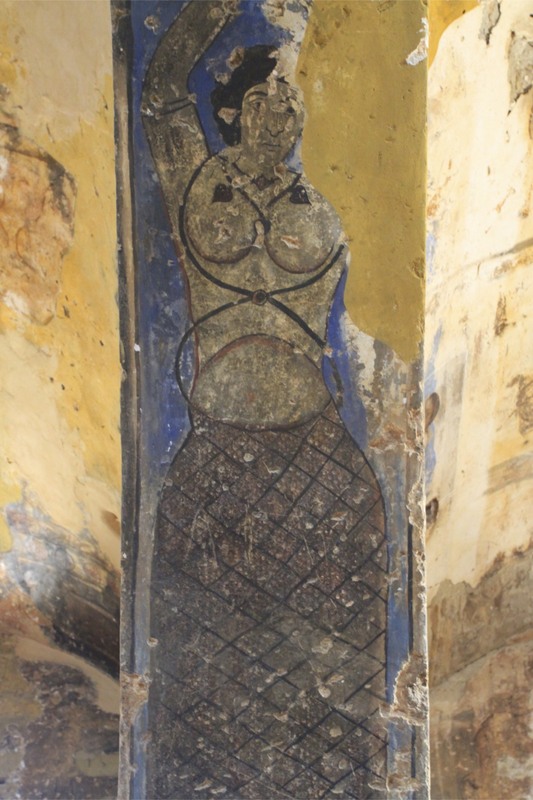 The central, circular mosaic in the nave contains a greek inscription: “If you want to look at Mary, virgin Mother of God, and to Christ whom she gave birth to, Universal King, only Son of the only God, purify your mind, flesh and works. May you purify with your prayer the people of God.” Quite an undertaking. 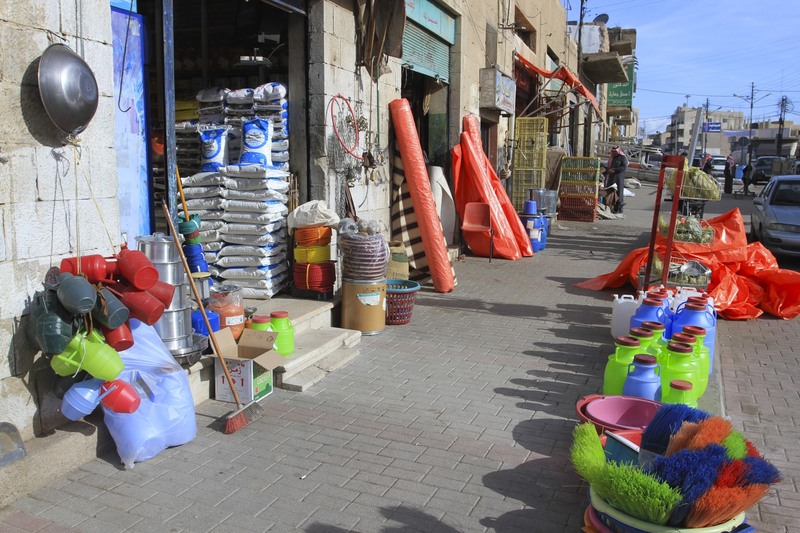 On my way to my next Byzantine delight, the Church of the Apostles, I wandered through the market area of Madaba, which was busy with shoppers and full of colour and noise. 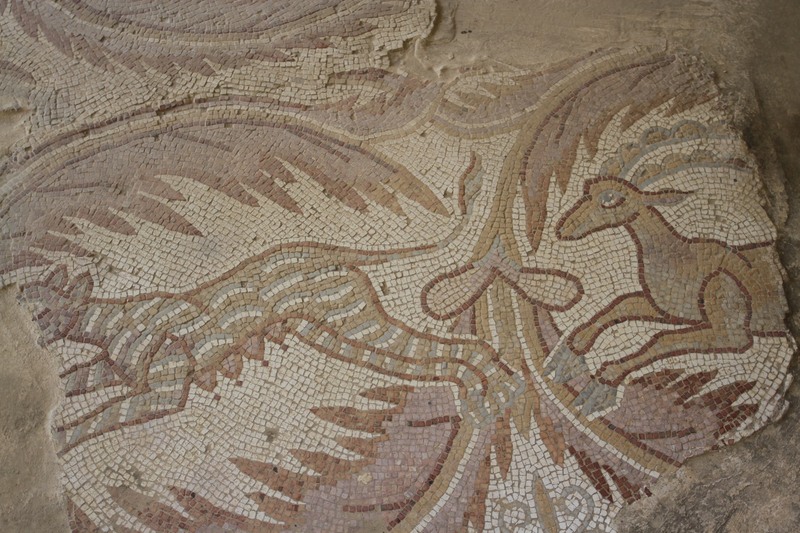 The Church of the Apostles was only discovered in 1902, less interesting than the Church of the Virgin Mary it has some exquisite mosaics. The informative curator took my camera and photographed them for me. I found my way to the Church of the Beheading of John the Baptist, notable for two things: 360º views over the city from the bell tower; and the most pleasant curator I’ve ever met. 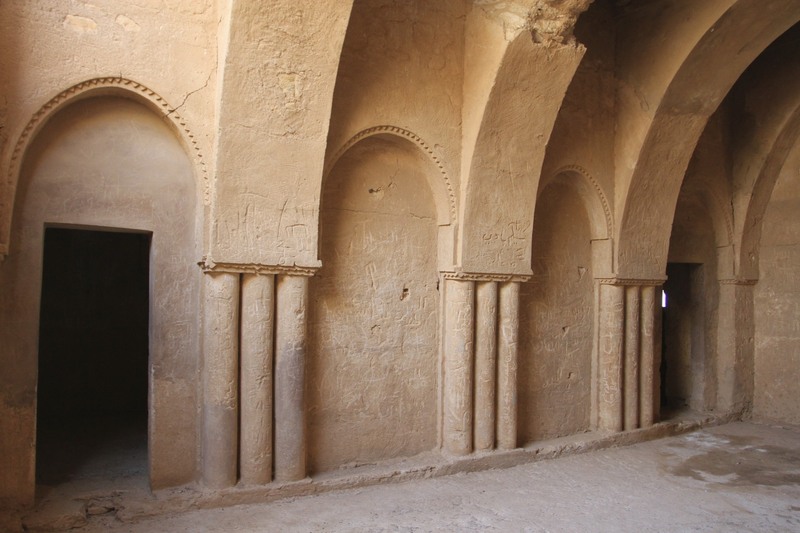 Since I was his first visitor of the day he talked me through the historic photos of Madaba when it was rediscovered in the late 19th Century. 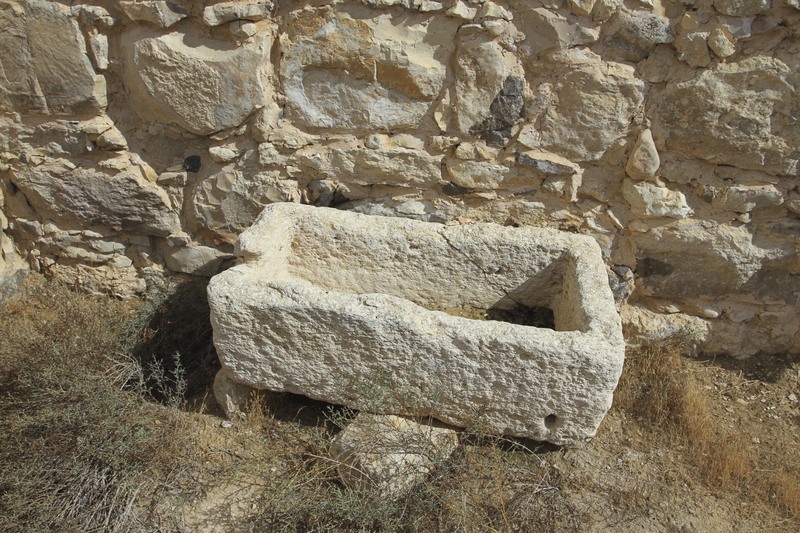 He even took me to the Byzantine era well and demonstrated it by pulling a fresh bucket of water. 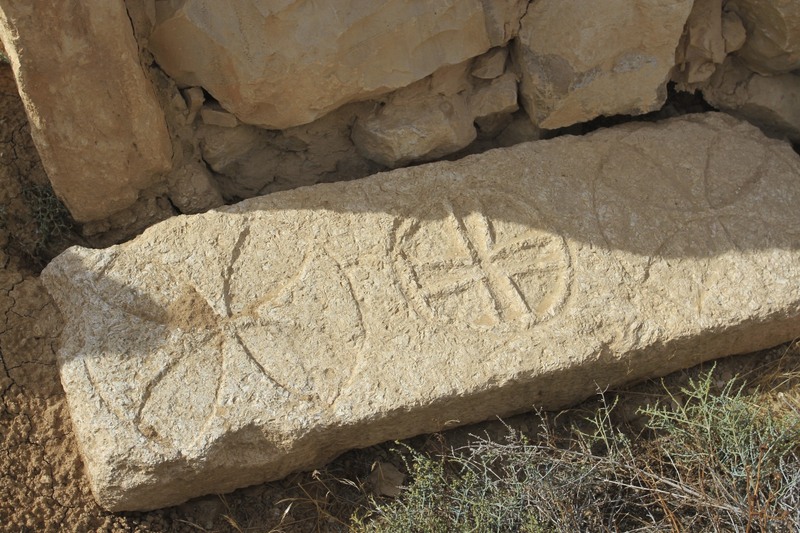 This was the spirit of Madaba in a nutshell. People going out of their way to help. 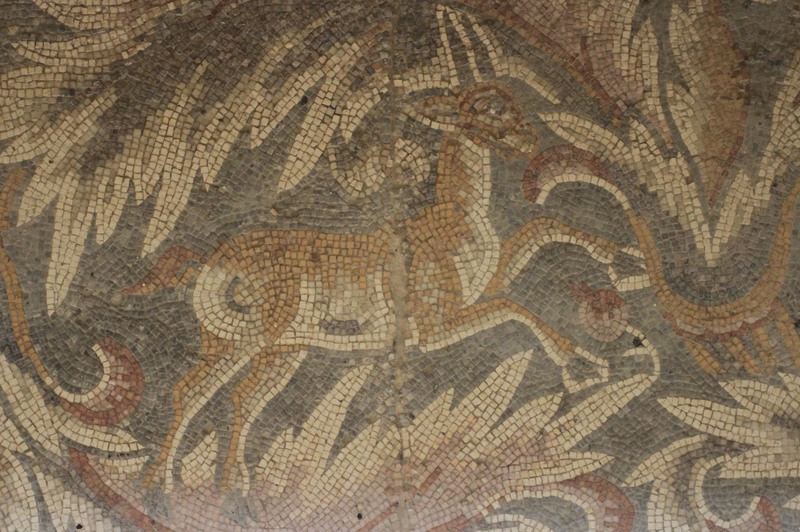 If you like mosaics I dare say you’ll enjoy this blog. 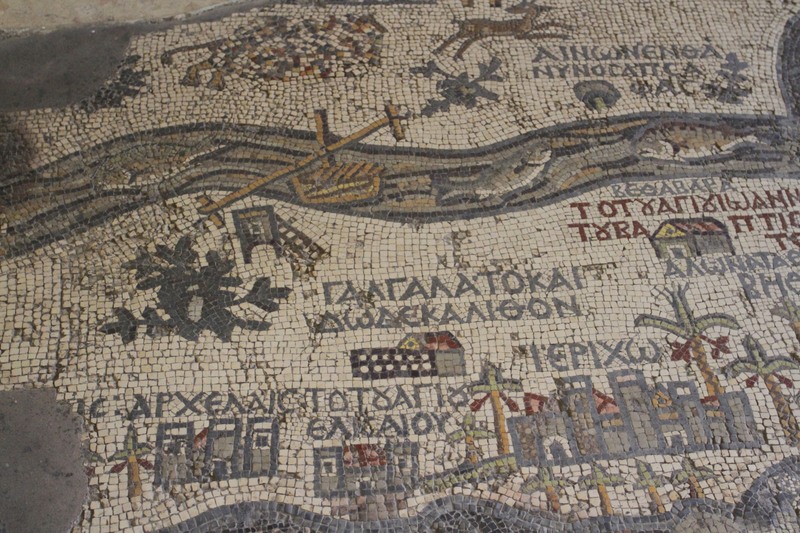 Madaba is a town of mosaics, the most famous of which is the startling map on the floor of St. George’s Church. 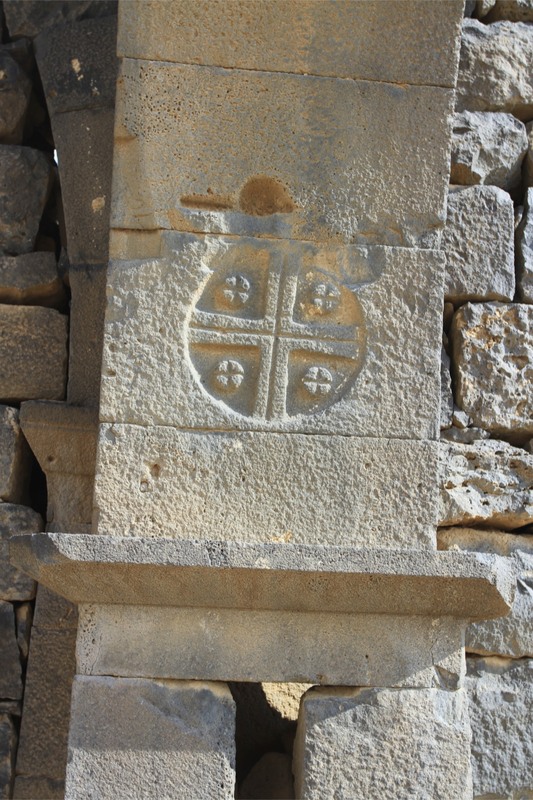 The town has numerous Byzantine-era churches dating from the 5th or 6th Centuries, that have slowly been unearthed by excavations to reveal something of their former glory. 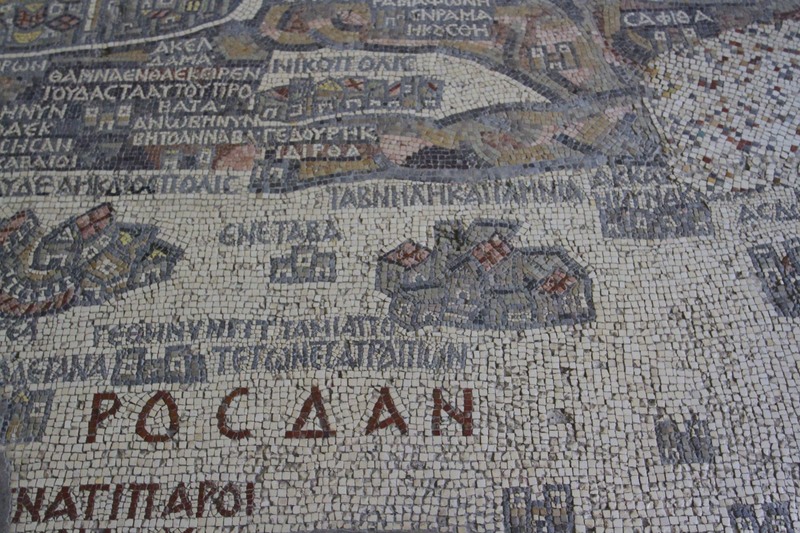 Madaba’s mosaic map is world renowned, and with good reason. 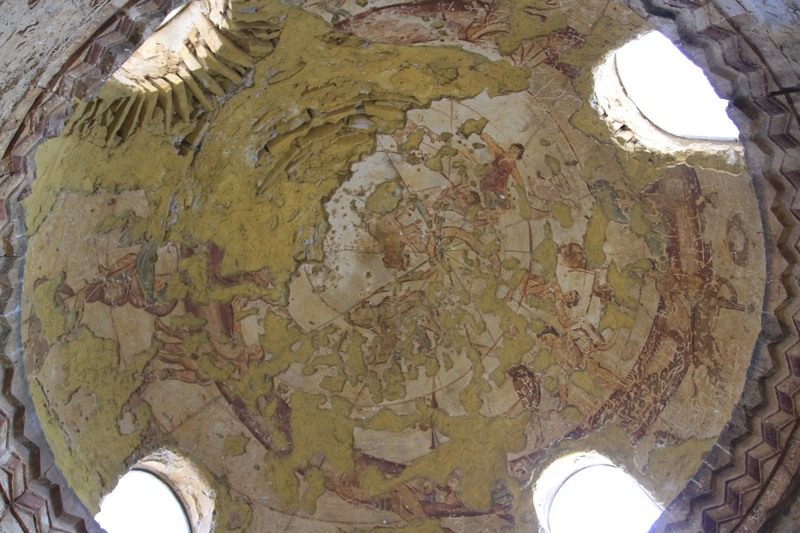 The map dates from the 6th Century and is the oldest surviving map of the Holy Land. 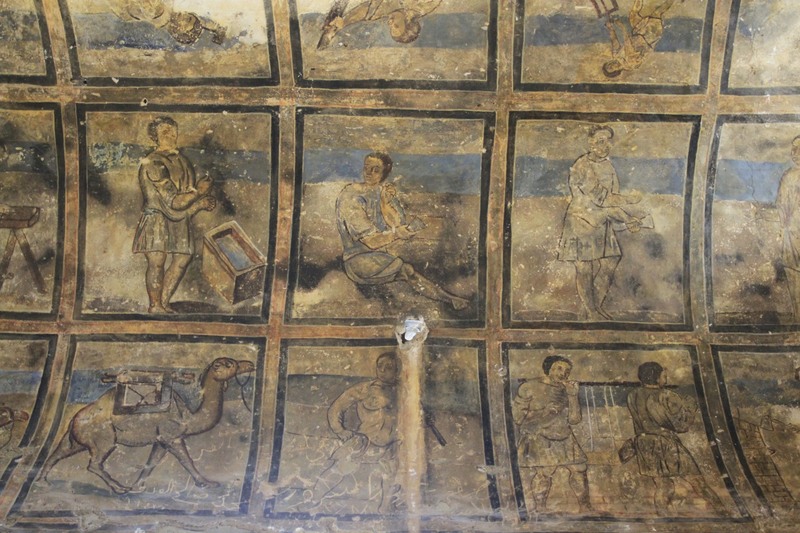 In total it depicts 157 of the most important Biblical sites from Egypt to Lebanon, including the Nea Church and Church of the Holy Sepulchre in Jerusalem. The mosaic once contained over two million separate pieces of tile, although I don’t know who counted. 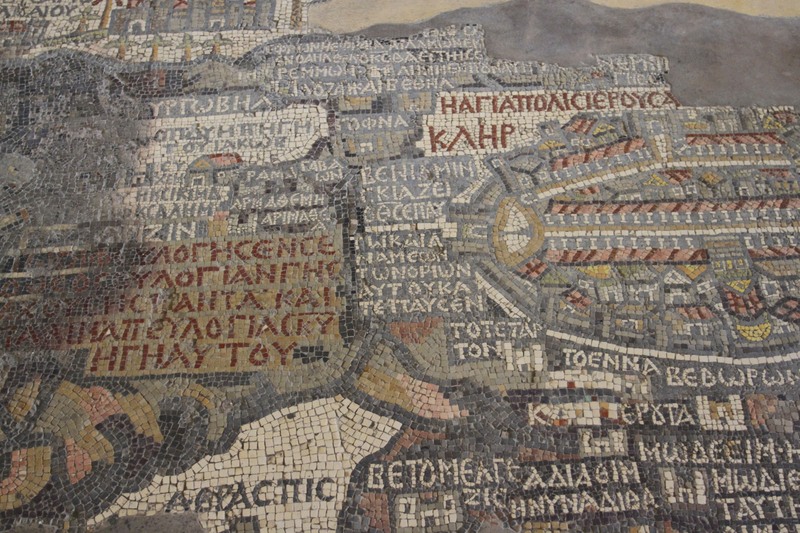 The mosaic map was only discovered in 1896, when a new Greek Orthodox Church was being constructed on the ruins of the earlier Byzantine Church. 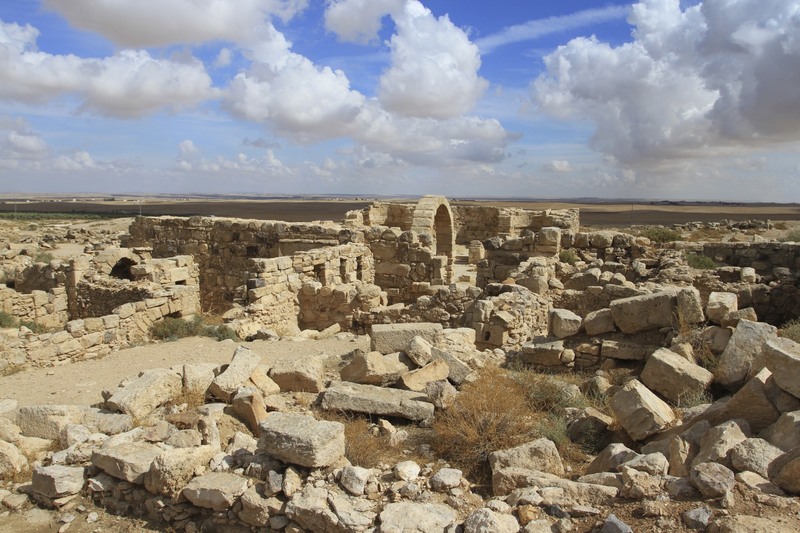 This hides an extraordinary fact: Madaba, a once great city, had been abandoned for over a thousand years after a devastating earthquake in 746AD; its ancient buildings – Roman, Byzantine and early Islamic – buried under rubble until being rediscovered in the late 1800s. 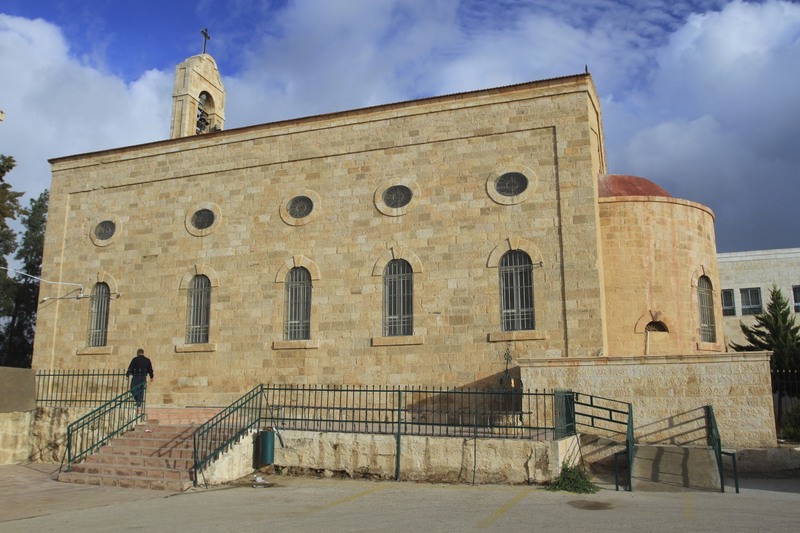 It was only when ninety Arab Christian families arrived in the late 19th Century following a wave of anti-Christian protests in Karak, that Madaba’s glorious past resurfaced. 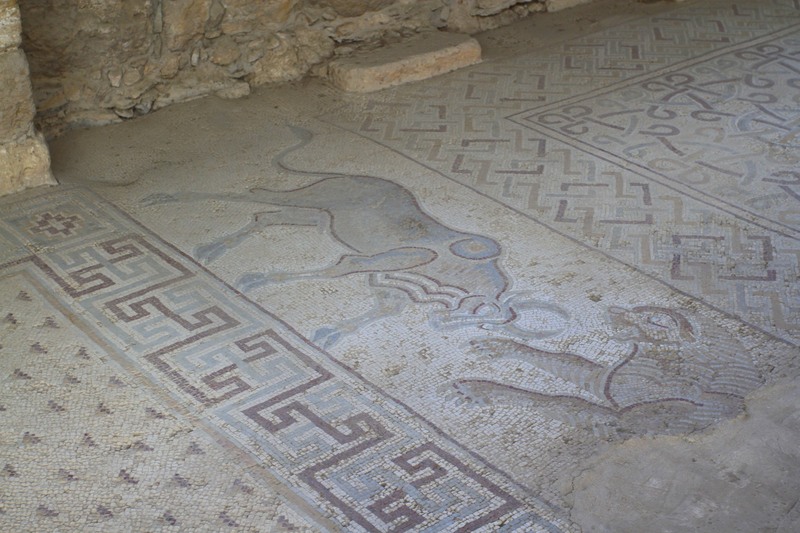 More mosaics and ancient buildings were uncovered as the new settlers cleared the rubble and dug foundations for their houses. 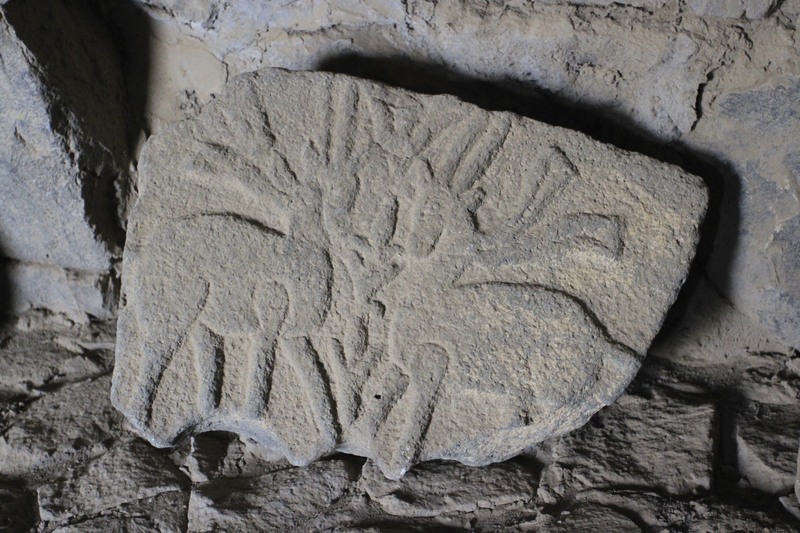 Within a year, news of the discovery reached Europe causing something akin to a frenzy of academic and public interest, and prompting a wave of early tourism. 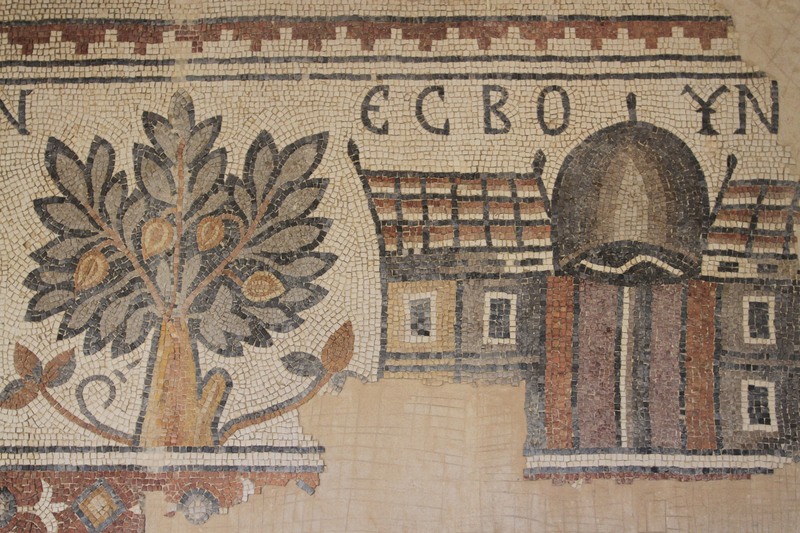 Madaba had gone from a pile of rubble to an international sensation almost overnight, its place in history cemented for eternity – or until the next earthquake. 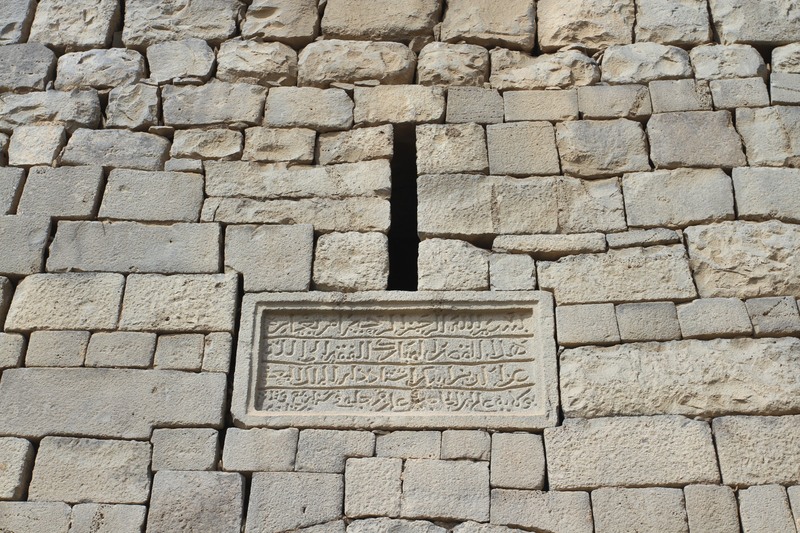 It’s remarkable that this wealth of history was lost for so long, but this seems quite common in Jordan. 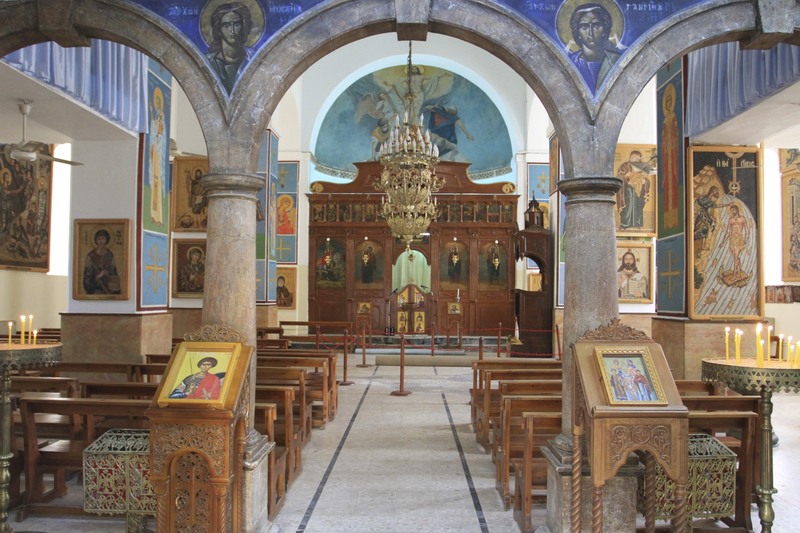 In the church that houses the Shrine of the Beheading of John the Baptist – well worth a visit – there is a small room filled with photos of Madaba from around that time. 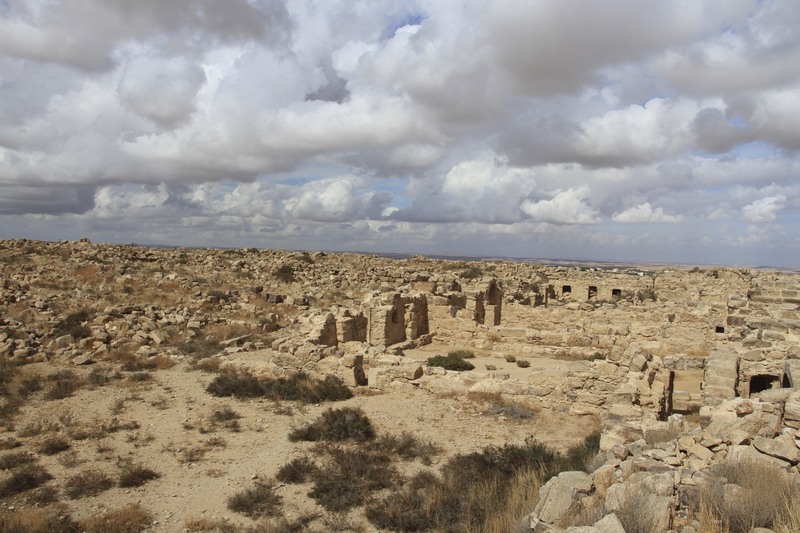 A few houses nestle amidst ruins that sit inauspiciously on a small hill in a vast landscape. Unrecognisable today. 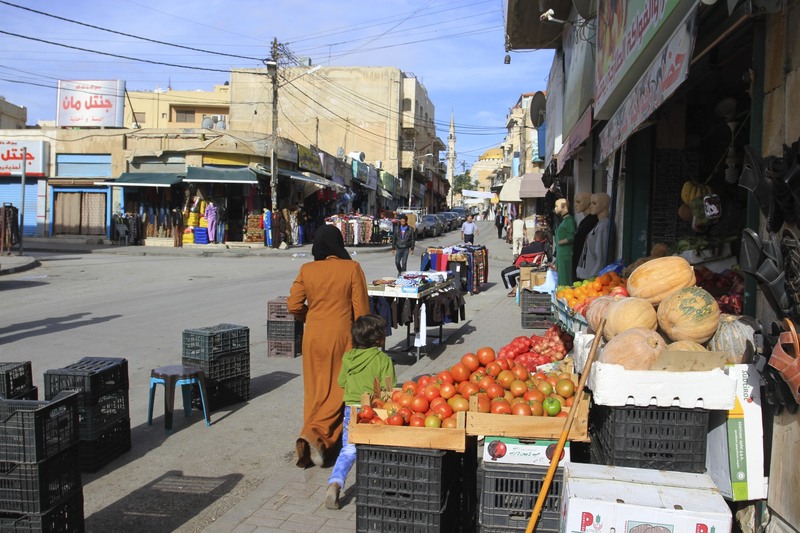 Madaba doesn’t conform to our stereotyped image of the Middle East. A third of its population is Christian, tolerance is a watchword of the city, and alcohol can be bought in shops. 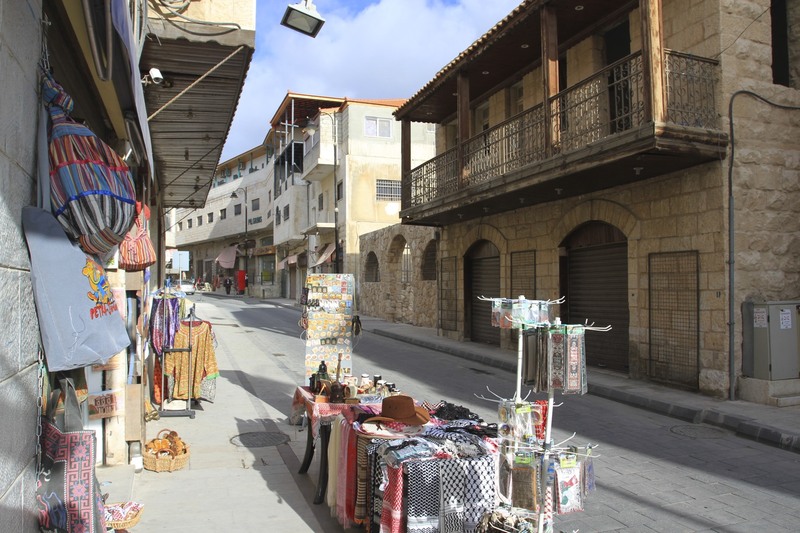 It’s a busy market town but pretty laid back – unless you happen to be driving through it at rush hour – and has a restaurant, the Haret Jdoudna, to rival any in the country. 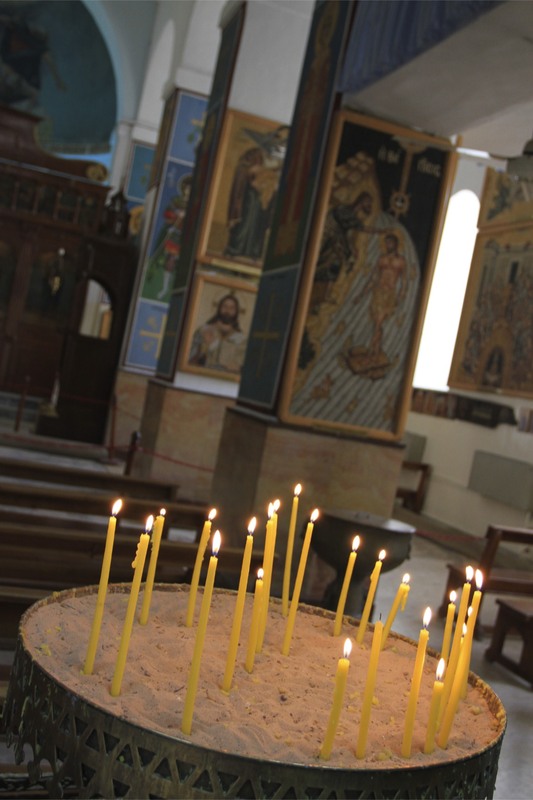 I was only going to spend a half day looking around the Byzantine churches and their famous floors, but the atmosphere of the town was so enjoyable I decided to spend a couple of nights. It also meant I could explore the town more leisurely on foot, and spend a bit more time visiting the many Byzantine sights. Leaving St. George’s Church behind, I walked around the streets trying to find the enigmatically named Burnt Palace. 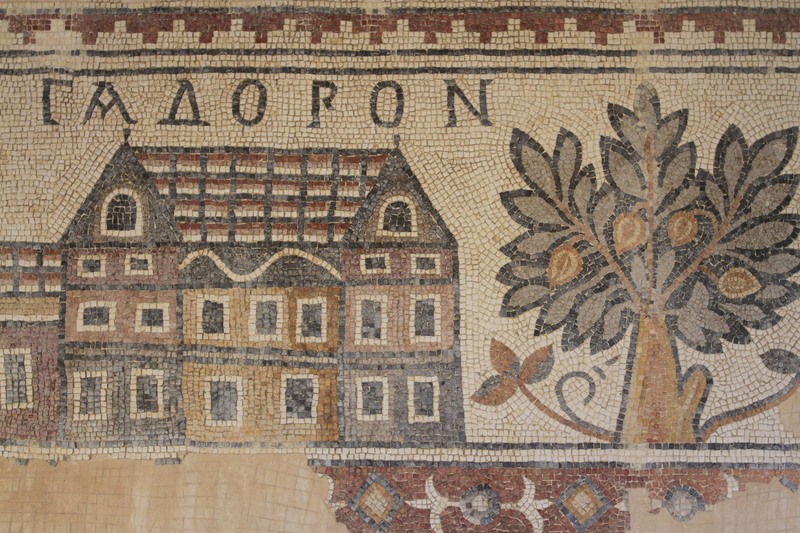 A luxurious Byzantine residence that must have been owned by someone of great wealth, the Burnt Palace has its own mosaic floor. Sadly there is little but foundations left of the rest of the building. 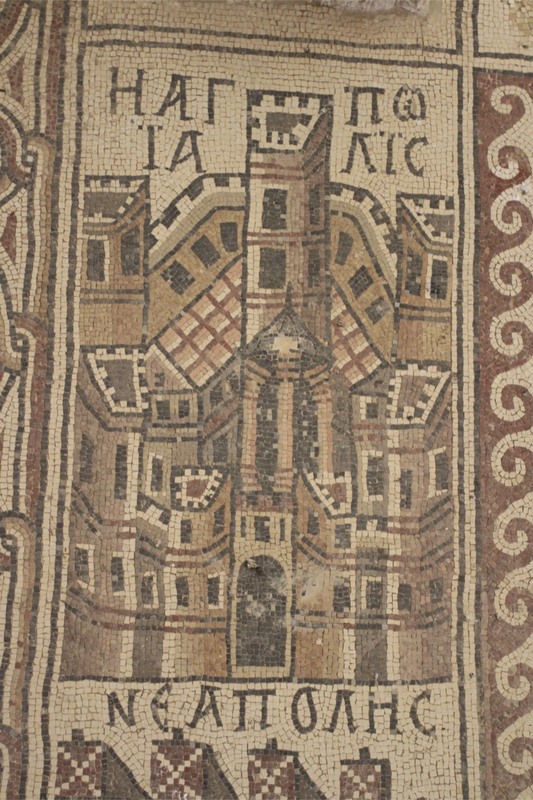 The Burnt Palace gets its name from the fact that when the mosaic was discovered it was covered in black ash from a fire. 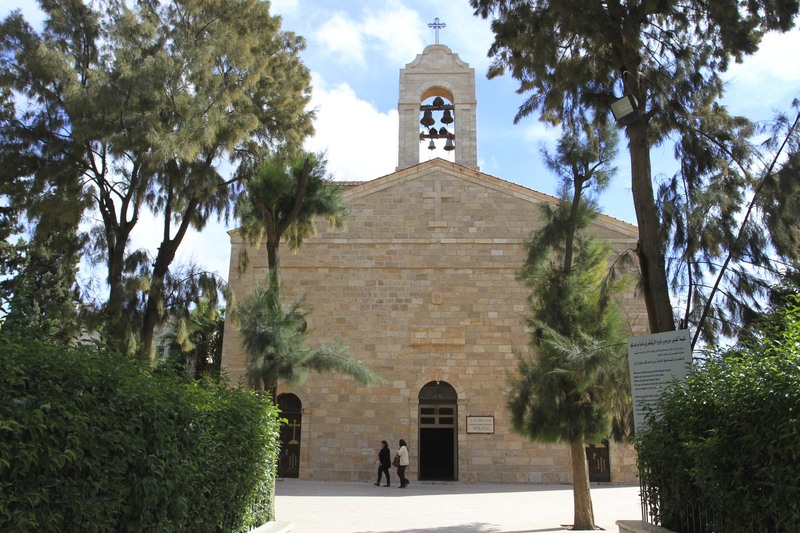 It sits next to the Church of the Holy Martyrs which has a wonderful mosaic floor covered in a profusion of people, deities, plants and wildlife, including camels and wild beasts. 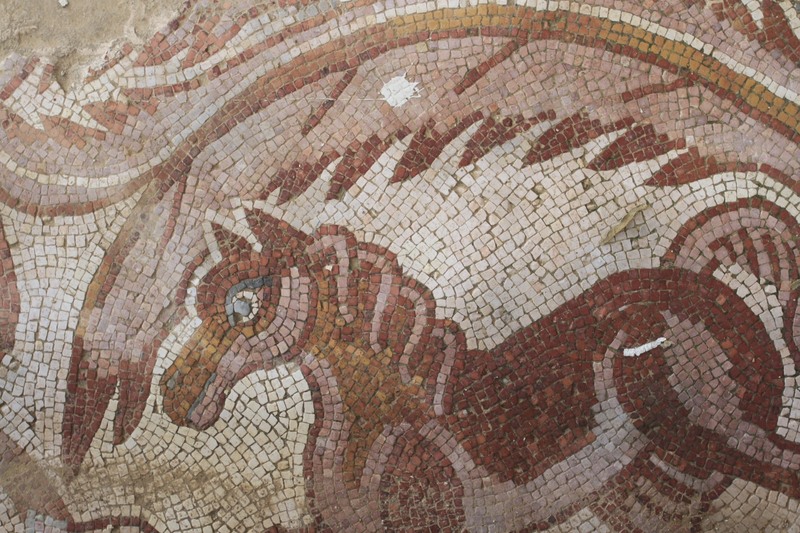 The mosaics feel a bit unloved and could do with some cleaning and maintenance, but at least there’s good information on them. 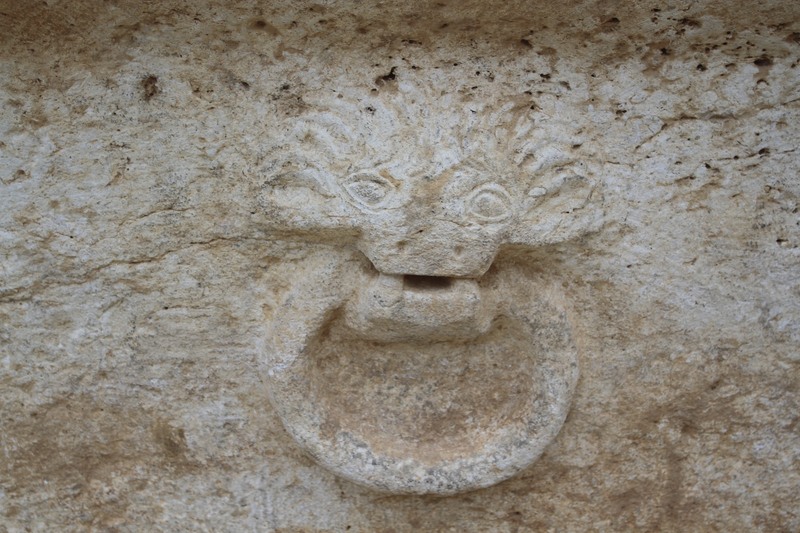 Time and earthquakes have not been kind to Umm er-Rasas. 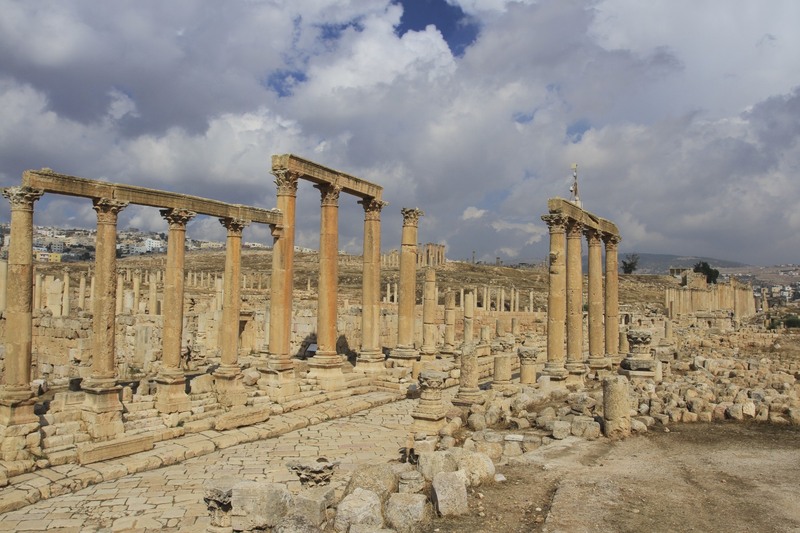 Much of this ancient city lies in ruins. Little but arches of collapsed buildings, surreally rising out of the rubble, walls and doors are left to tell of the glories of its past. 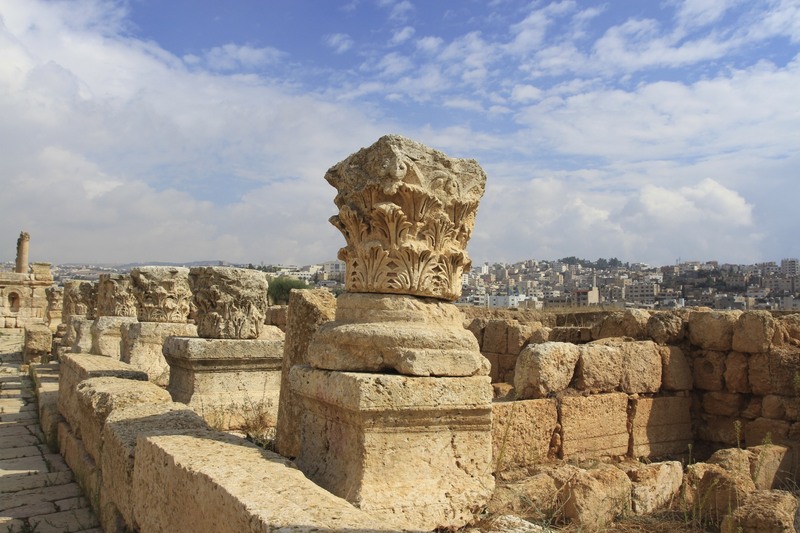 For all this, wandering through the remains of a city that has played host to Roman, Byzantine and early Islamic societies is an atmospheric experience. 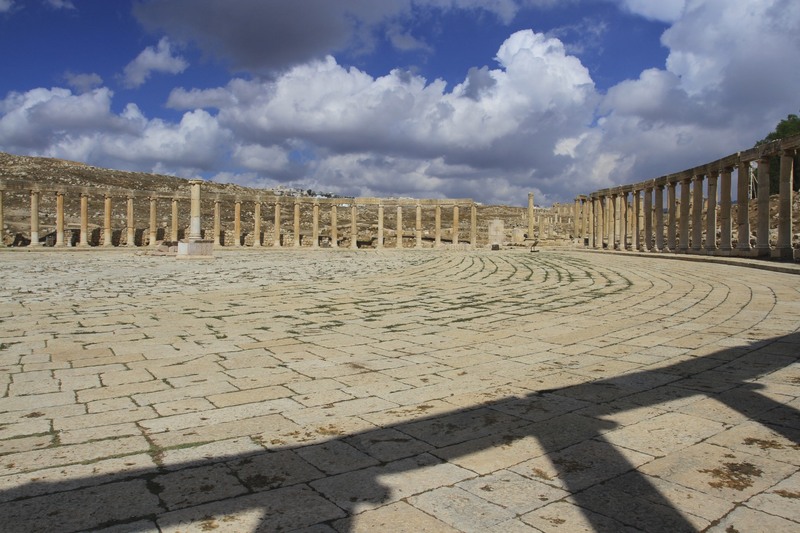 I arrived in the early afternoon and, even though this is a UNESCO World Heritage Site, there was no one else here. The visitor centre looked like it had been built to accommodate tour groups and packs of archaeology buffs who never materialised. 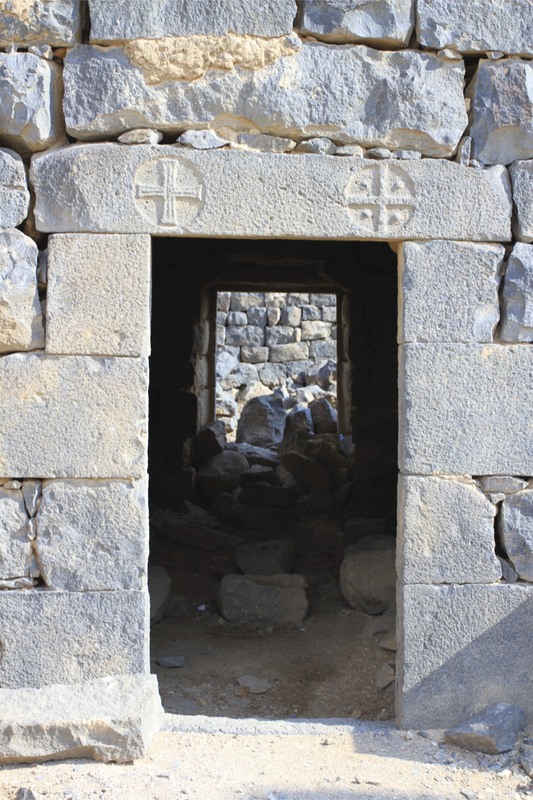 The ticket office was abandoned and covered in a thick coat of dust, the gates leading to Umm er-Rasas were wide open. 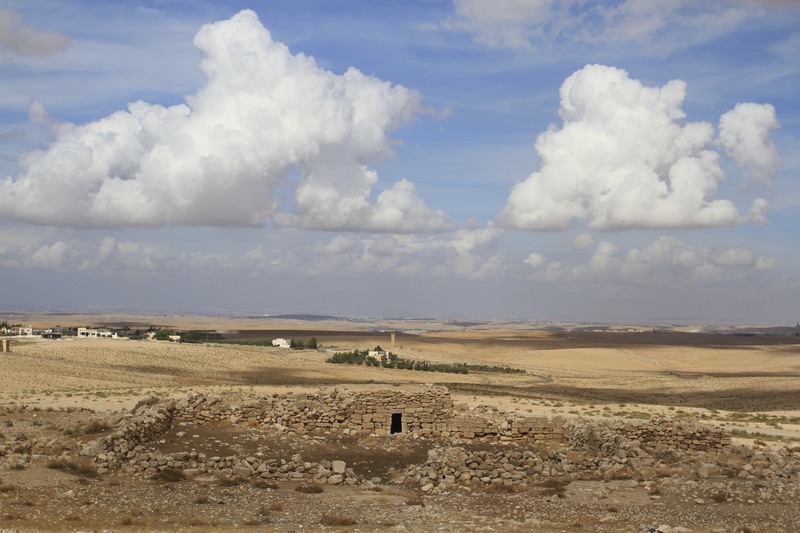 I walked down the path to a small hillock that gave me a view over the site, which sits majestically on a wide plain that once supported this entire city. 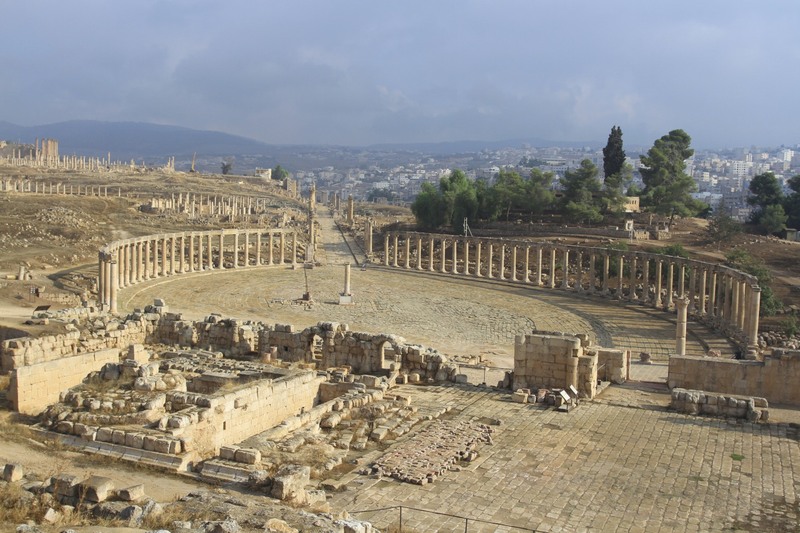 It’s unfortunate that the UNESCO money appears to have run out and the vast majority of the city has not been excavated; while some excavated mosaic floors have been covered in plastic and sand, but are now exposed to the elements. 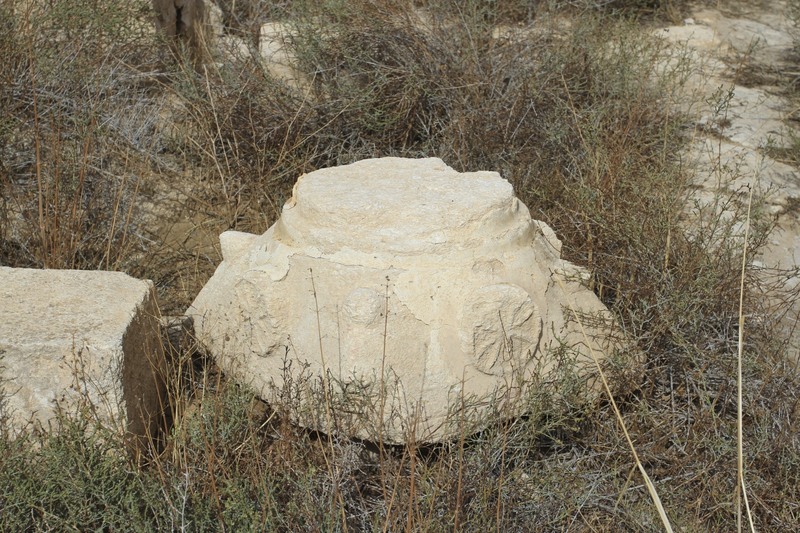 Excavations only began at Umm er-Rasas in 1986, but they almost immediately uncovered a treasure trove of historic artefacts. 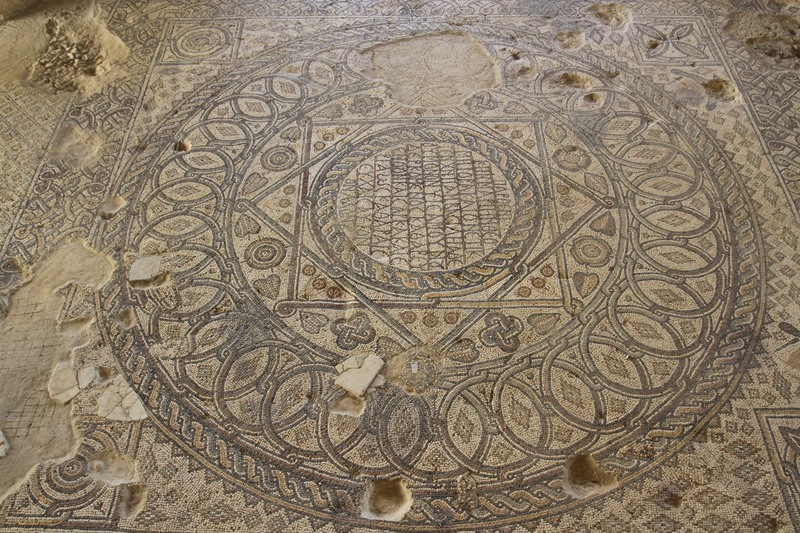 The highlight of which is undoubtedly the mosaics covering the floors of numerous Byzantine churches found at the site. The most impressive of these is the Church of St. Stephen which, despite being sheltered under an impressively ugly metal hanger, is simply beautiful. 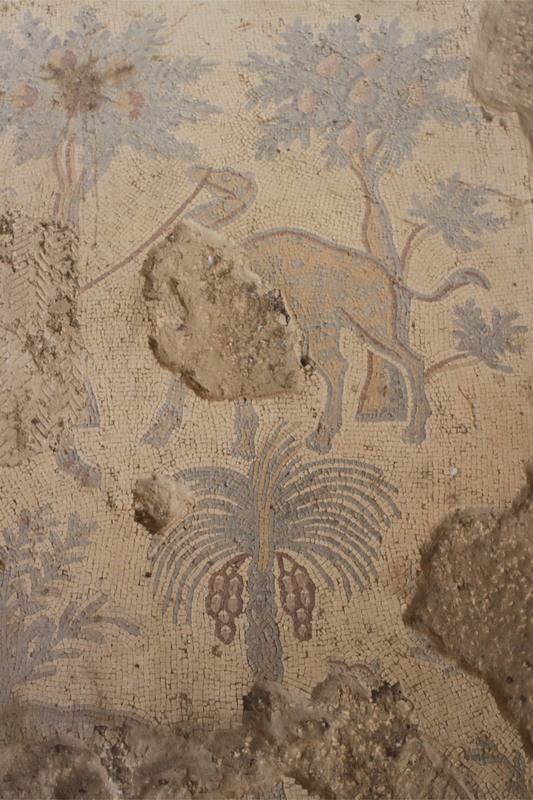 The mosaics of St. Stephen’s show scenes of every day life: hunting, fishing, farming, riding an ostrich. 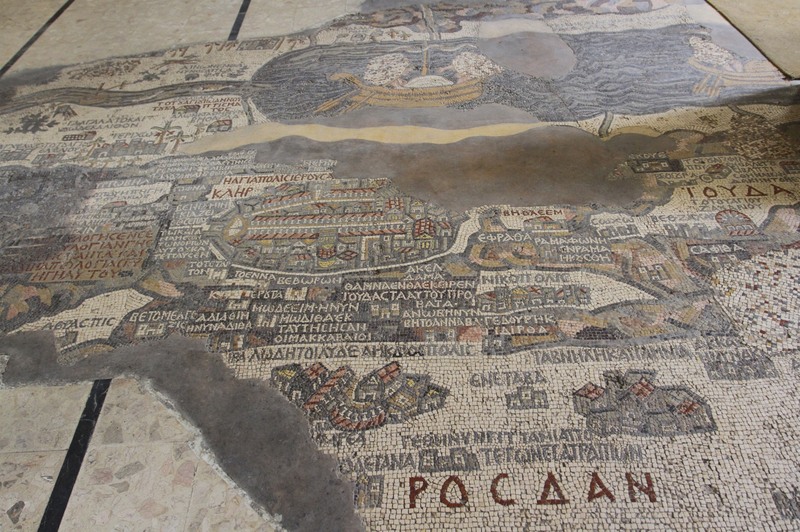 Most impressive though is the large panel that depicts ten towns from the region, including nearby Madaba, Amman (then known as Philadelphia), Gaza, Jerusalem and Umm er-Rasas itself. It’s a thing of great beauty. I visited St. Stephen’s Church and the nearby Church of Bishop Sergius before heading into the ruins of the old walled city. 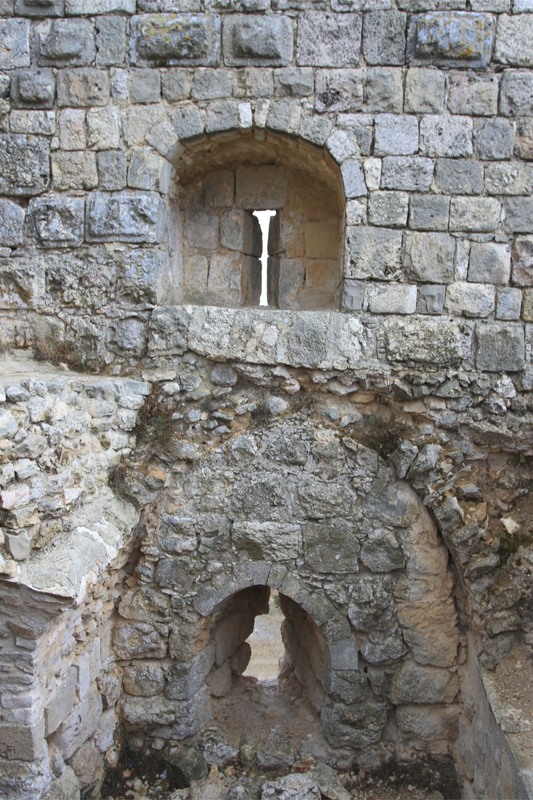 There are no signposts or information boards at the site (which is a bit rubbish for a UNESCO World Heritage Site), so it was pure luck that I managed to stumble upon two churches built into the thick defensive walls of the city. The evocatively named Church of the Rivers and Church of the Palm Tree are wondrous to behold. 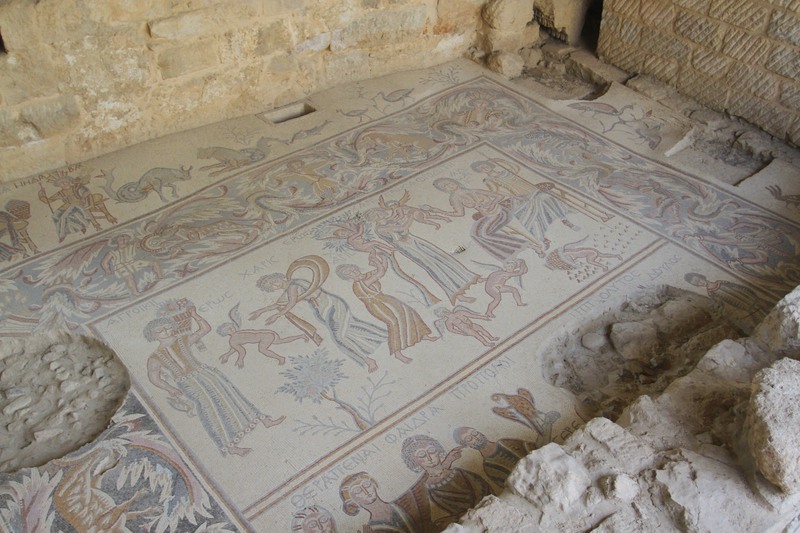 They have some small unprotected mosaics on their floors, but as I walked around it was the carvings of early crosses, old water troughs, door frames and other signs of human occupation that were most moving. I stopped, sat on a rock and tried to drink in the atmosphere of this ancient place. 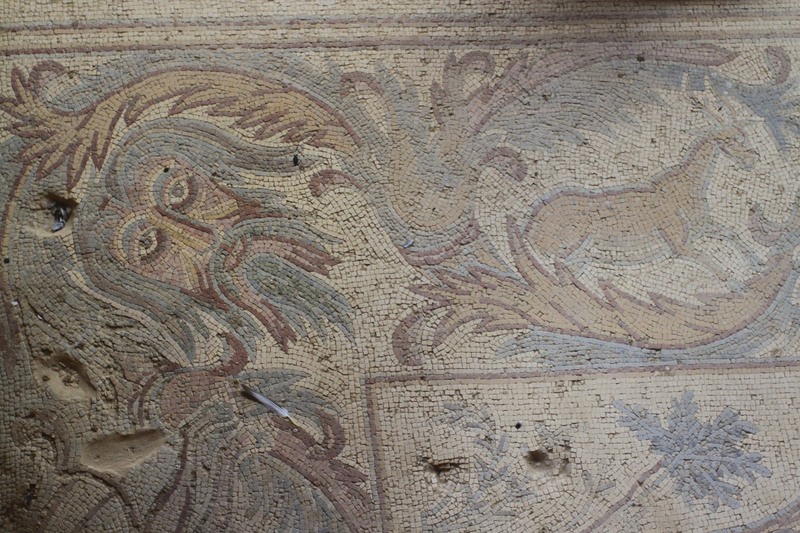 I spent a fascinating hour or so doing my best Indiana Jones impersonation, cambering over partially collapsed buildings, discovering mystical carvings in the stones of former houses, and finding another couple of semi-preserved churches with more mosaics. It was fabulous, but also a little tragic. 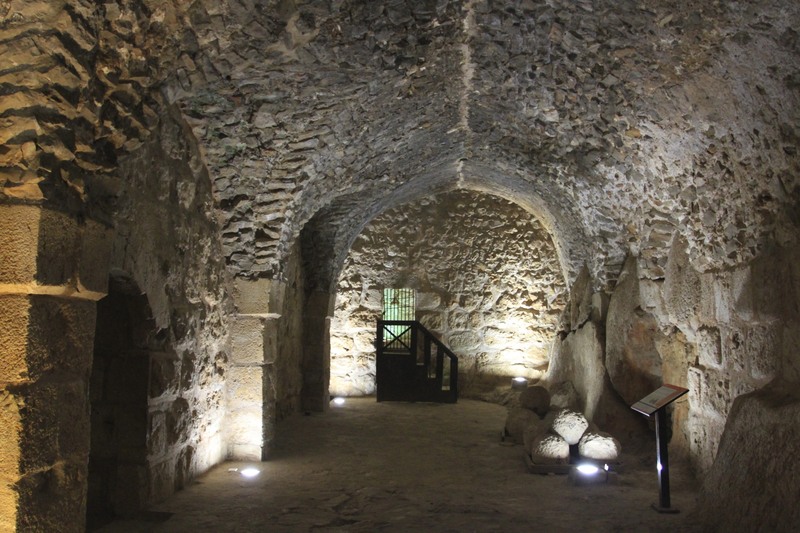 I hope that one day soon there will be enough visitors to justify reopening the ticket office, and restarting the work of excavating and conserving. 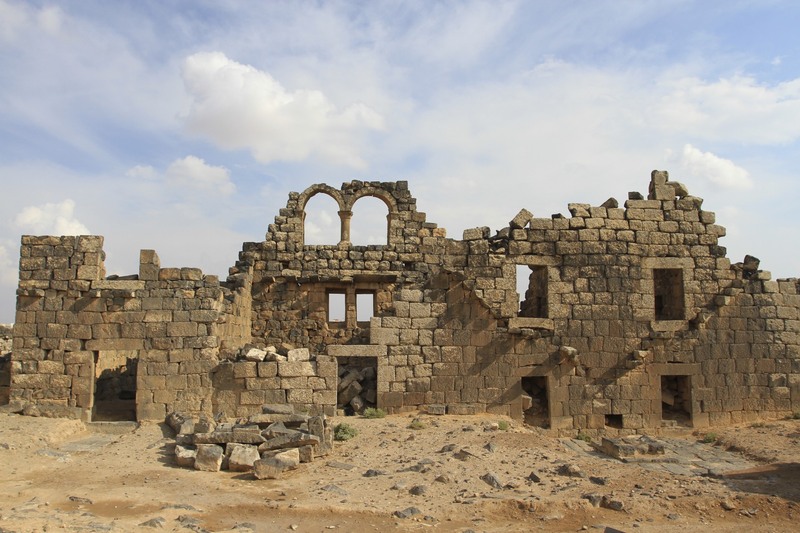 Jordan only has four UNESCO World Heritage sites. 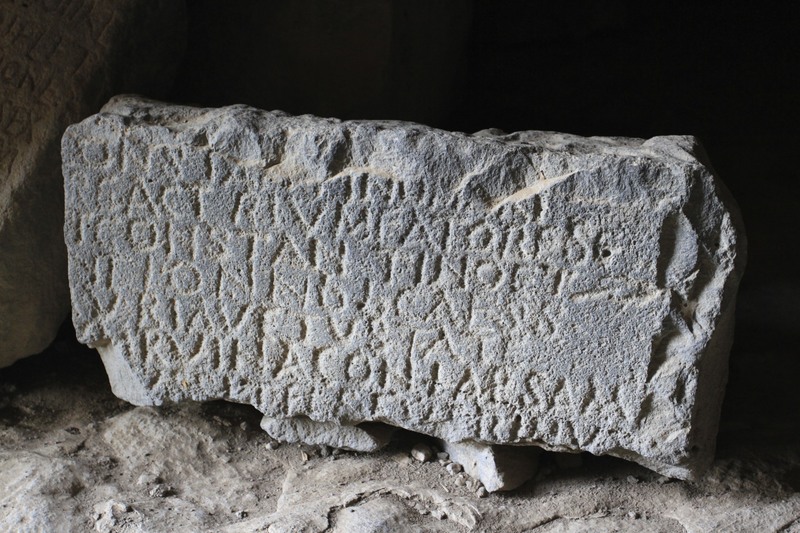 Ask people to name them, including myself before visiting Jordan, and it’s unlikely that many will get past Petra. Some people might guess Wadi Rum, but that’s not a given. 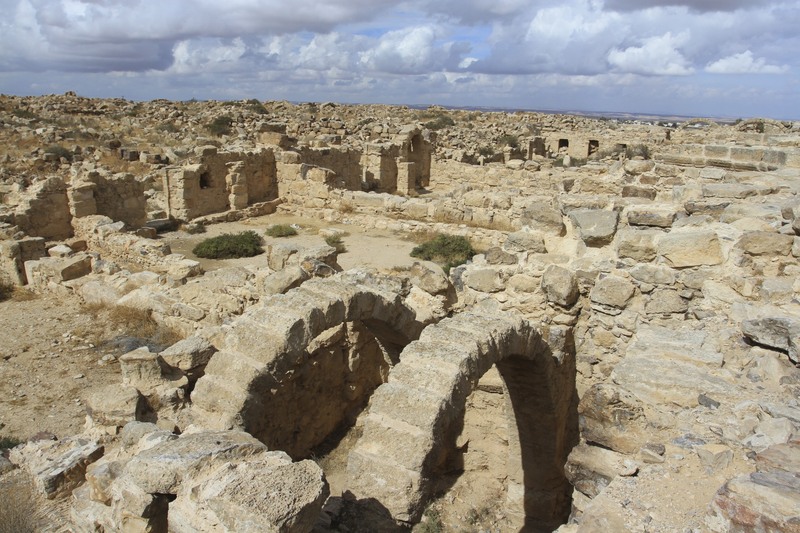 Almost no one would think of Umm er-Rasas, the extraordinary Roman fort that grew into a thriving Byzantine town with sixteen churches. Almost no one, including myself (again), has even heard of Umm er-Rasas. 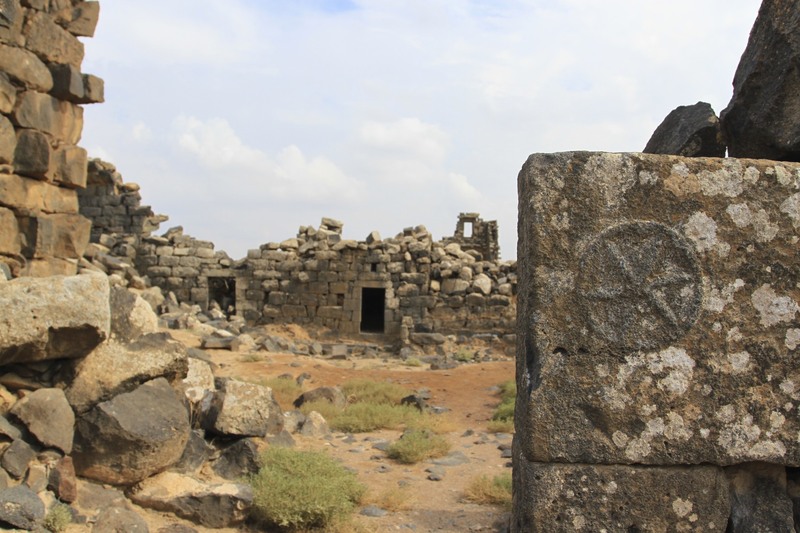 This might explain why, in what is supposed to be Jordan’s busiest tourist season, I found myself walking around a World Heritage Site entirely on my own. 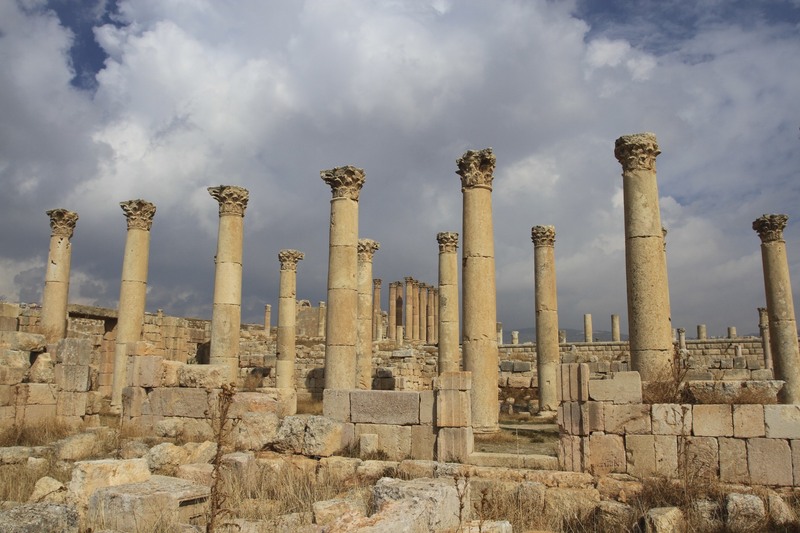 To be able to wander alone amongst the atmospheric ruins of this once magnificent city was fantastic for me, less good for the livelihoods of Jordanians. When I arrived there was only one car parked outside the shiny new visitor centre. It belonged to the security guard who gave me a wave and then disappeared. I asked the woman running a tea stall where I could get tickets, she just waved me towards the entrance. There was no fee to visit Umm er-Rasas. Seriously, it doesn’t cost a penny to visit and there still weren’t any tourists. 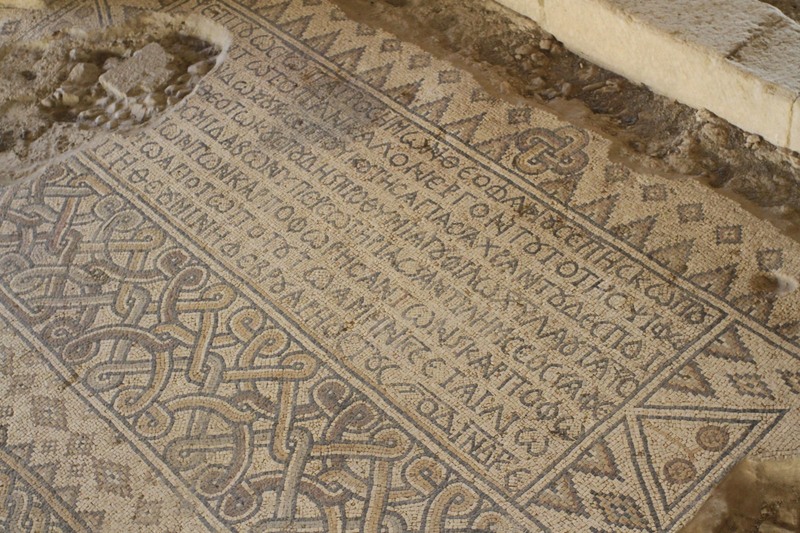 I walked back out into the glare of the Jordanian sun and headed towards St. Stephen’s Church, one of the most famous in Jordan thanks to its wondrous mosaic floor…but I’m getting ahead of myself. 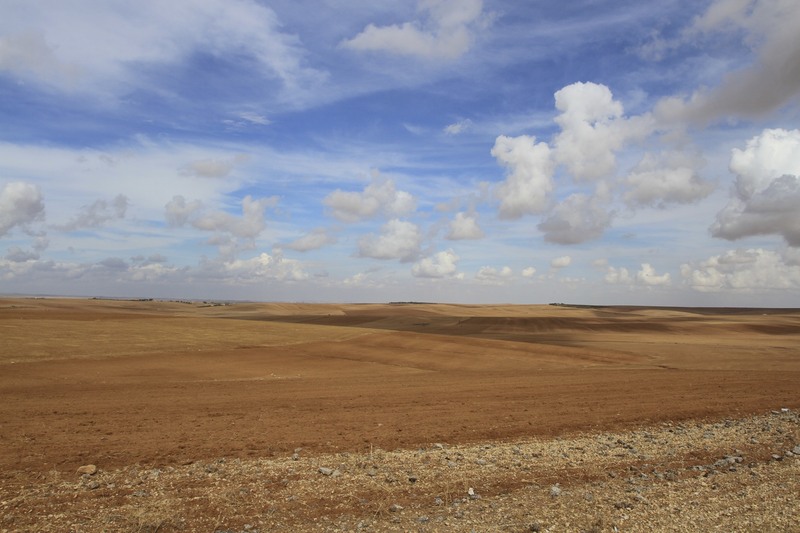 Before arriving at Umm er-Rasas I’d been driving around the countryside trying to find it. The road signs which had reassured me I was going in the right direction had become increasingly scarce and then non-existent. Luckily, while I was stopped by the side of a road in a small village, a gang of young army recruits came spilling out of a building and were delighted to help me out. One who spoke good English said something I didn’t understand about a ‘tower’, thinking nothing of it I set off again. Half an hour later I screeched to a halt on the road after passing a very faded brown ‘tourist’ sign which simply said, ‘To the Tower’. This couldn’t be coincidence. I reversed the car and set off down a side road. I didn’t see the Tower at first, I was distracted by a pile of ancient rubble in another field. 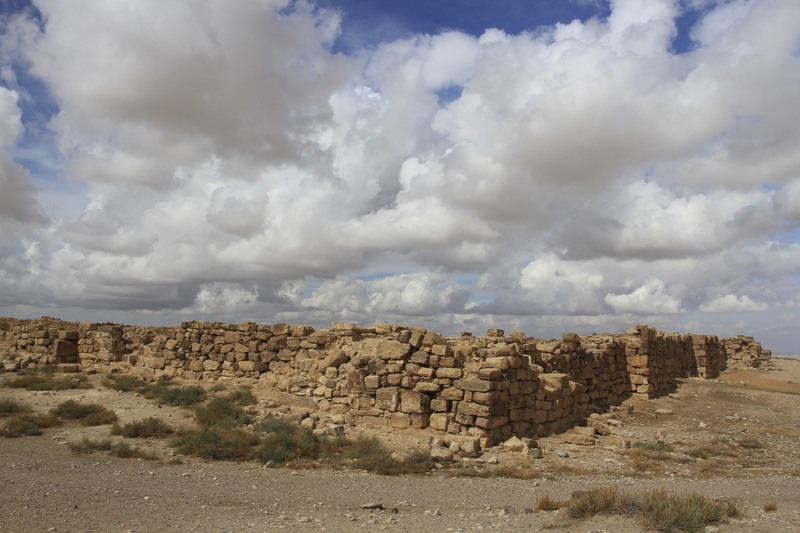 Cursing yet another wasted side trip thanks to the Jordanian Tourist Board’s tendency to signpost every pile of old stones as a tourist attraction, I started to turn the car around. It was then I saw the Tower. No mistaking it, this was a tower. It looked old, very old. 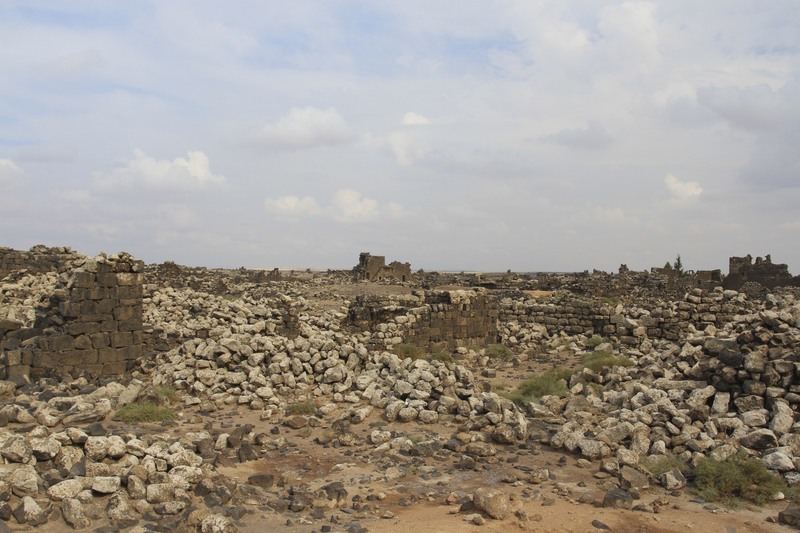 There were the remains of some other buildings nearby, a camel wandered across to investigate my arrival, but nowhere could I find any information telling me what the Tower was and why it was here. 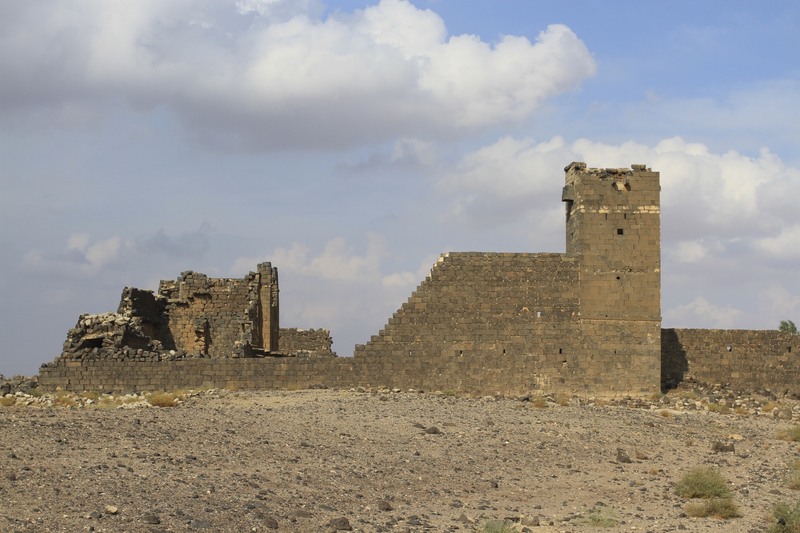 Was it a watchtower to spy enemy troops? Was it used to gaze at the stars? 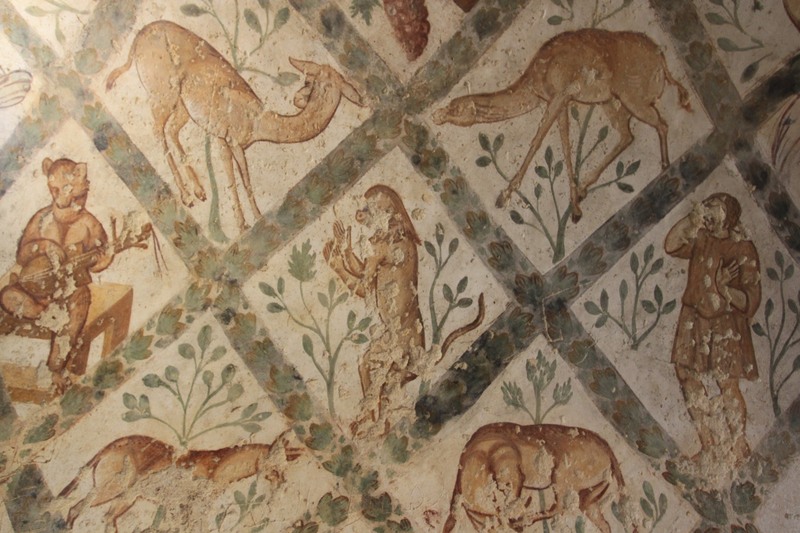 The camel remained enigmatically silent on the issue. 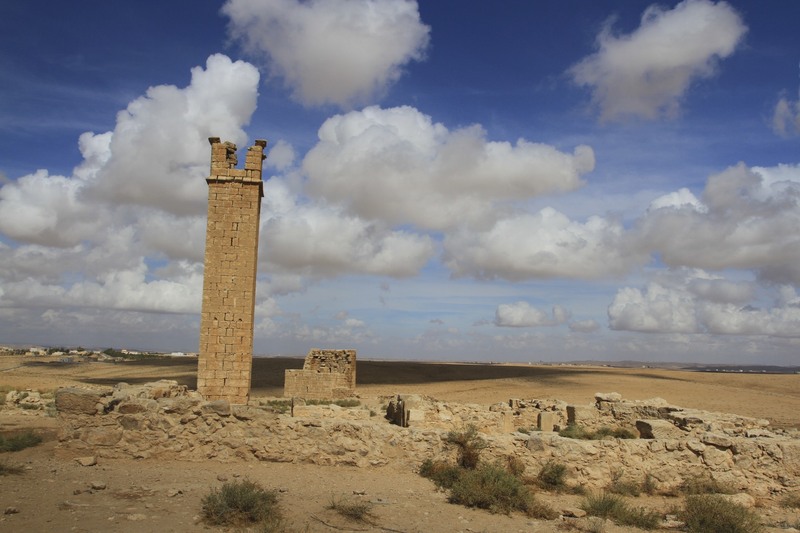 I took some photos, shooed the camel away from the car and walked around the tower. This is when it got interesting. There was a doorway but there didn’t appear to be any stairs. Why would someone build this thing in the middle of nowhere? 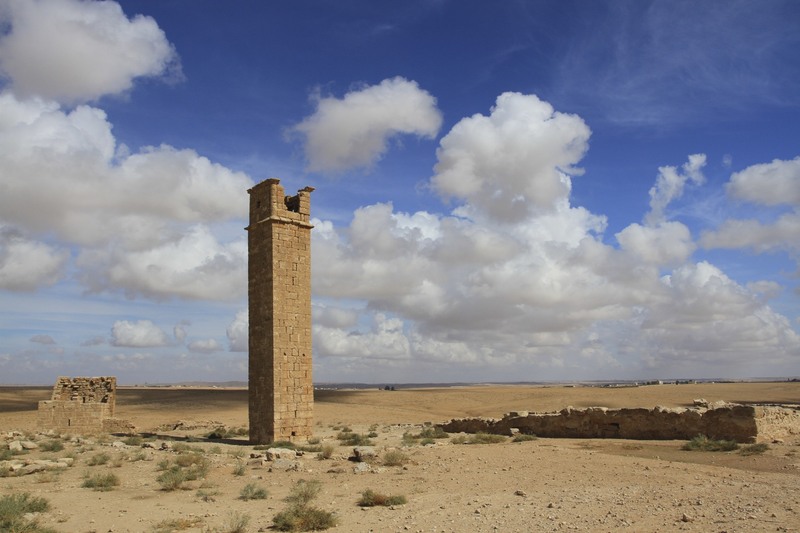 I didn’t yet know it but the Tower was less than a kilometre from Umm er-Rasas. 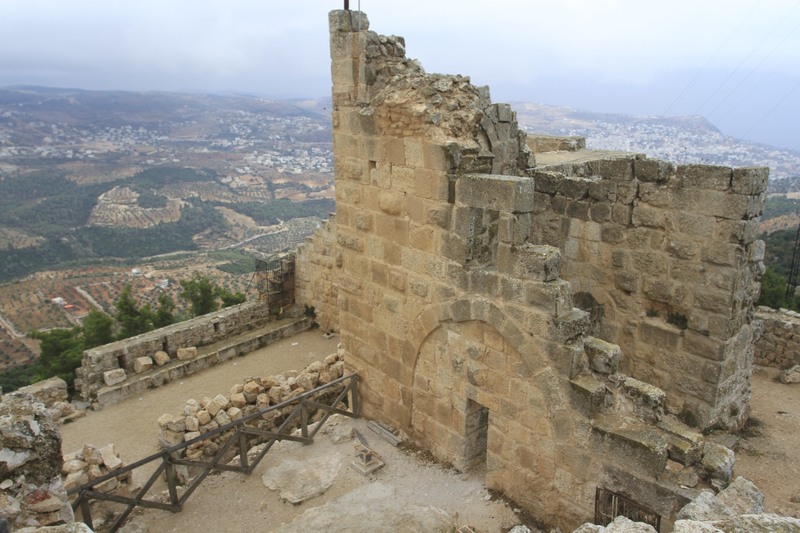 It was only later that I discovered the Tower belonged to the Stylites, Christian ascetics who enjoyed spending time contemplating life from the top of a tower or pillar. 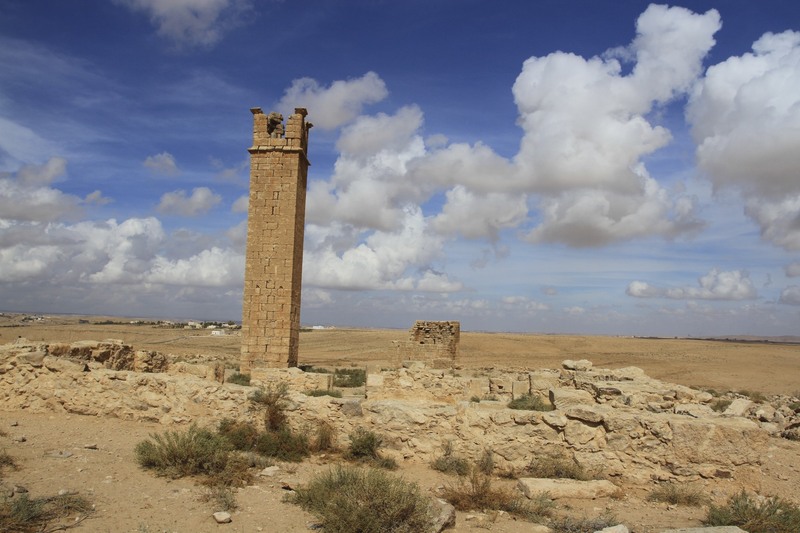 It sounds like something Monty Python would make up, but the Stylites are named after the first pioneer of tower dwelling, Simeon Stylites the Elder. 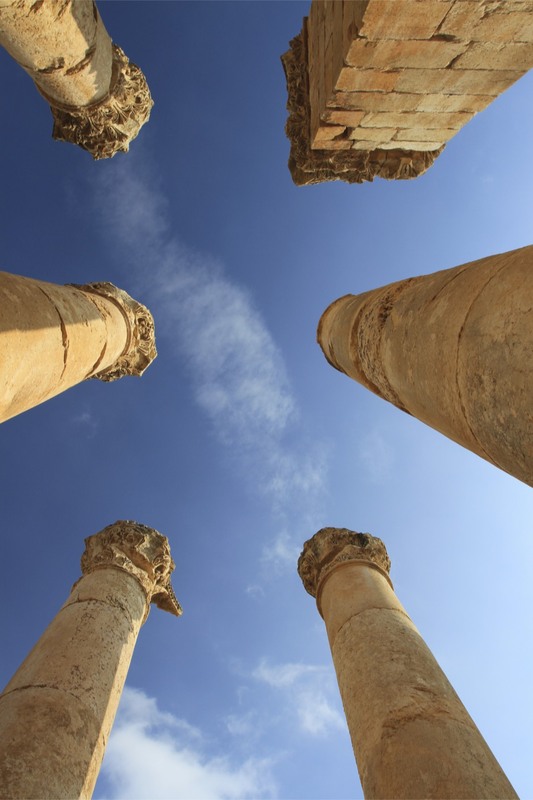 I’m not sure if he still holds the record, but the Elder Simeon apparently spent 37 years living on top of a pillar somewhere in Syria. 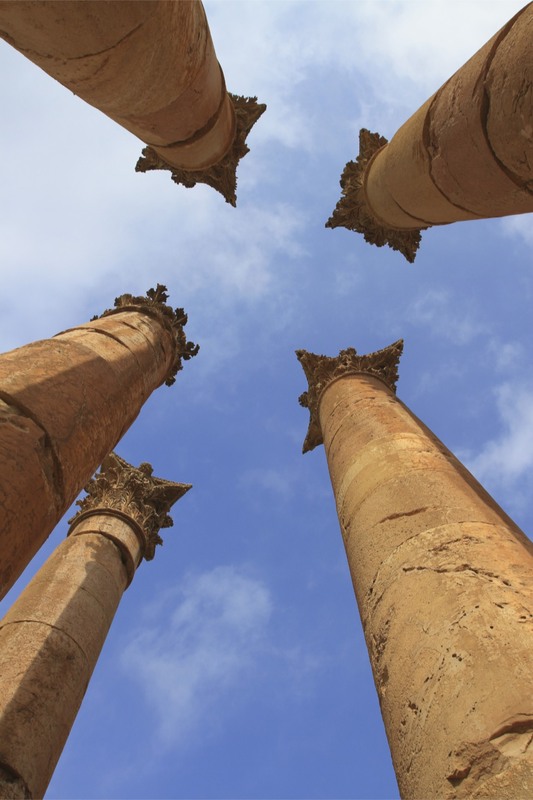 It wasn’t long before self-proclaimed copycat Stylites were climbing up towers and staying there for prolonged periods of time. 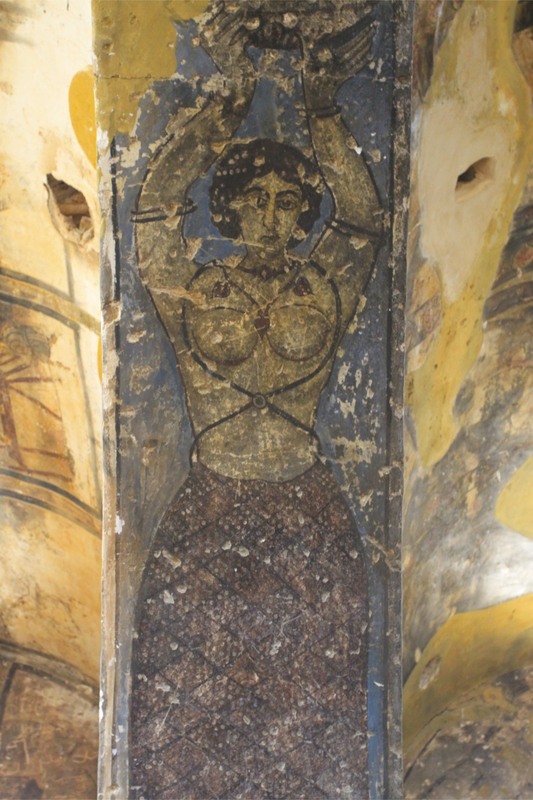 The trend peaked early in the Byzantine period, which corresponds to when Umm er-Rasas reached its pinnacle (so to speak).